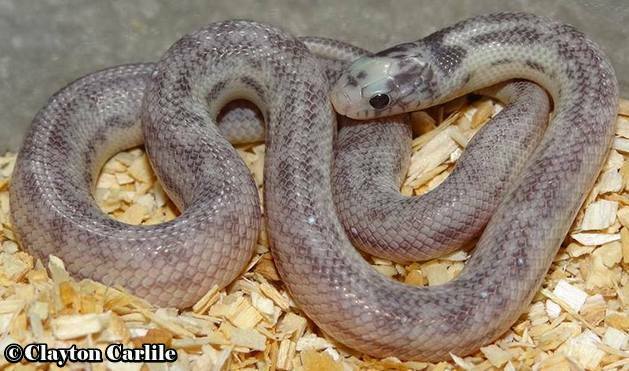 These are morphs that were created through selective breeding or with unknown origins. 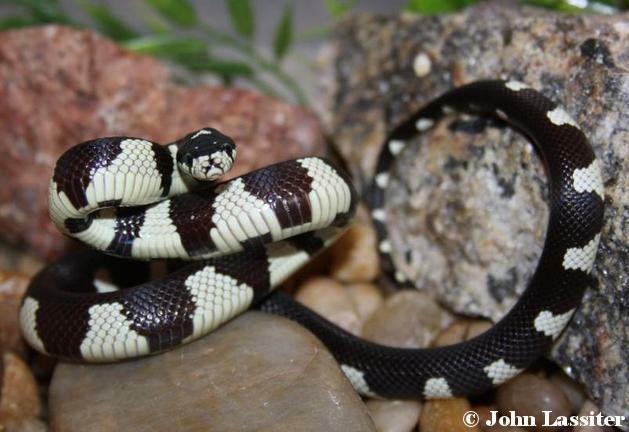 I’m assuming these terms were made up long ago by Southern California herpers to describe the two different color types found down here, but these color types are found all over the California kingsnake’s range. 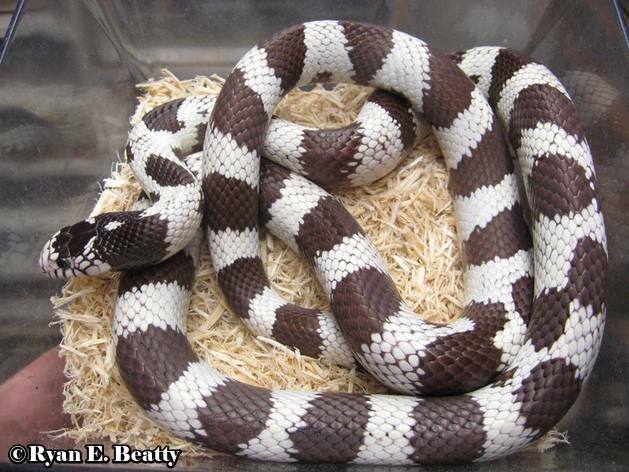 These terms are always used to describe the light colored markings and they are more often used to describe normal banded types. 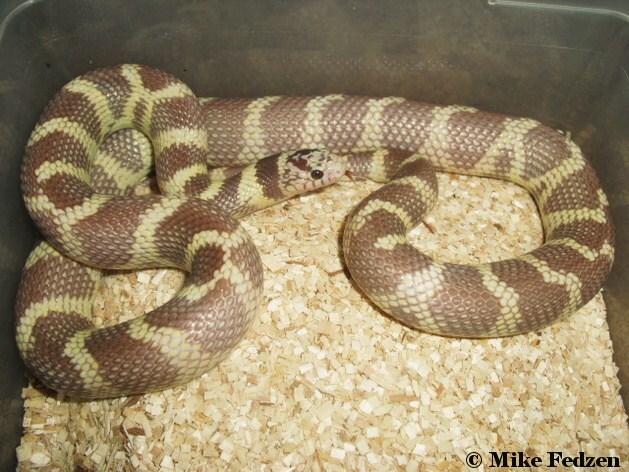 A coastal phase Cal king is generally yellow and brown. 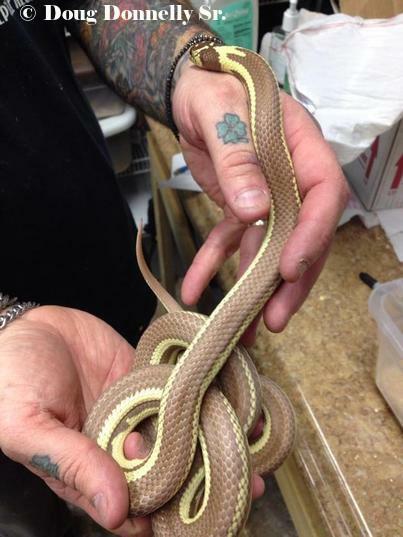 The yellow can be just as variable as the brown. 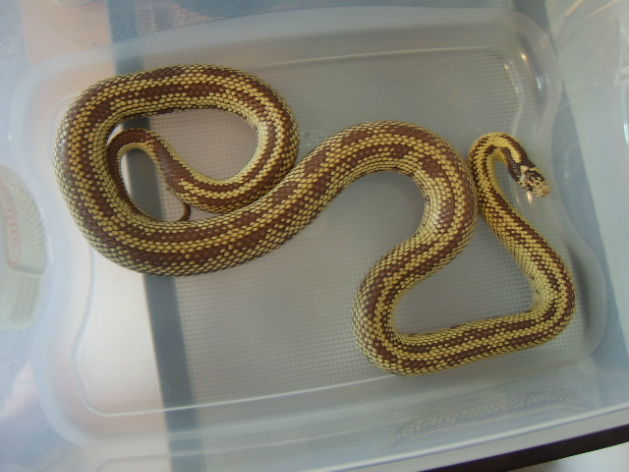 Yellow can also intensify or dull out from juvenile to adult. 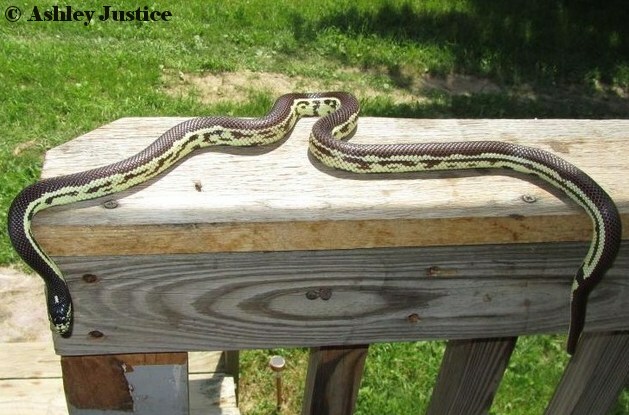 Some specimens may look two toned, by having yellow on the top and upper sides and white on the bottom and lower sides. Like the desert phase, they have their own range. 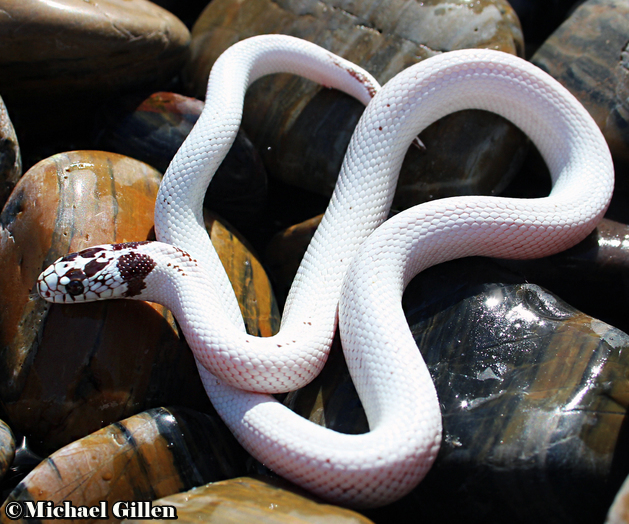 Sometimes specimens with white coloration that could be considered desert phase on looks alone, can turn up well into the coastal phase range. It is unknown why this happens. 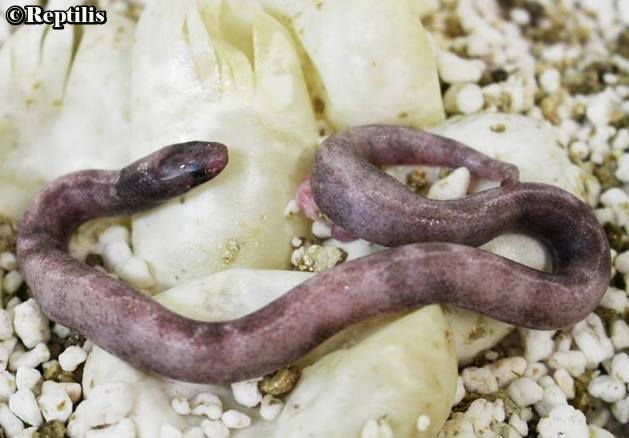 Perhaps these individuals are axanthic, but so far I haven’t heard of anyone taking one and test breeding it. 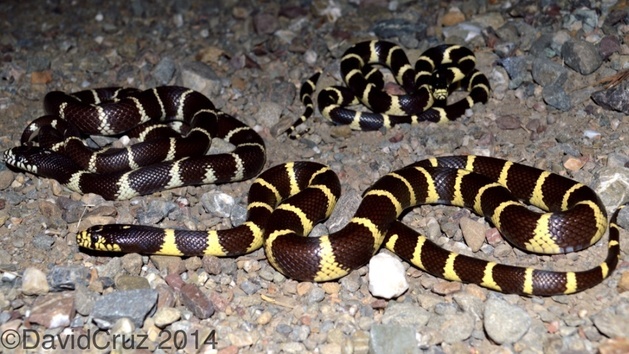 I know of no yellow type specimens turning up well into desert phase range. 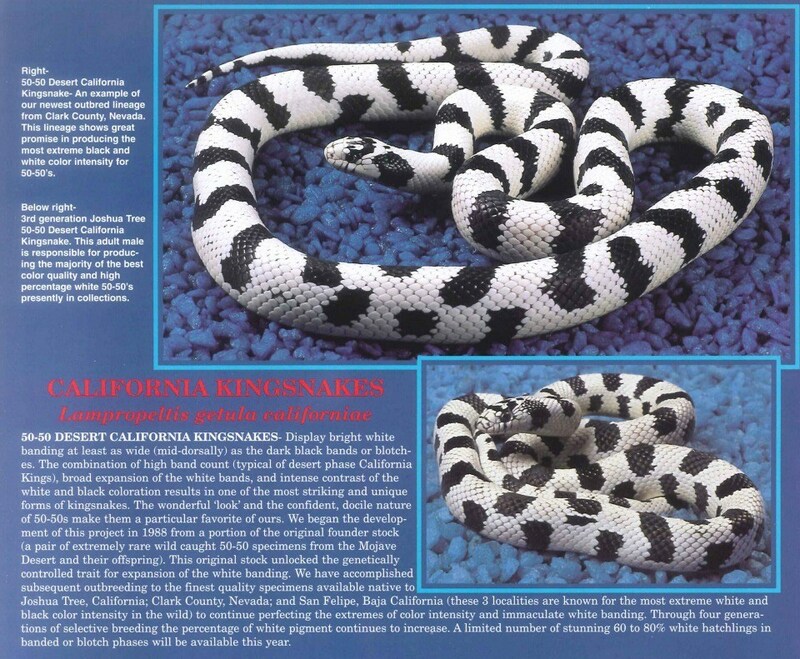 Desert phase Cal kings are always described as black and white, which is misleading to people that don’t know Cal kings very well. 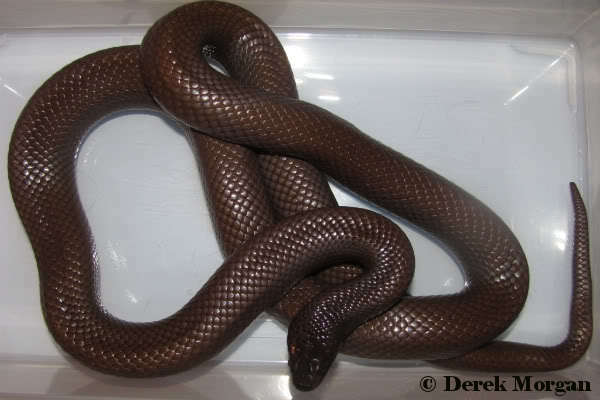 Its misleading in the way that they expect specimens to be black, not dark brown. 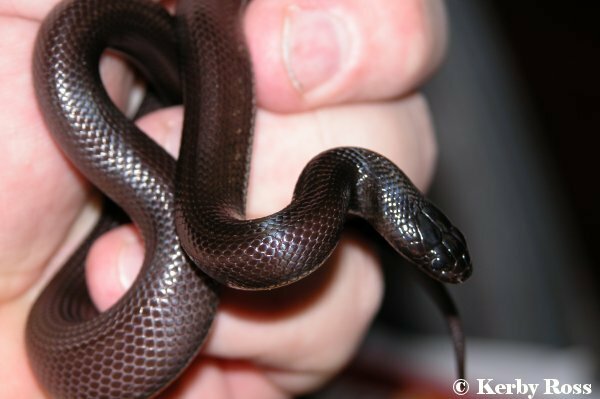 Only juveniles can be black. 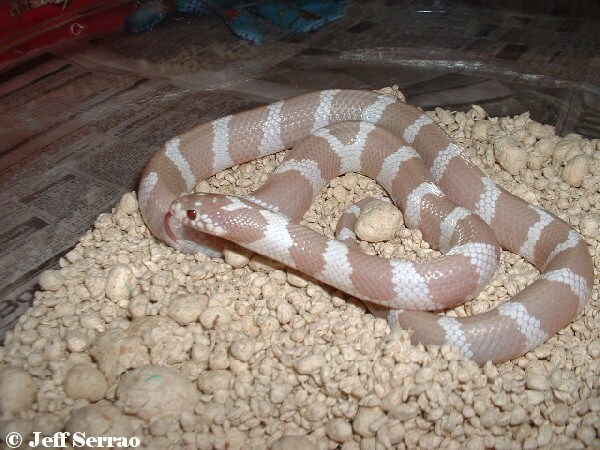 Desert phase is more referring to the white. 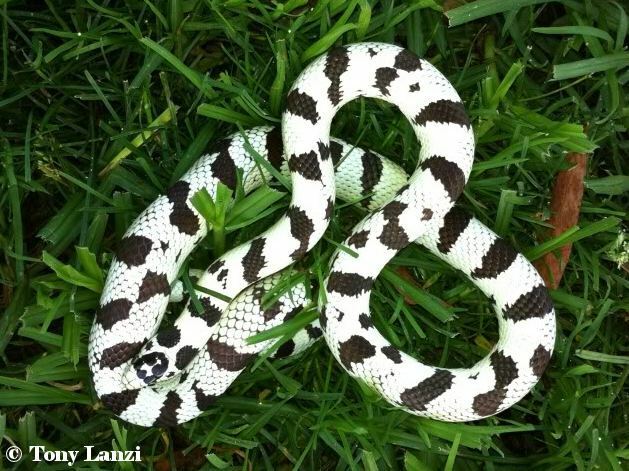 The white is also highly variable. 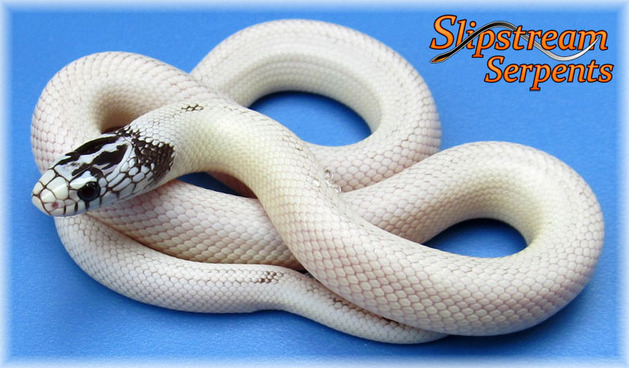 Its not always bright white, it can be cream or slightly yellowish. 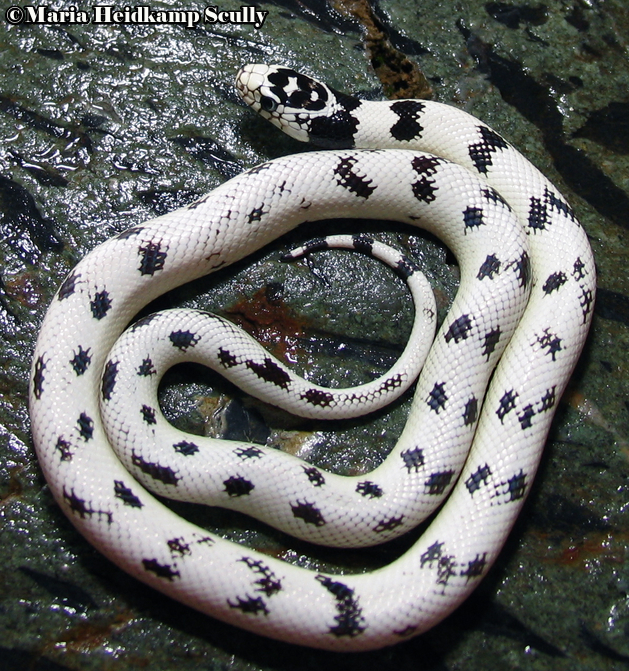 In fact most specimens that are white are only white on the upper sides and very top. 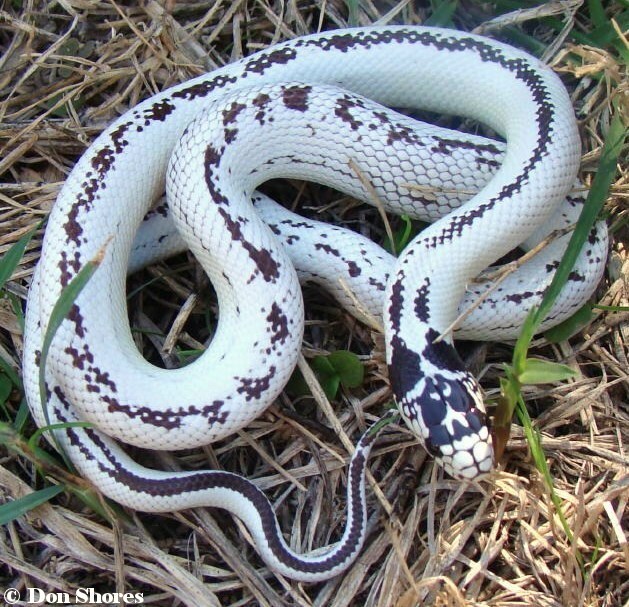 The lower sides and ventral scales are normally off white to a yellowish color. 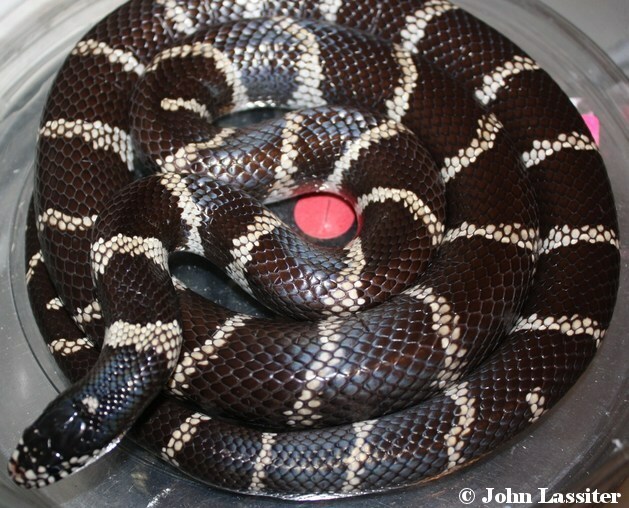 This can be evident in juveniles or may not show up until well into adulthood. In nature, there are areas where the desert and coastal phase meet and blend. Some of these areas can have both phases including intermediates. 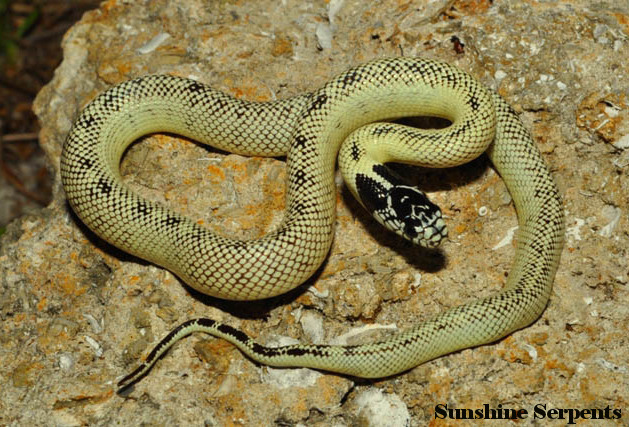 Some juveniles in these area that start off white, will develop a yellowish coloration into adulthood and this includes the top and upper sides. 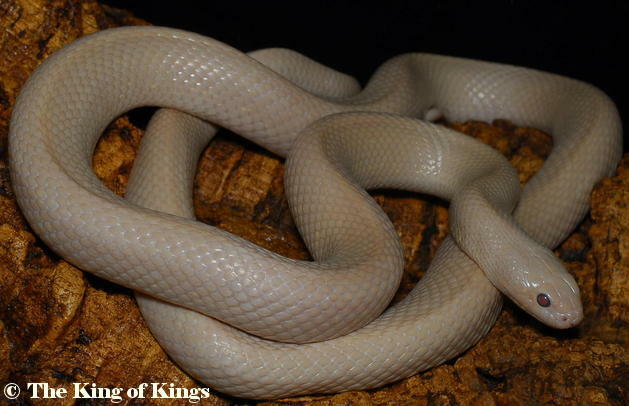 This happens too in captivity when people breed white colored kings to yellow colored kings. 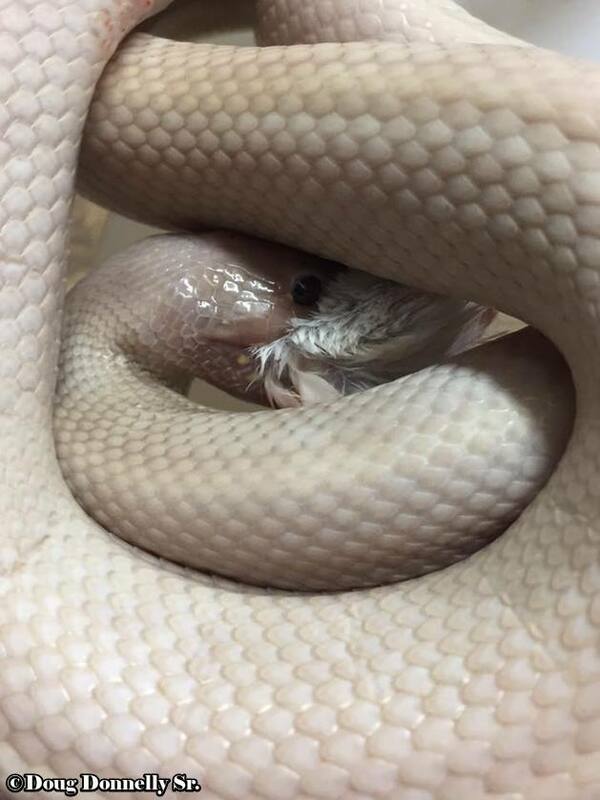 This can present a problem if a high white and banana king are crossed. 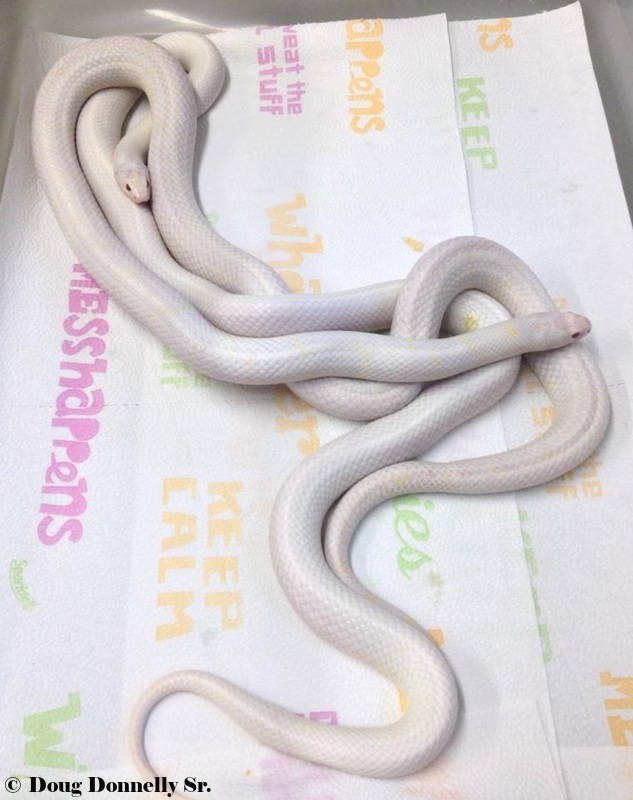 Offspring that appear white and are sold as high white, might develope yellow later on. 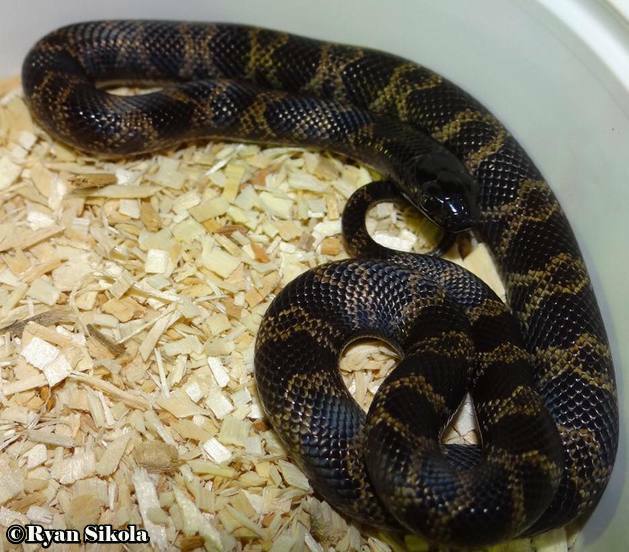 Unfortunately this happens a lot in captivity and it makes it difficult to get exactly what you are looking for. 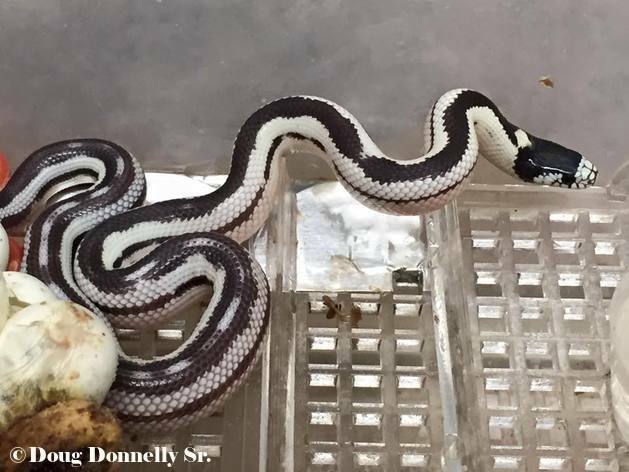 These were all found within 100 yards of each other in an area of Alameda Co.
where white banded and yellow banded meet and blend. 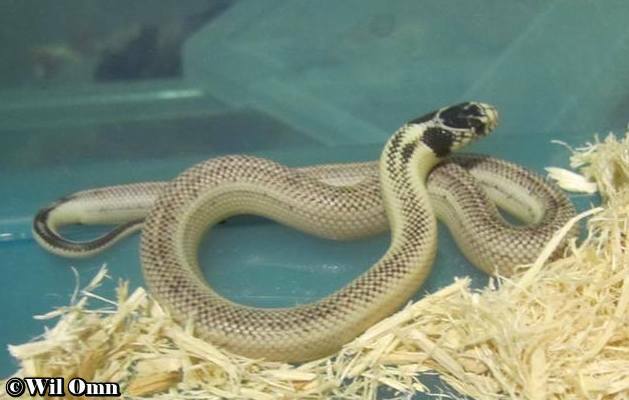 Around the early 1970’s, Frank Retes was responsible for creating these two man made morphs through selective breeding. 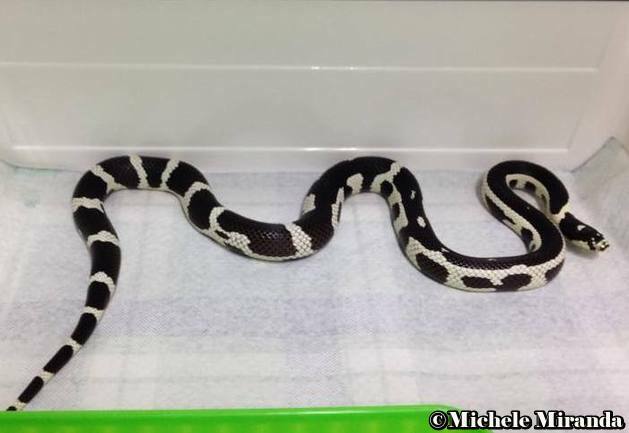 He started with a wild caught California City aberrant black and white female he obtained from Hermosa Reptile. 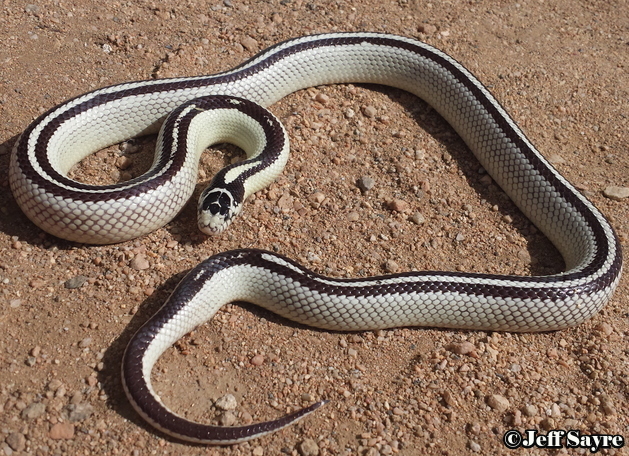 This female was a Western Mojave banded aberrant. 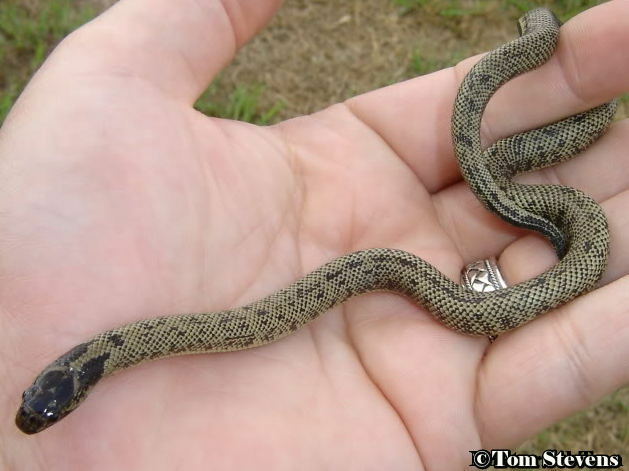 This natural occurring morph is described, along with pictures, in the Natural occurring morphs part 2 page. 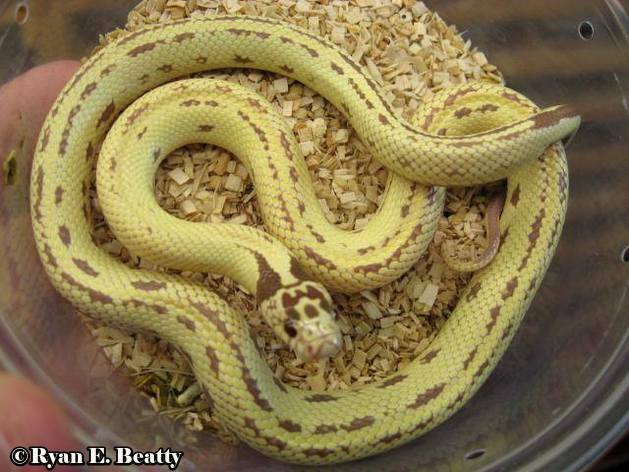 She was first bred to a Newport morph, which produced the first, what he called at the time, high yellows. 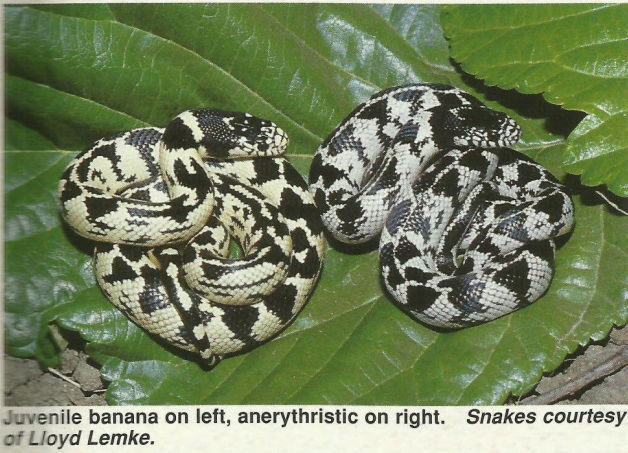 These would later be known as banana phase Cal kings. 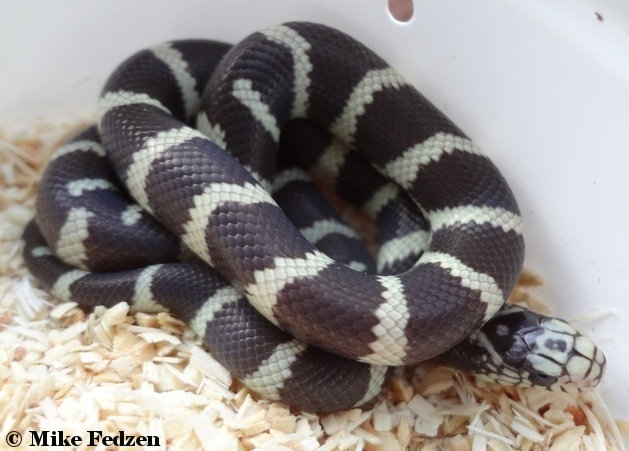 Frank kept them for a while then gave them to a good friend of his, who later sold them to Steve Osborne, who helped make them available and popularize them in the hobby. 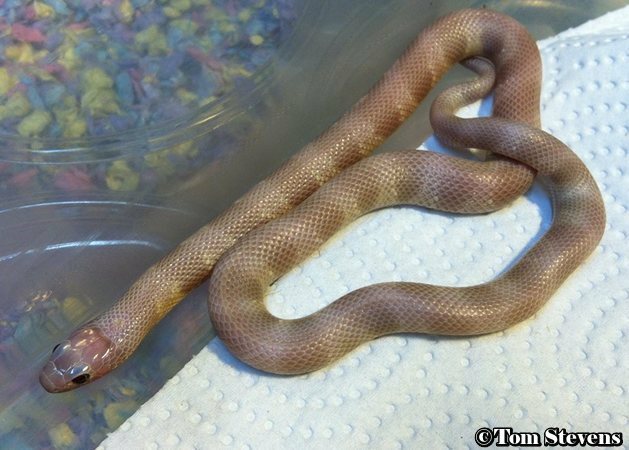 The best examples of bananas today are nothing like they were originally. 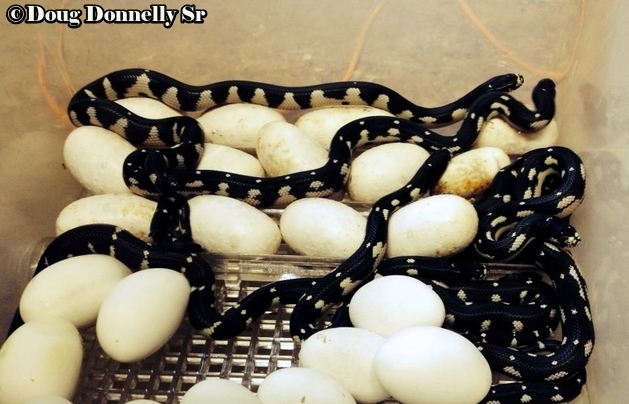 They are a product of many years of selective breeding. 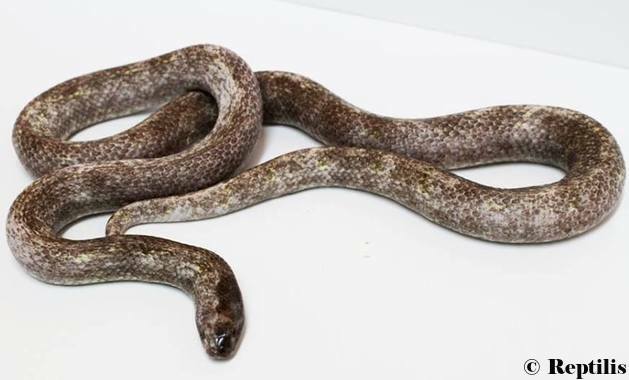 Now days the dark pattern has been almost completely reduced except for on top of the head and neck area and on top of the tail. 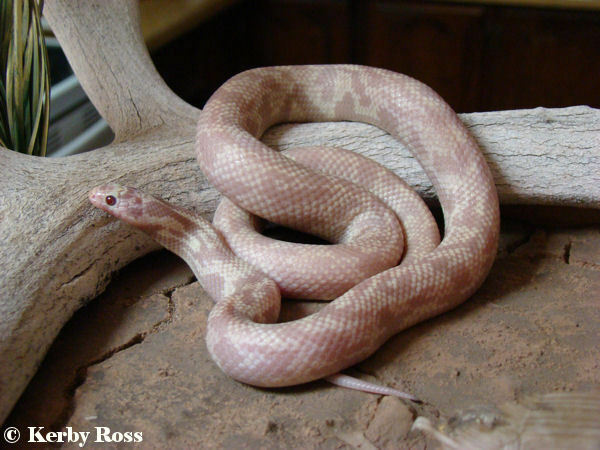 The high whites were actually a by product from Frank breeding his Western Mojave banded aberrant female to an albino, and line breeding for desert phase albinos. 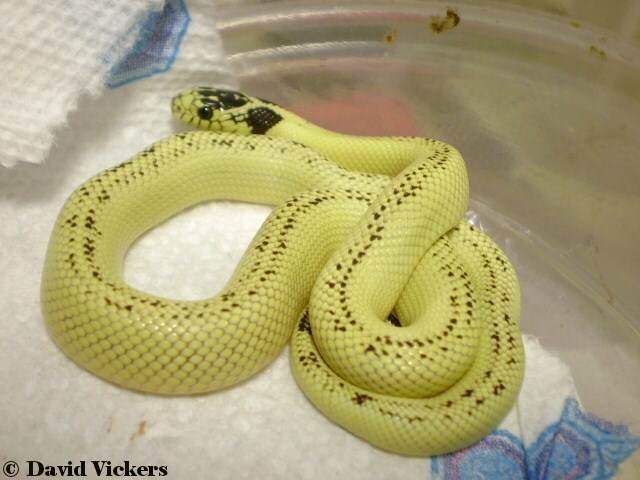 His high whites were produced after high yellows and have since become, the most popular selective bred Cal king morph. 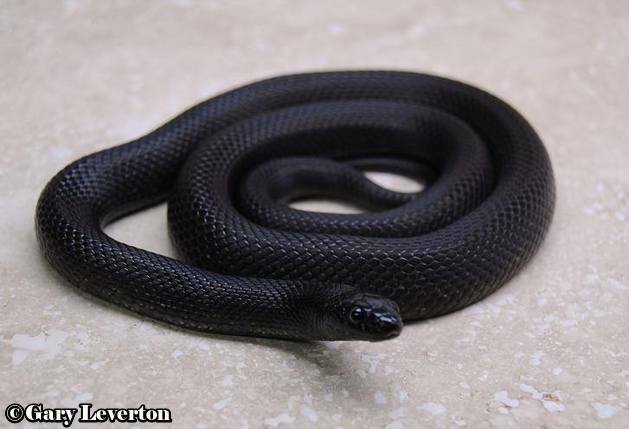 Through many years of selective breeding, the best examples might have only 5% dark pigment, which can be black or brown. 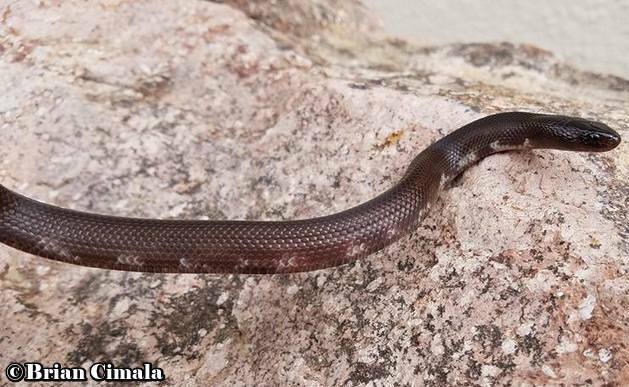 They seem to never fully lose that dark pigment on their head and on top of their tail. 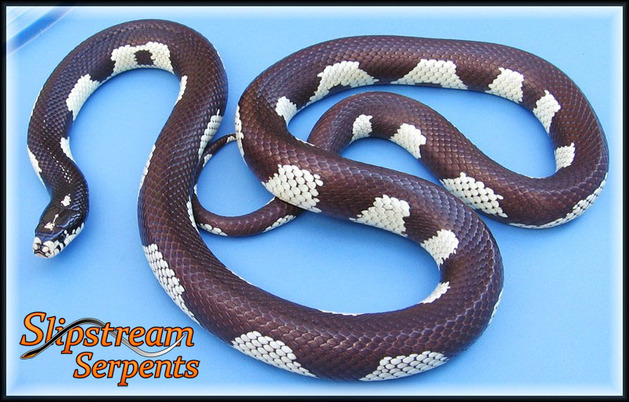 On a good example, there are just specks of scattered dark pigment in their dorsal pattern. 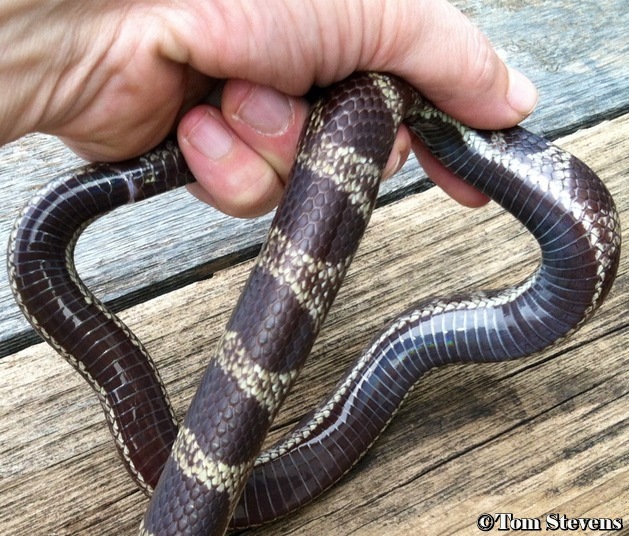 Some will have anything from solid dark bellies to completely patternless bellies. 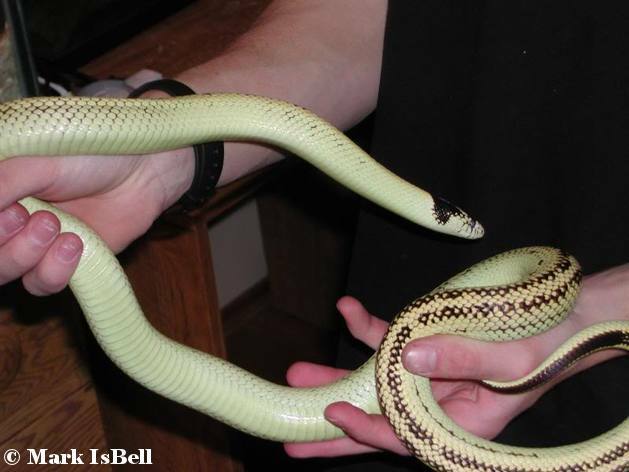 Like with all Cal kings in nature, the yellow and the white can be highly variable in their intensity. 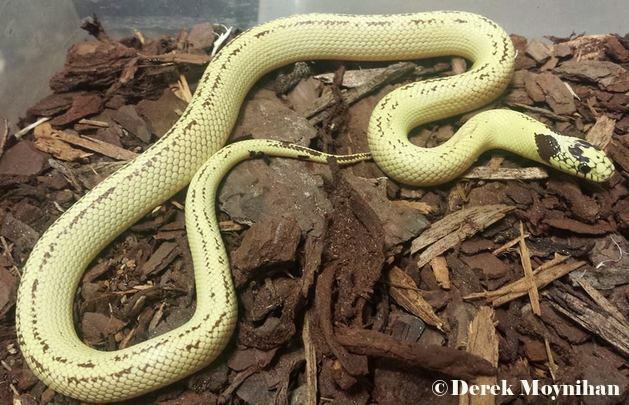 Some breeders selectively breed for the best yellows and best whites, while others don't give that a second thought. 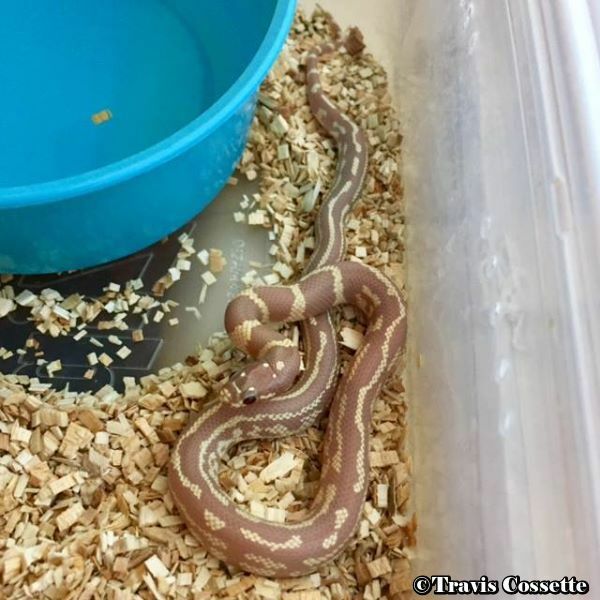 Unfortunately the market is full of bananas and high whites that are a product of breeding these two color variants together and passed on as whatever they looked more like as juveniles. This results in less intense yellows and whites. 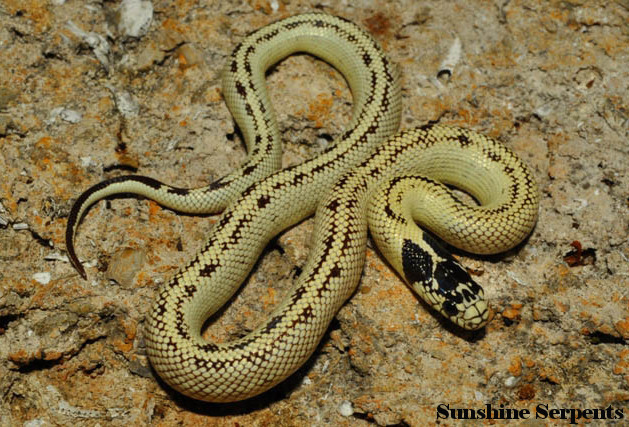 Often, juveniles may become more yellow with age, so its hard to tell exactly how they will turn out as an adult. Knowing what the parents look like and seeing them in person, is key to ensuring you are getting exactly what you are looking for. 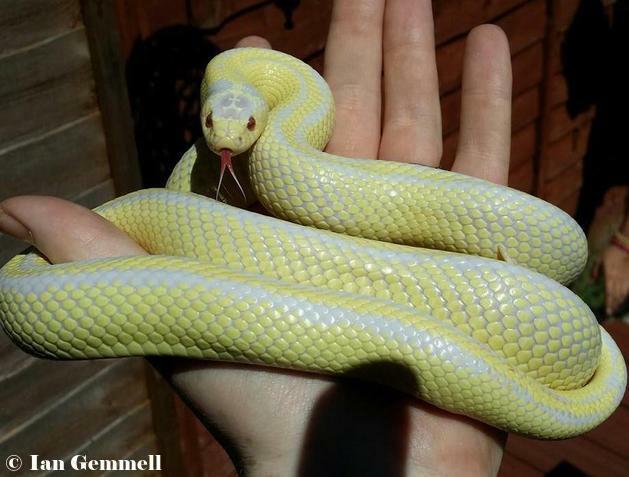 Photos very often make yellow and white look more intense than what they really are in real life. 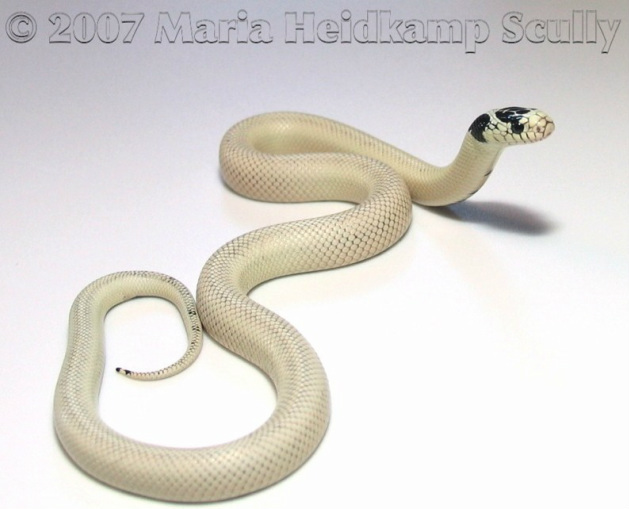 You can also have the opposite effect where a snake that looks white in a photograph, is actually yellow. 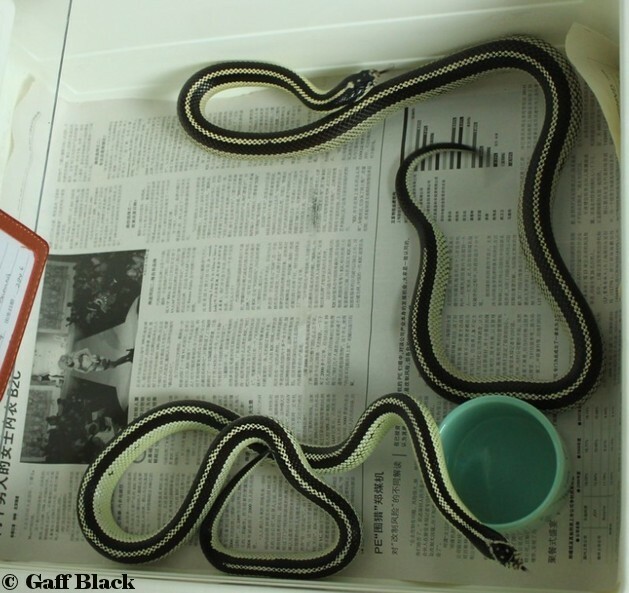 These two morphs started off with the Newport gene, but in recent years, the striped gene has been introduced in a lot of lines. 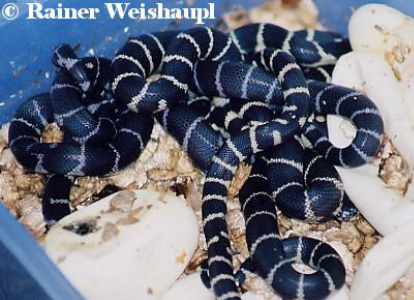 Breeding these morphs often results in many different pattern combinations. 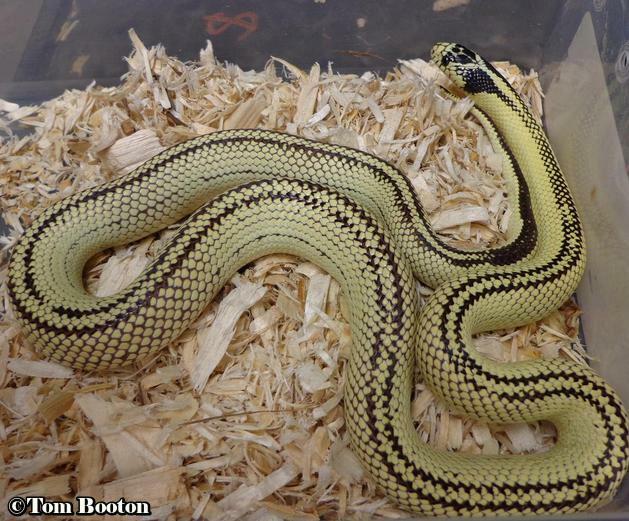 This is border line twin striped, but can also be called banana. 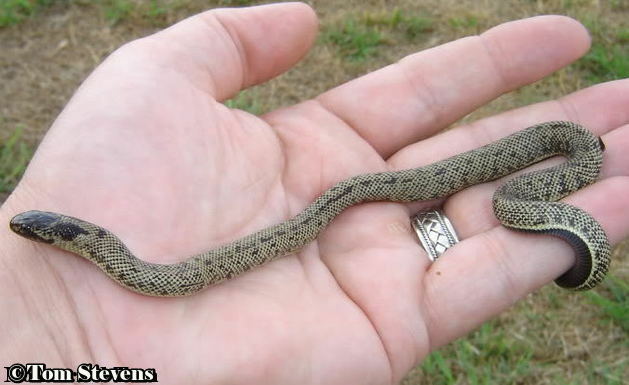 Close to what the early bananas looked like. 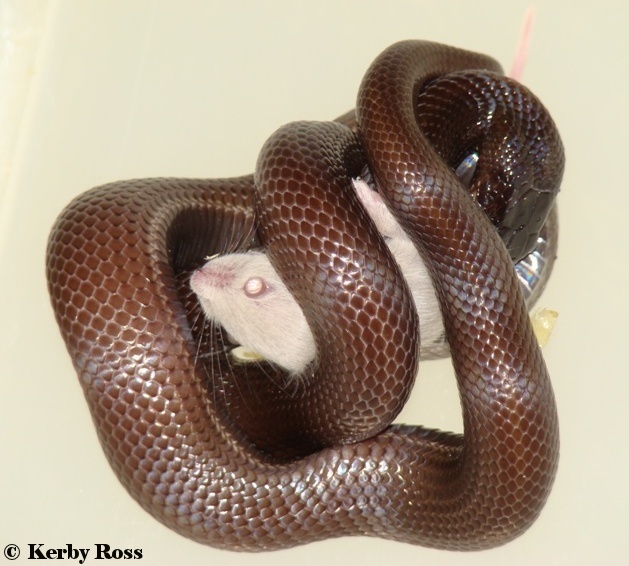 never fully loses the black pigment. Here's two adult High whites and a good photo depicting variation in the white. 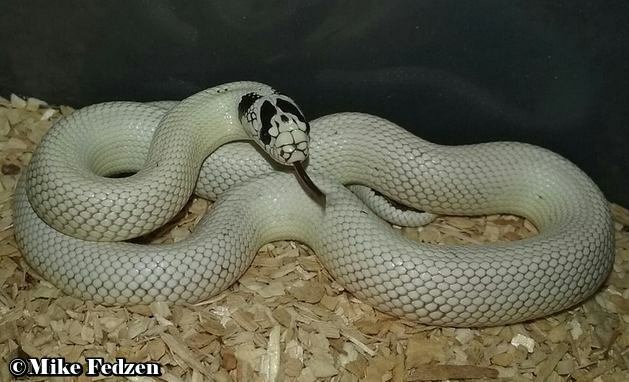 the white, be sure to see the color of both parents. 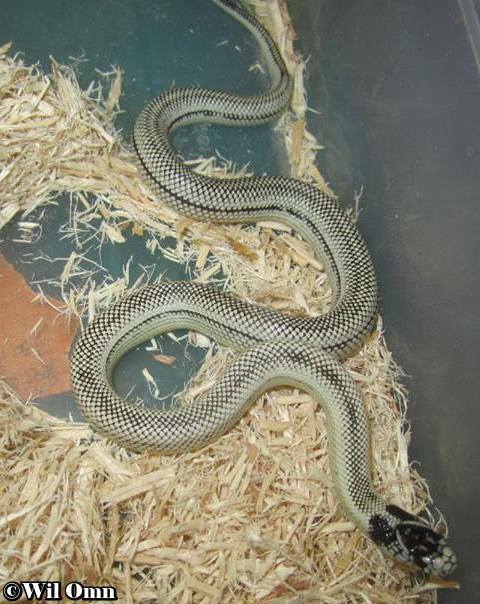 These are from South Africa. 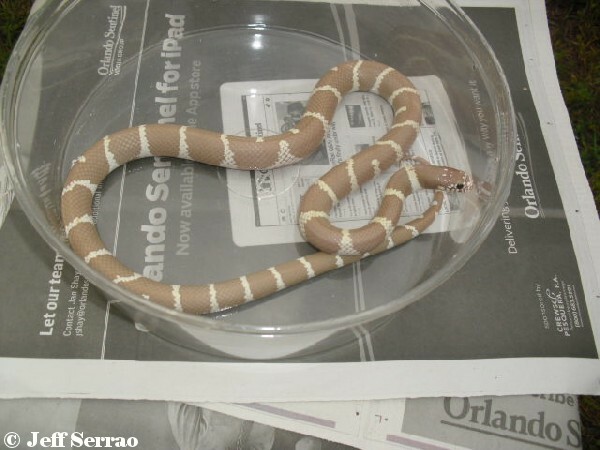 A good example of a twin striped morph looks just like a reverse wide stripe with a complete light stripe running down the middle of it. 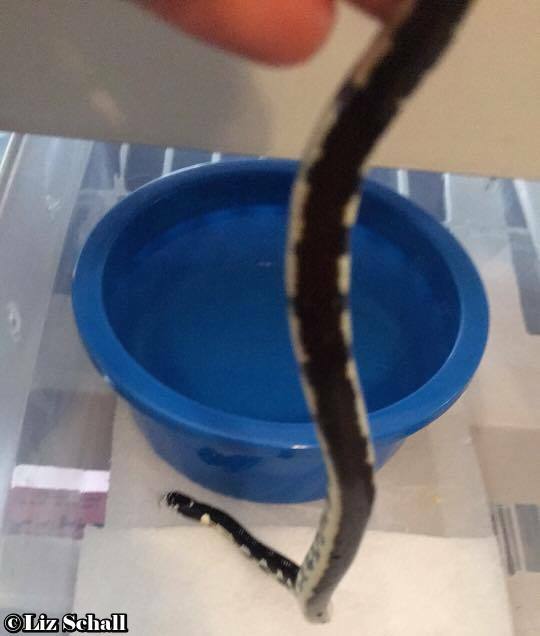 This effect causes two dark stripes side by side. The clean sides also give it more of a twin striped look. 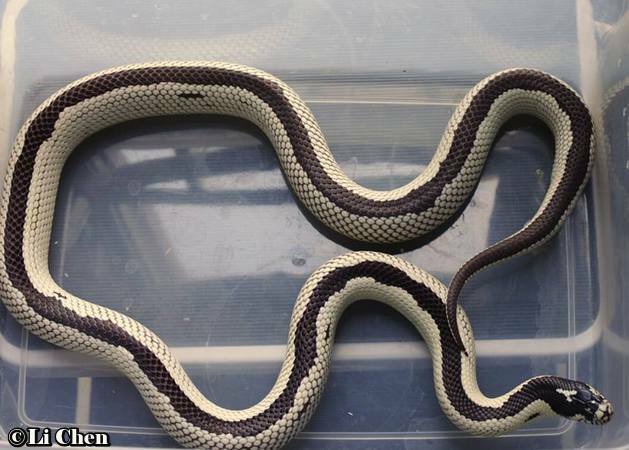 The dark colored twin stripes should have fairly even borders and are normally 1 and a half to 2 scales wide. 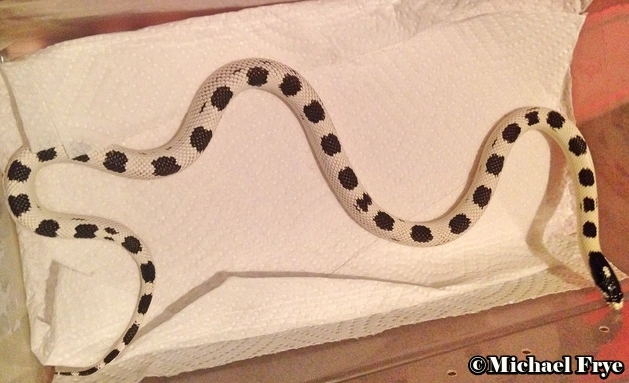 This is normally one dark row of scales with a half scale darkened on each side of that row. 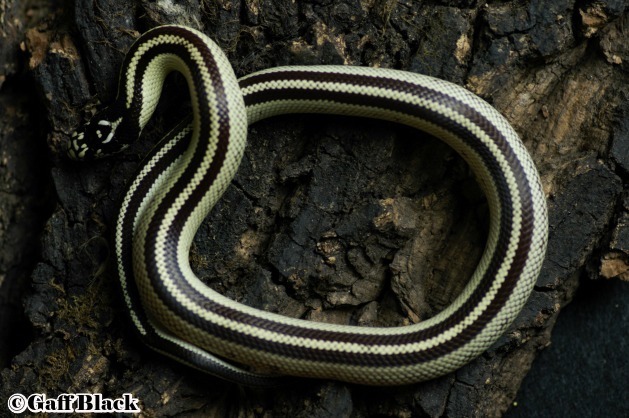 Individuals with broken twin stripes and very uneven edges, normally fall under the category of high white or banana, depending on the light color. 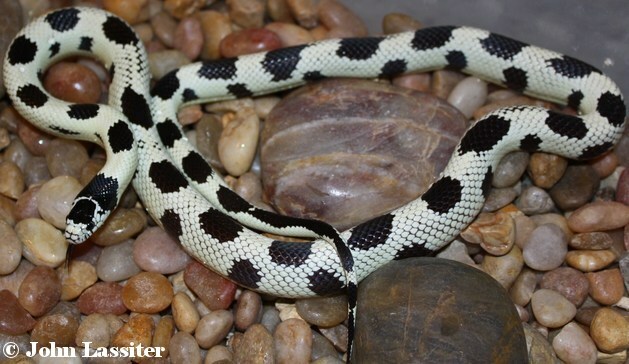 The broken twin stripes may form a fair amount of dotting. I’ve seen this happen enough times that I’ve decided to label these individuals Twin dotted. I’ve seen very few good individuals. 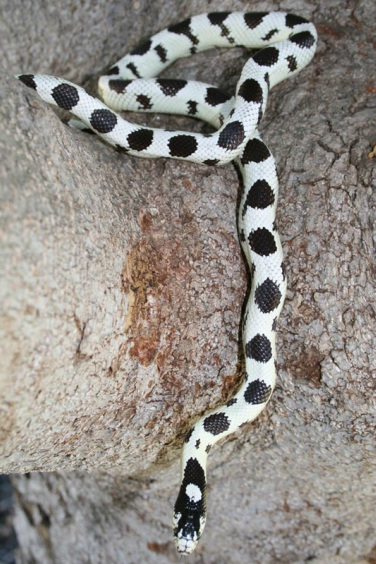 Most specimens only have a percentage of dots. If their overall appearance looks looks twin dotted, they can go by this name. The side pattern on these two forms is generally slightly patterned to patternless. 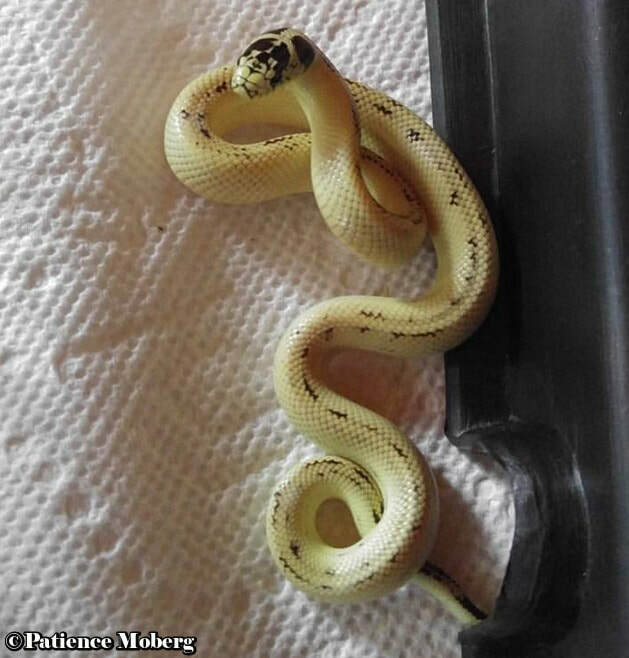 They range in color from yellow to white. 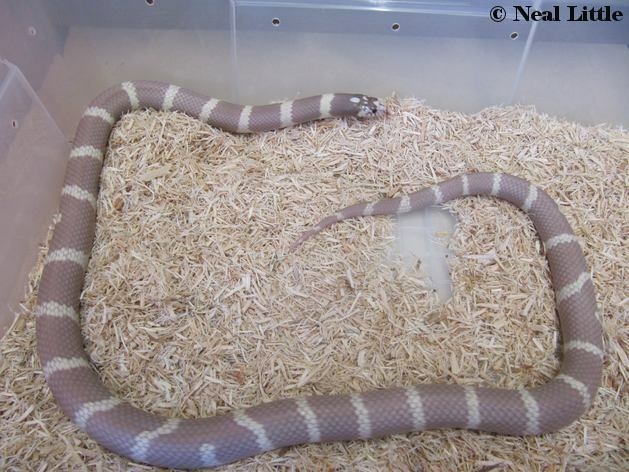 These are considered a Newport aberrant morph that may be influenced by the San Diego striped gene. 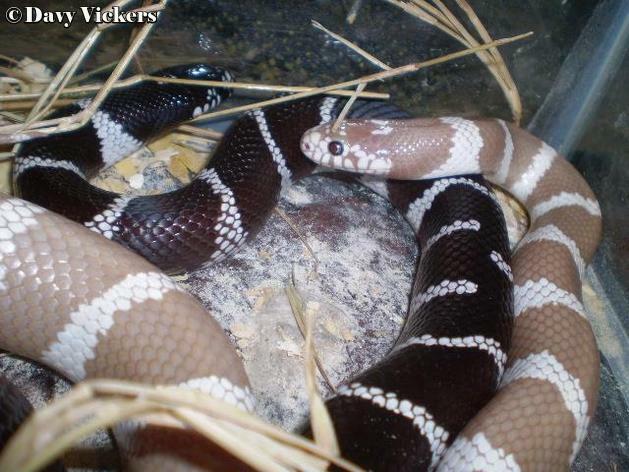 This is a group of San Diego striped aberrant morphs that are closely tied together. 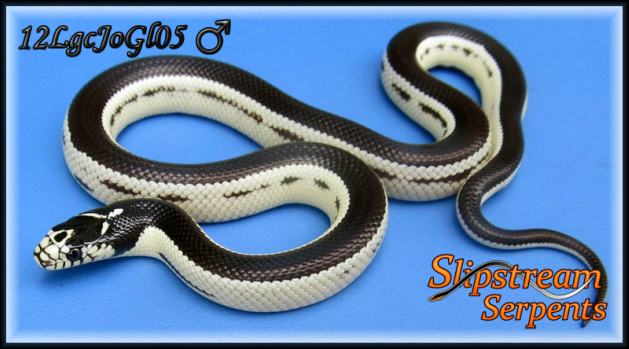 In this group we have the Mosaic, Reverse striped, Reverse wide striped, Reverse dotted and vanishing stripe morphs. 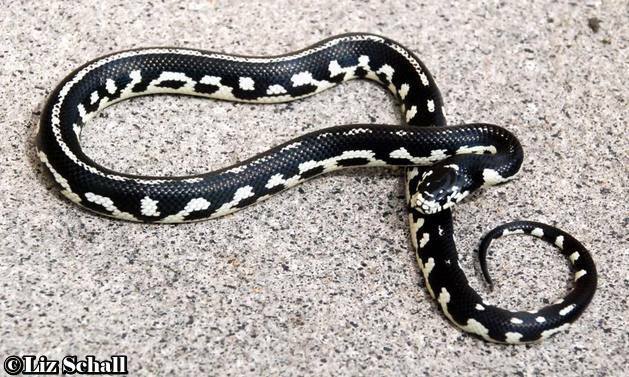 What all these morphs have in common is the lack of a vertebral stripe or a vertebral stripe that is missing in certain areas. 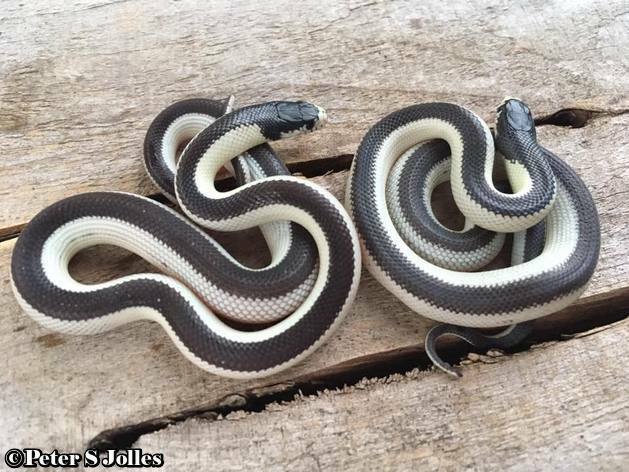 Recently these morphs have been produced from the Gary Keasler line of La Quinta kings, which are a SD striped aberrant morph. 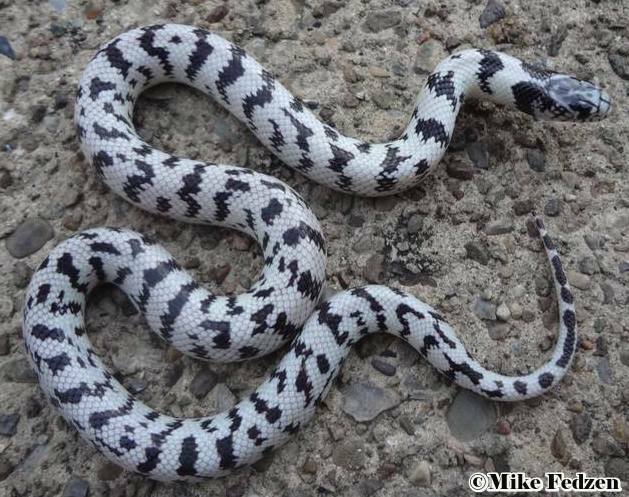 This is best described as a high white Cal king with a black stripe that is as narrow as the stripe on a normal SD striped kingsnake. 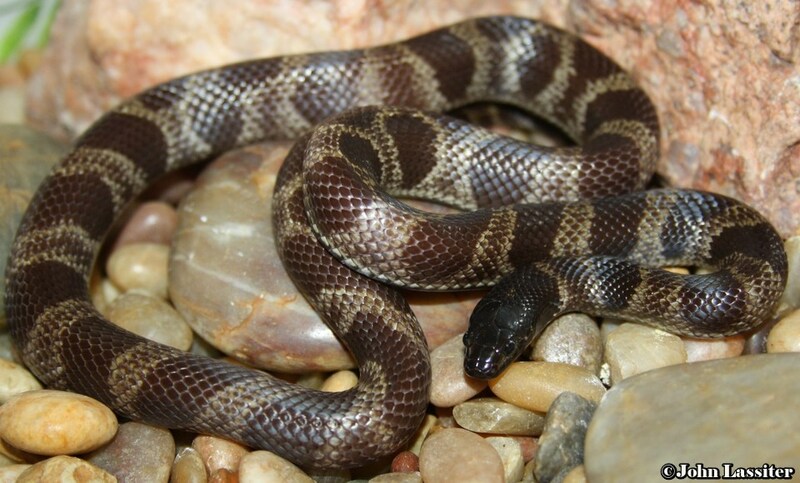 However, some individuals will have a stripe a bit wider than others. This stripe can vary from having very straight borders to very jagged and broken up borders or even an incomplete stripe. 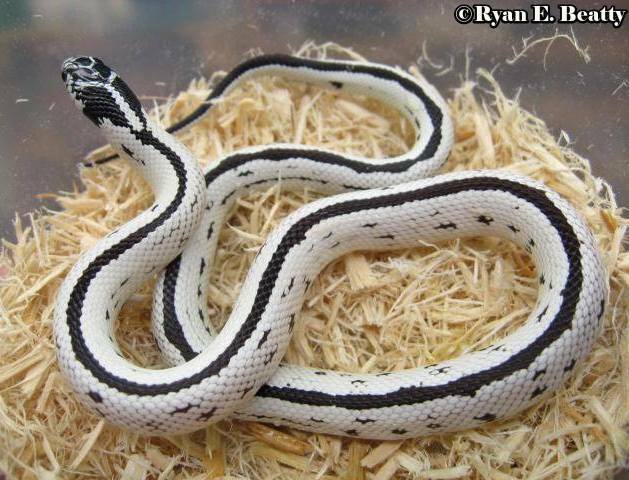 Again, with some specimens, its a matter of opinion on whether they should be called Reverse striped or high white. 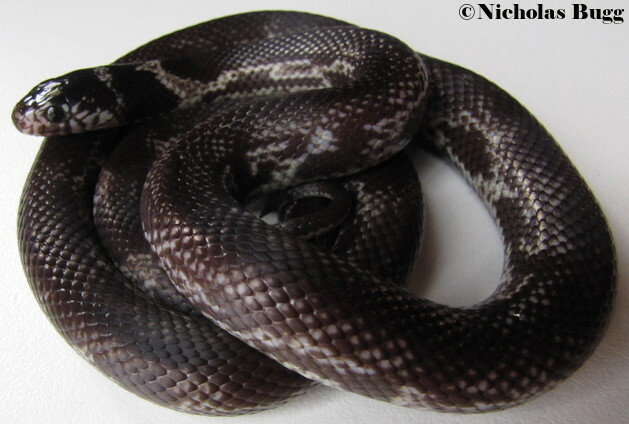 The side pattern is variable as well. 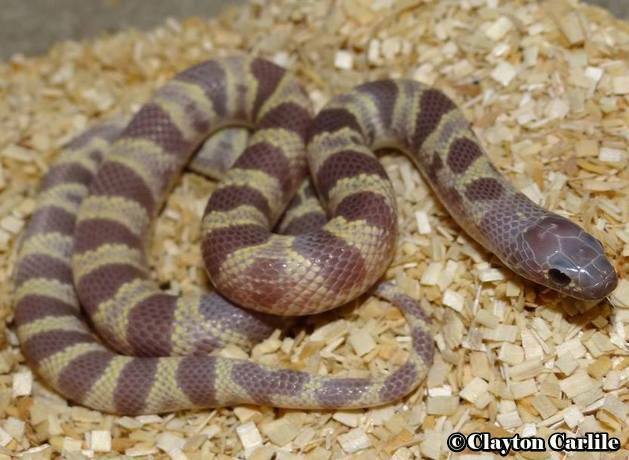 This is a very popular Cal king morph. 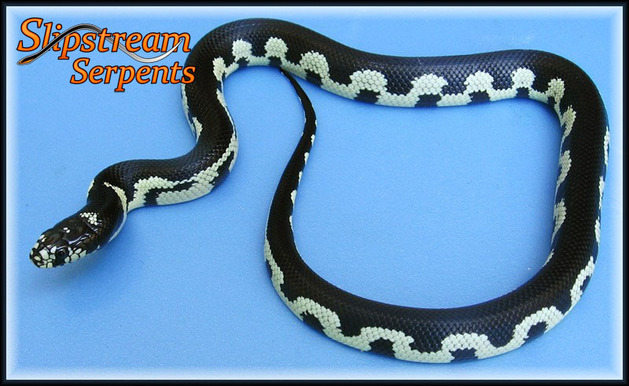 The side pattern is normally more reduced than most Reverse wide stripe and Vanishing stripe morphs. 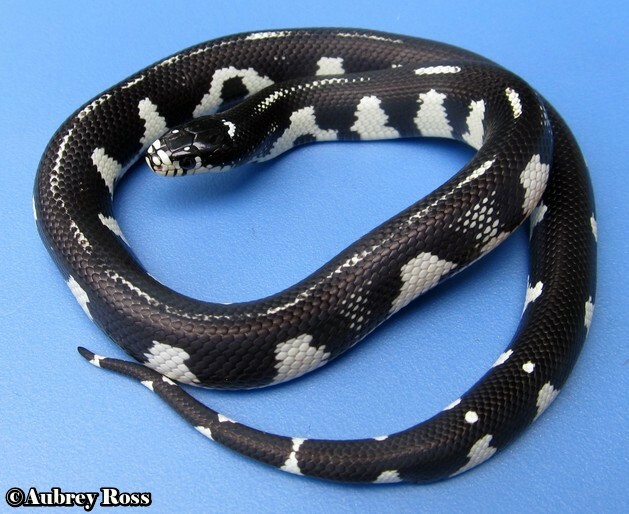 This is as nice as it gets for a reverse striped. 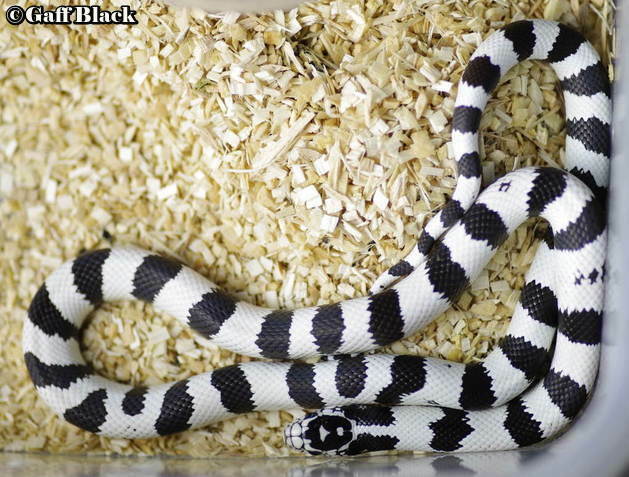 This would be in between a reverse striped and a reverse wide striped. 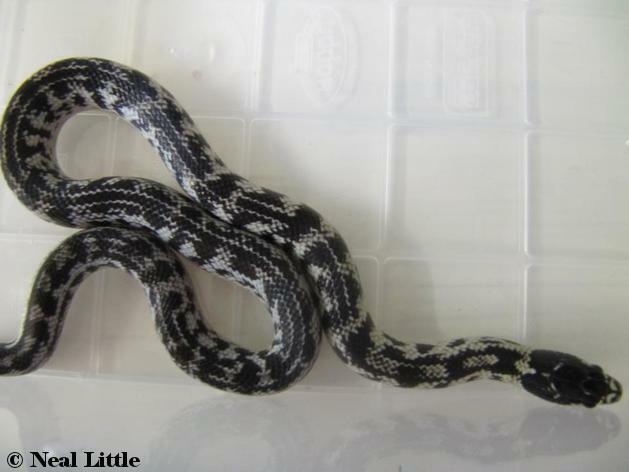 This individual is border line high white/reverse stripe. You could call it either one. 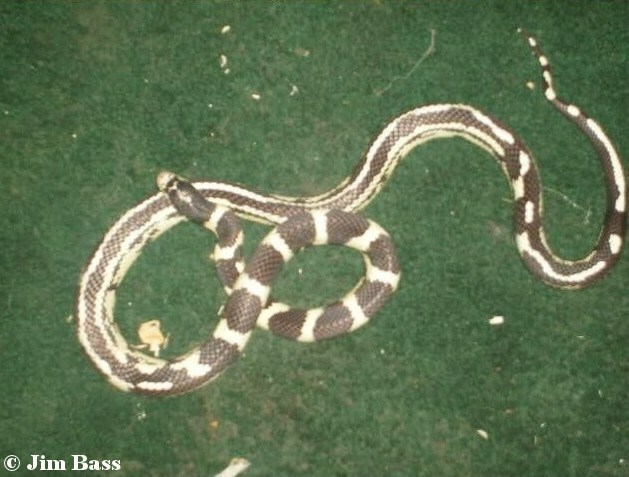 This pattern is basically the Reverse or Reverse wide stripe morph's pattern breaking up due to banded influence, which is the same effect seen in the scrambled banded Newport morph. 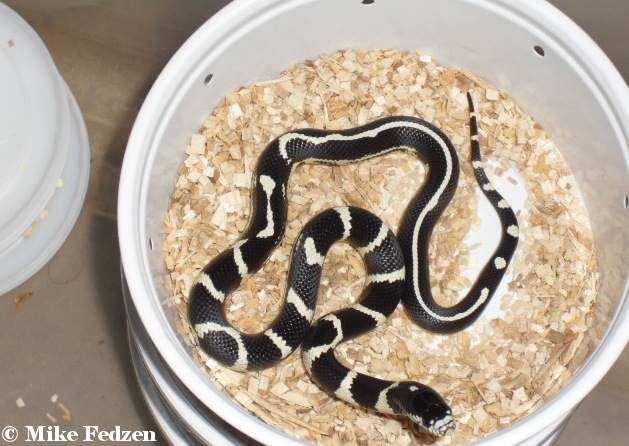 Lots of individuals will not be perfectly dotted. 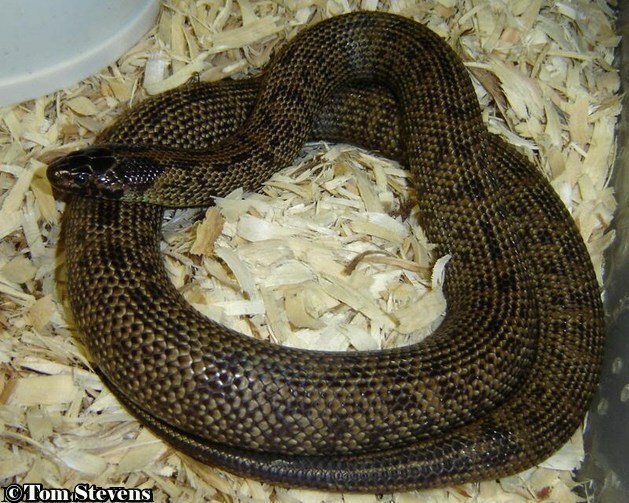 Many specimens will have a number of elongated oval shapes that may or may not be connected to one another. These are what I call in betweeners, because they are in between a dotted and reverse wide or reverse stripe. Good examples will have dots that are more round than oval. 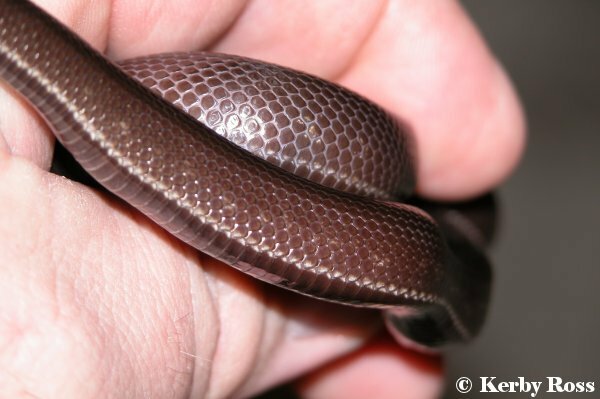 The width of these dots are as wide as the stripe on both reverse stripe and reverse wide striped morphs. The side pattern can have small blotches or can be very clean. 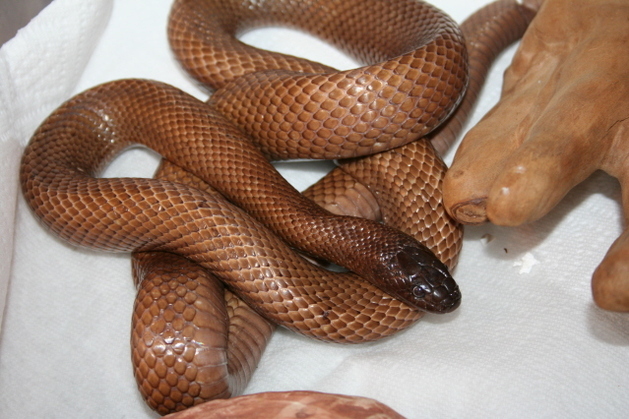 The top of the tail is often that of a Newport and may show traces of light banding going across it. 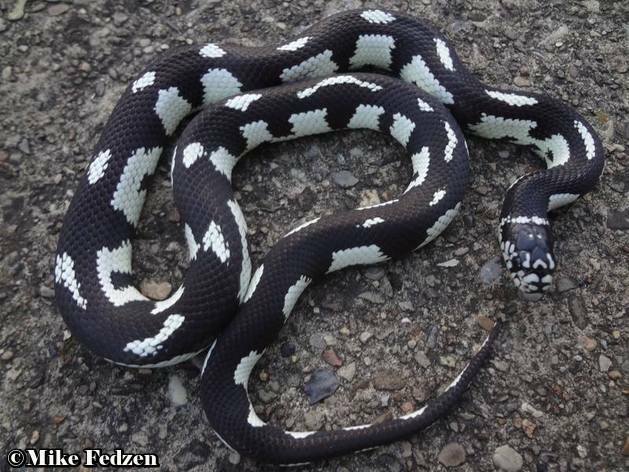 Selective breeding helps to produce the best examples. 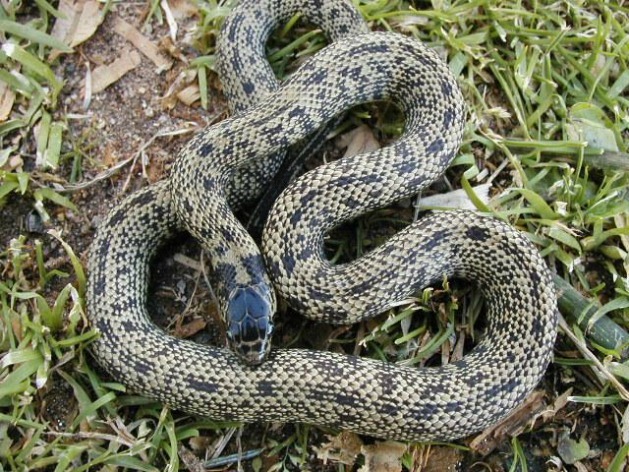 Reverse dotteds are the least common of the reduced patterned group. 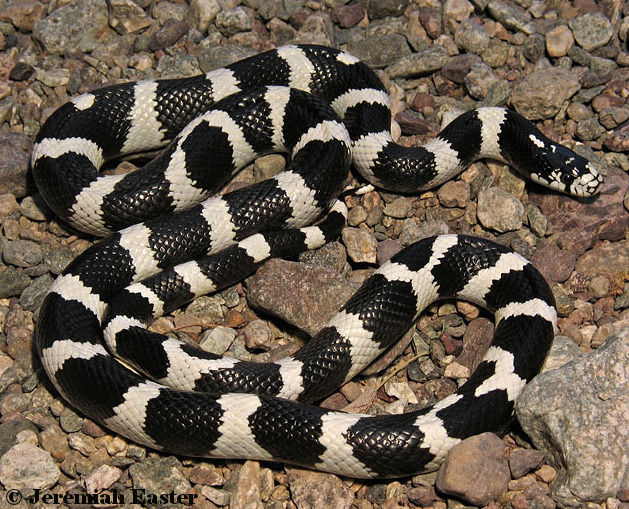 The second example is basically the Western Mojave banded aberrant pattern reduced, through selective breeding, to the point of having large dots instead of saddles or blotches. This example is more likely to have blotches on the side positioned in between the dots on the back. 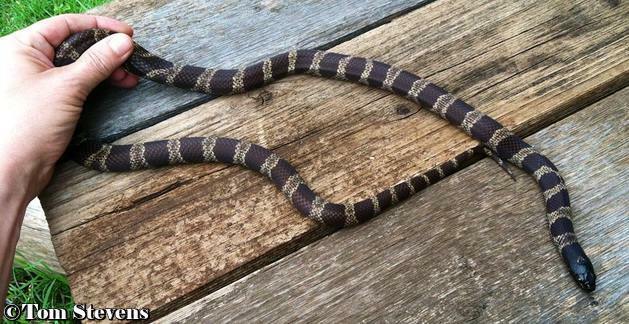 The tail may be banded or have reverse dots. 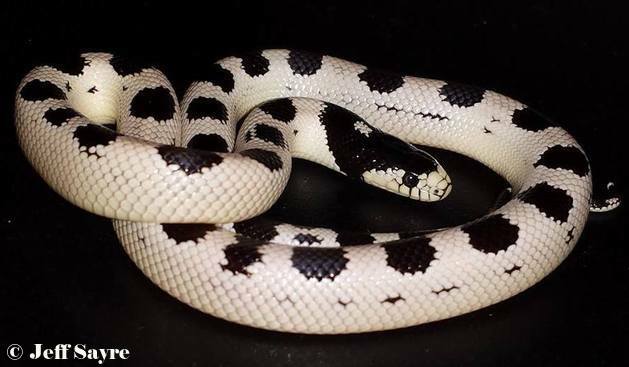 This pattern in its purest form can be found in the wild, so selective breeding only increases the odds of producing nice ones. 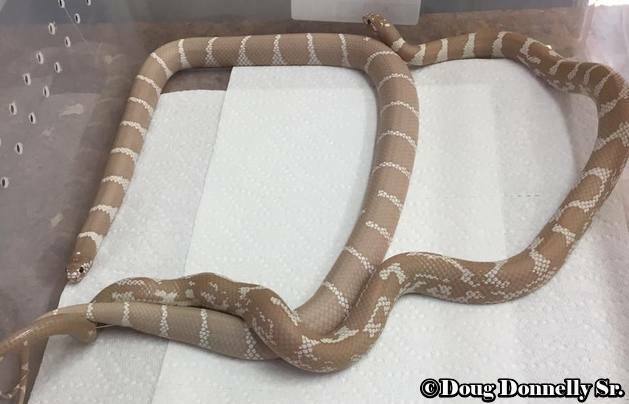 The tail on these will never have a Newport type tail. 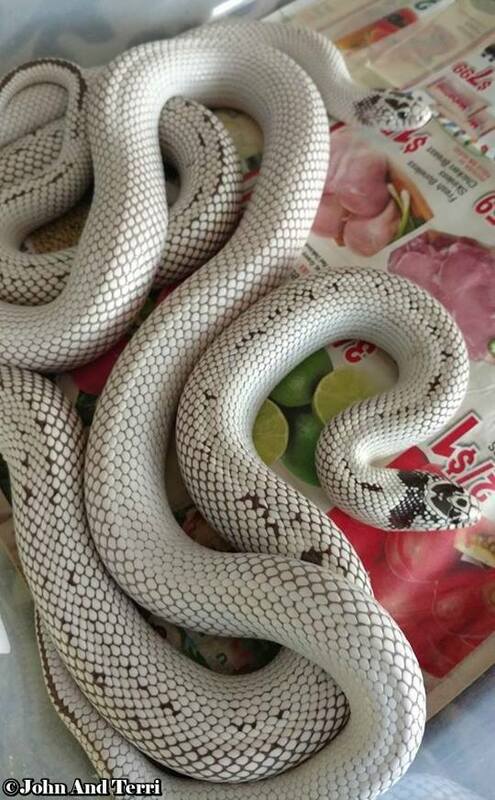 Note: The tail pattern doesn't always determine which line these are from. 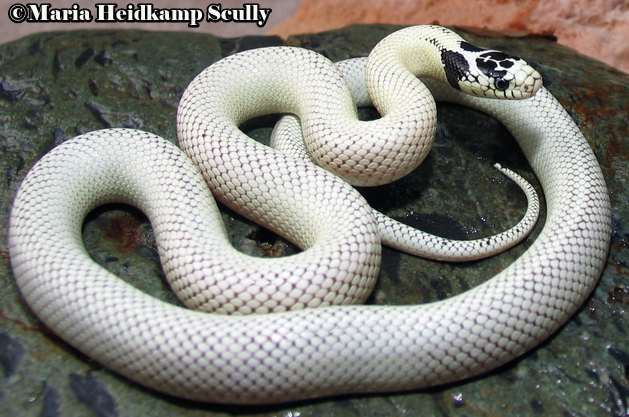 I have seen examples of the Reverse dotted morph that look like they are the product of both examples explained here. 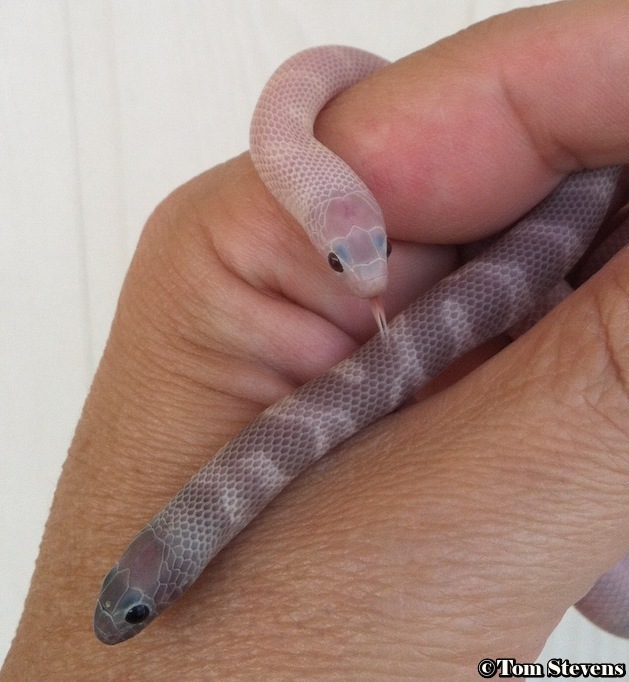 Brian McGurty and Tim Turmezei are responsible for developing these two morphs. Theirs are more than likely from the second example explained. 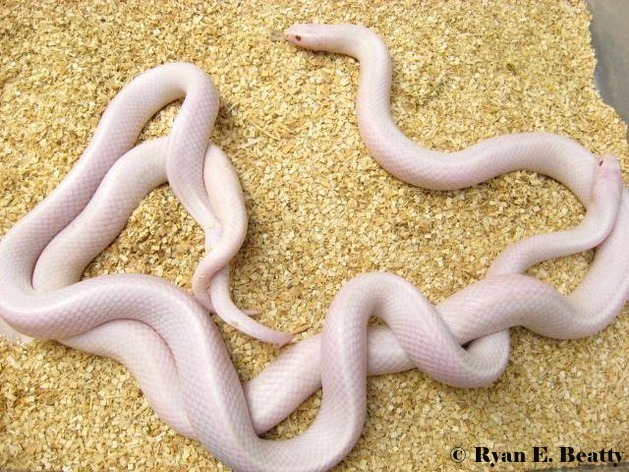 In actuality, these are two different genetic morphs that look nearly identical and share the same name. 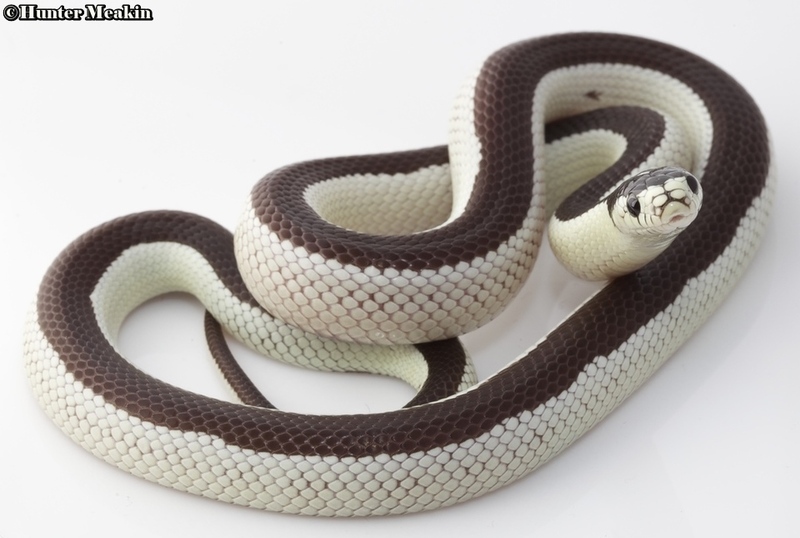 The history is now known where this morph is from. 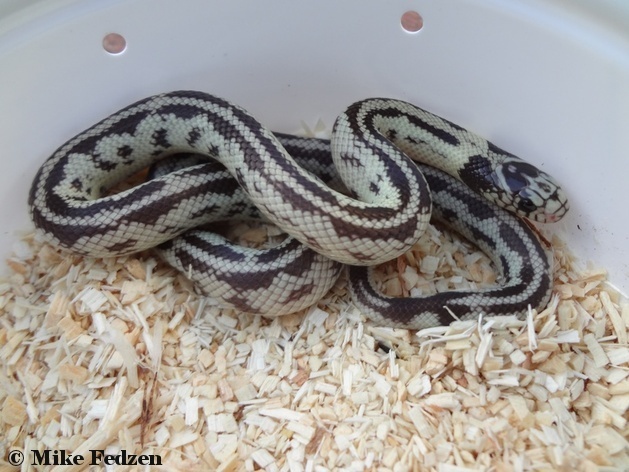 In 2017, Peter Jolles hatched two perfectly patterned Reverse wide striped from a pair of La Quinta kings, so these are the result of the San Diego striped gene aberrant patterns. 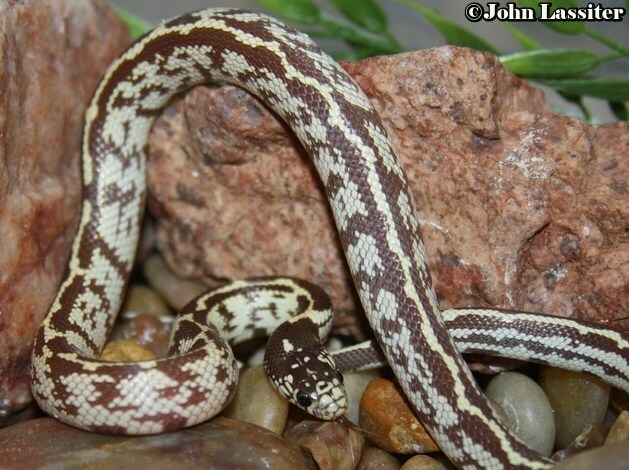 This morph along with the Vanishing striped, reverse striped and Mosaics are often produced in the same clutch, which shows their close relationship to one another, all aberrant patterns produced by the SD striped gene. 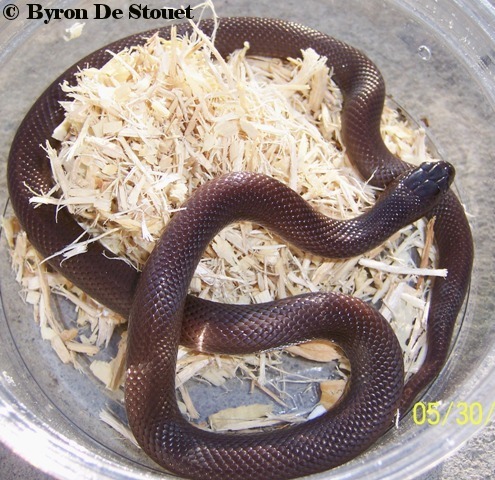 The side pattern is variable and reduced much more in some specimens. 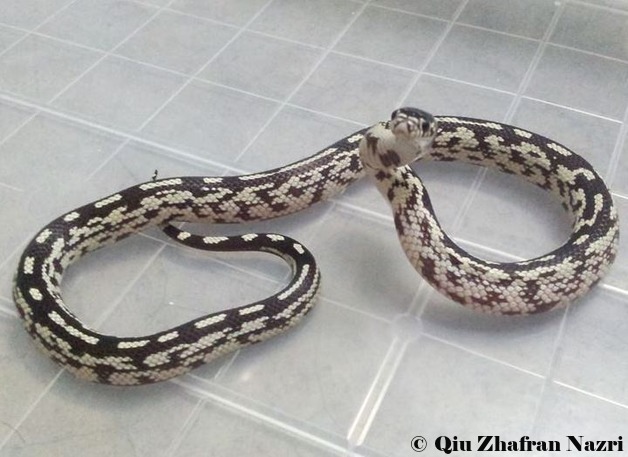 ​half banded half striped morph. 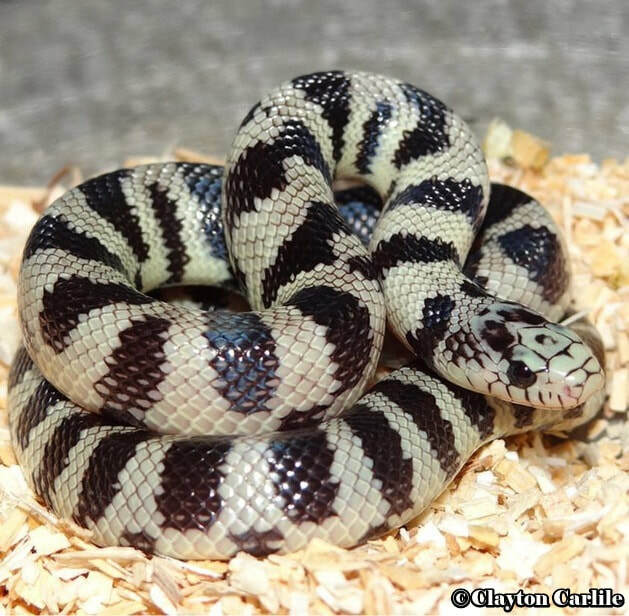 A possible hypo Reverse wide striped. 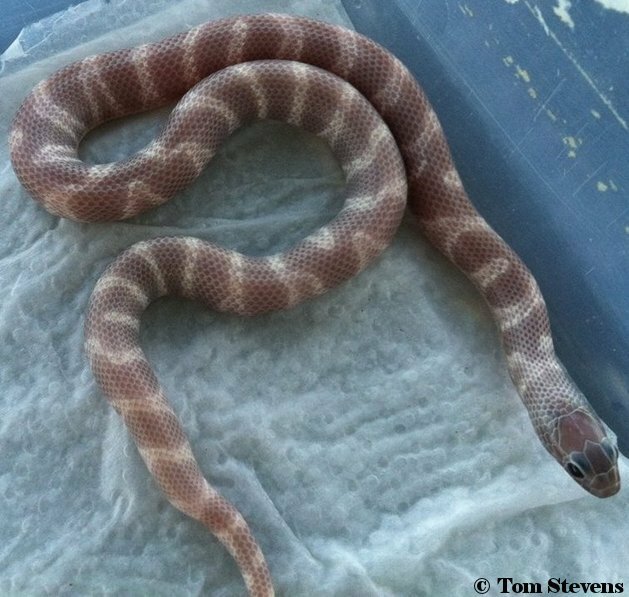 This is basically a Newport pattern with the stripe fading out or completely absent in certain areas, usually on the last half of the snake. 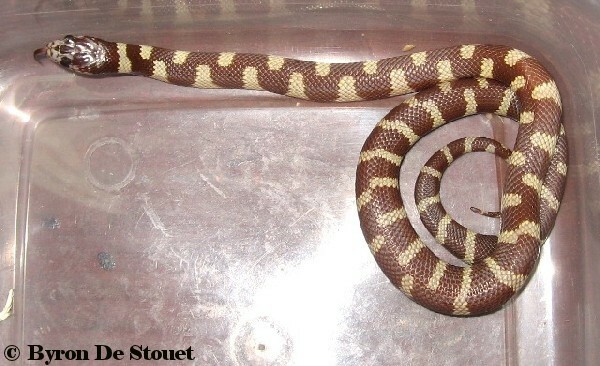 This morph is often produced along with the Reverse wide stripe. 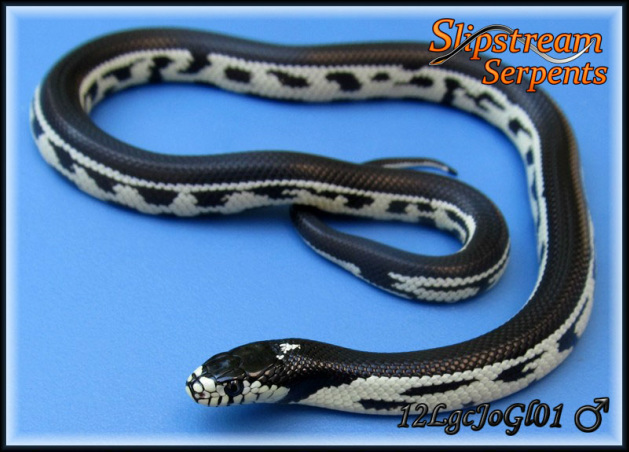 They are both pretty close the same morph except the stripe is reduced all the way or almost all the way on the Reverse wide stripe morph. 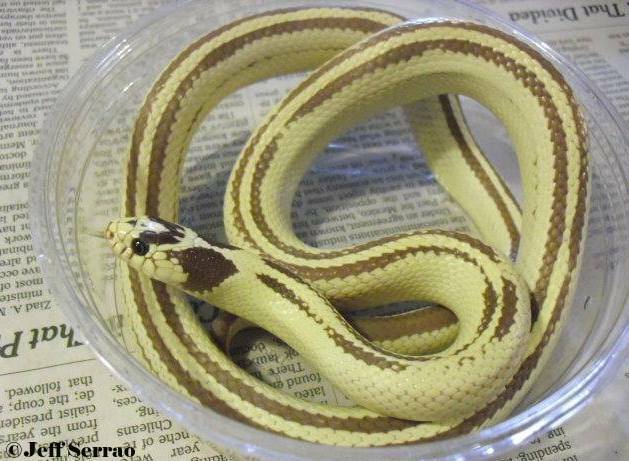 A Vanishing stripe king with just a hint of striping is often called a Reverse wide stripe and that is fine. 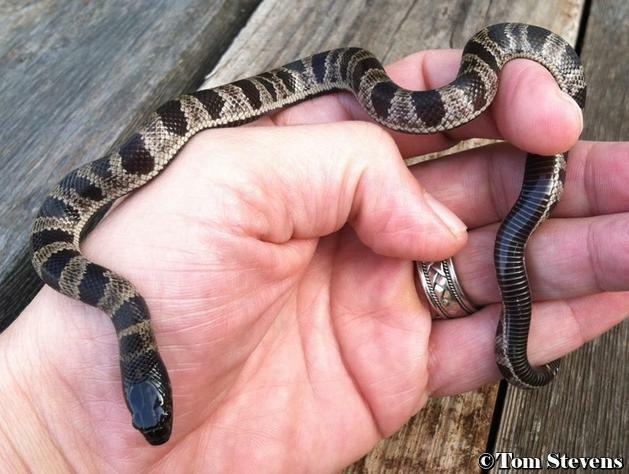 Because there is so much variability in pattern with aberrant Newport and aberrant SD striped morphs, it often comes down to a matter of opinion of what category they belong to. 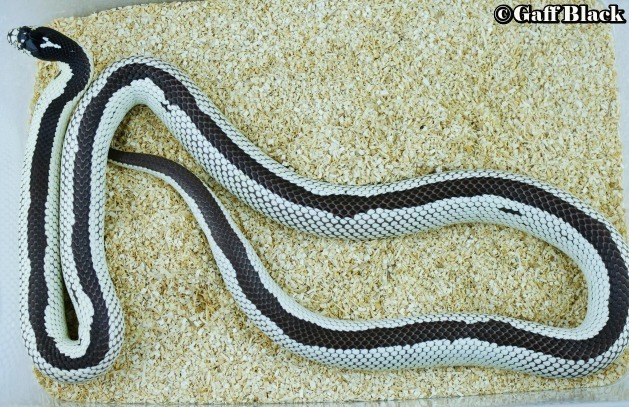 The side pattern is the same as the Reverse wide stripe morph. 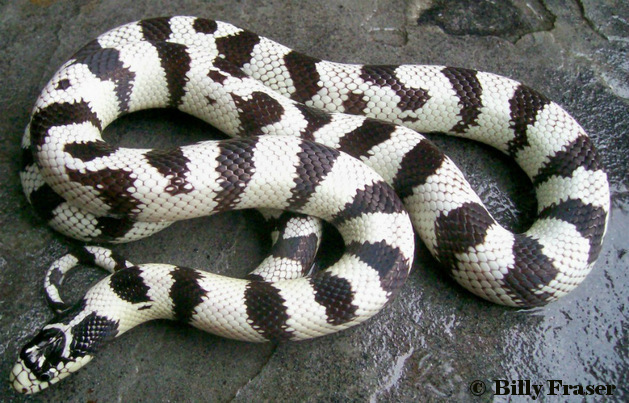 This morph usually lacks any sign of a vertebral stripe, but some specimens may have small light colored dots down the back. The pattern is highly variable. In good examples the side pattern consists of almost square like light markings that usually extend more than half ways up the side. These are actually partial light bands that don’t cross over to the top. These side markings can be rounded at the top or squared off. 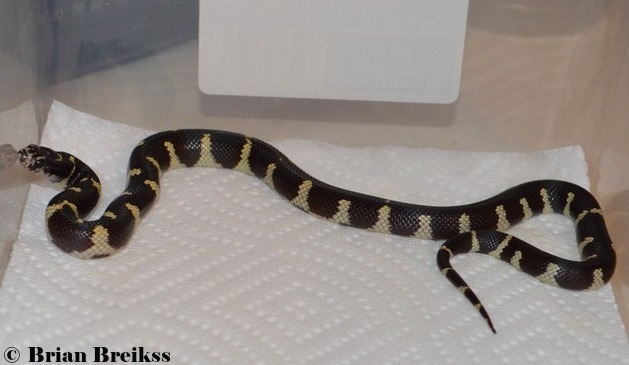 The belly pattern is normally checkered. 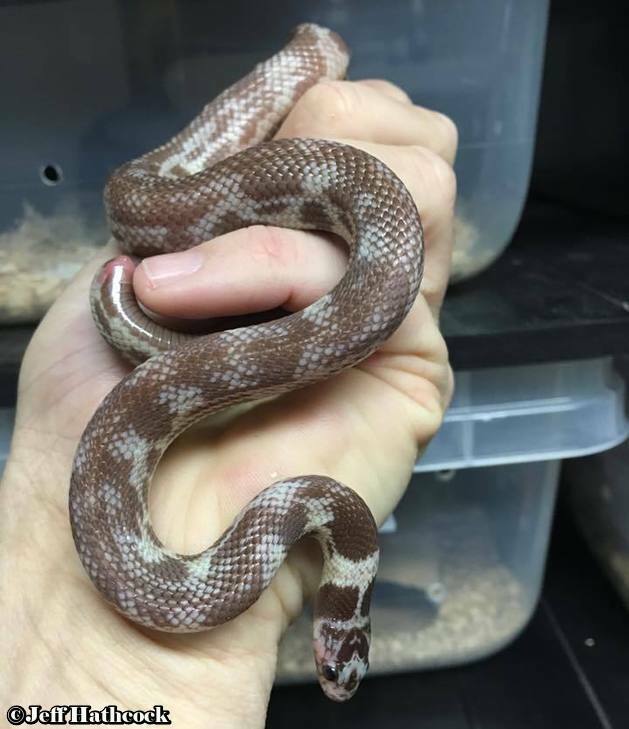 One thing interesting about this morph is that it is often the dominant trait within a clutch when one parent is Mosaic. There are also examples of 50% or less of the clutch being mosaic. 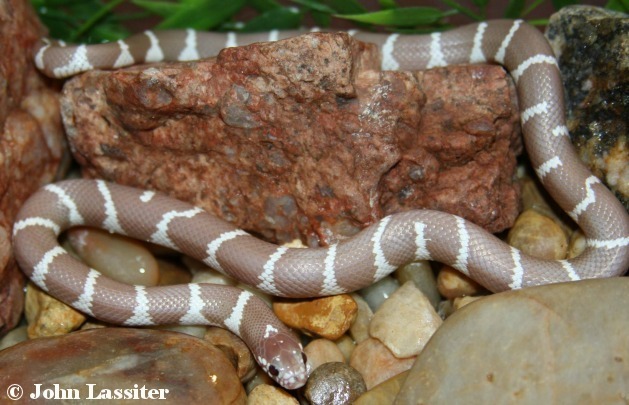 There are often reverse wide striped and vanishing stripe morphs in the same clutch. 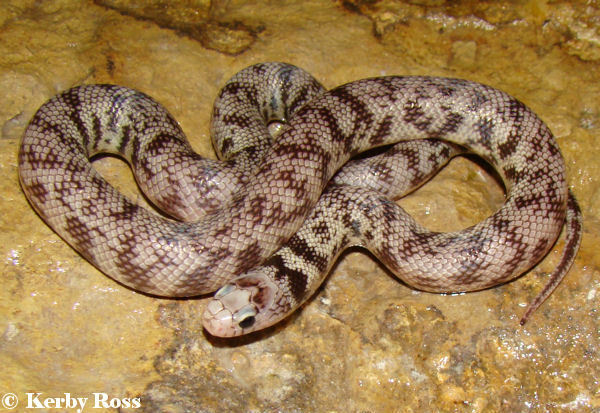 There can also be individuals that express a little of each of these morphs and should not be called any particular morph other than aberrant. 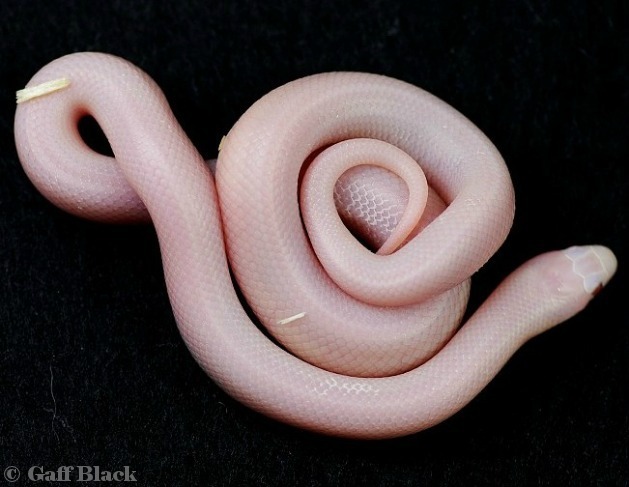 I feel this morph is not the result of selective breeding, but there is no evidence they occur in nature. 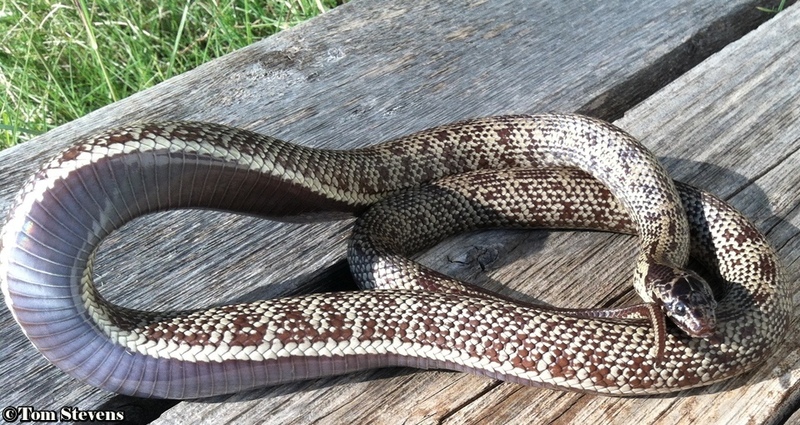 A mosaic with a vanishing stripe. ​mosaic. 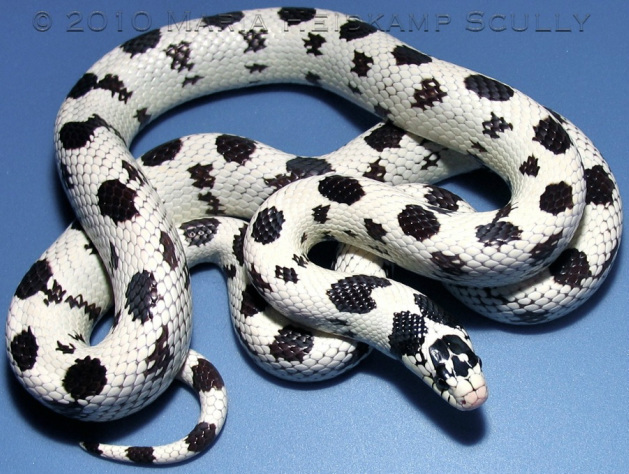 Mosaics, from what I know, always have a checkered belly pattern. 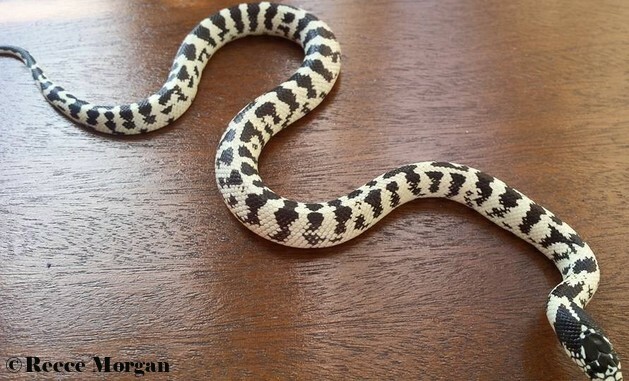 Another pattern type randomly produced from the SD stripped aberrants. 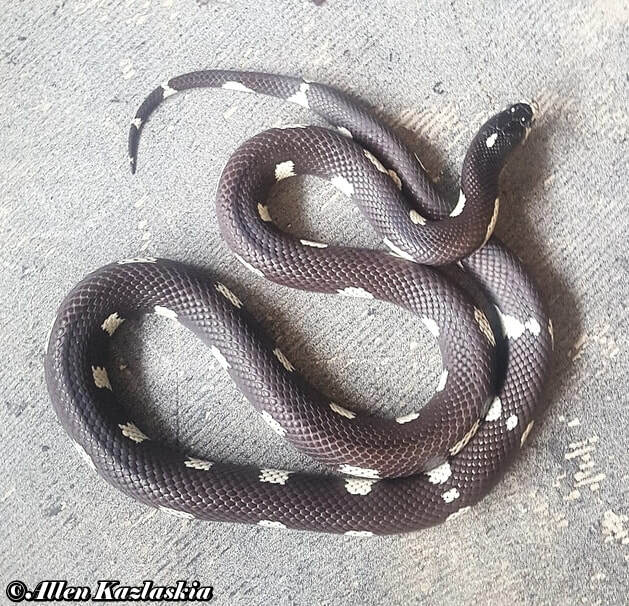 I guess you could call this a dotted charcoal back. 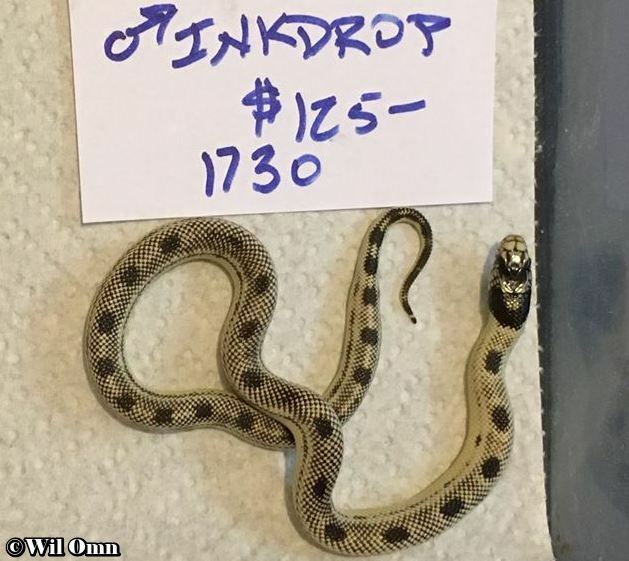 Wil calls it an ink drop. 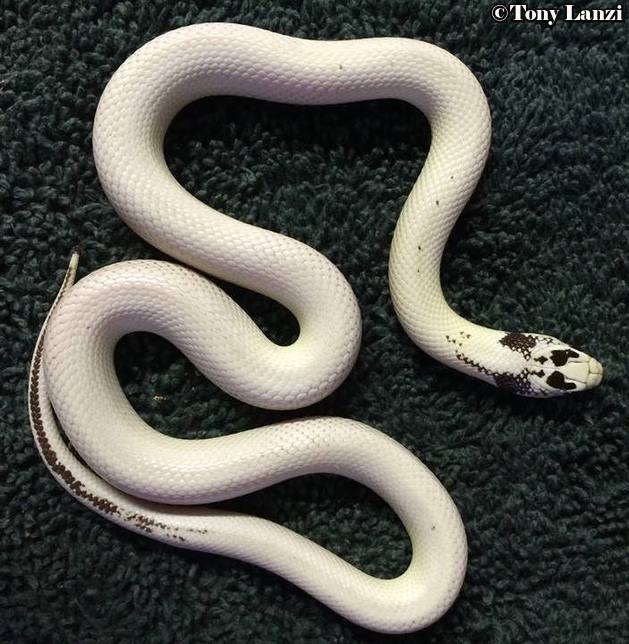 Osborne line hi white Cal king." 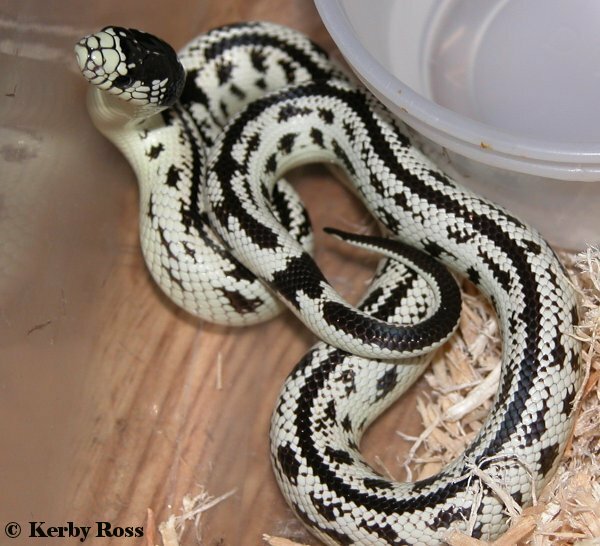 Kerby Ross gave this name to aberrant Cal kings that display a high amount of dark aberrant markings up high on the sides. 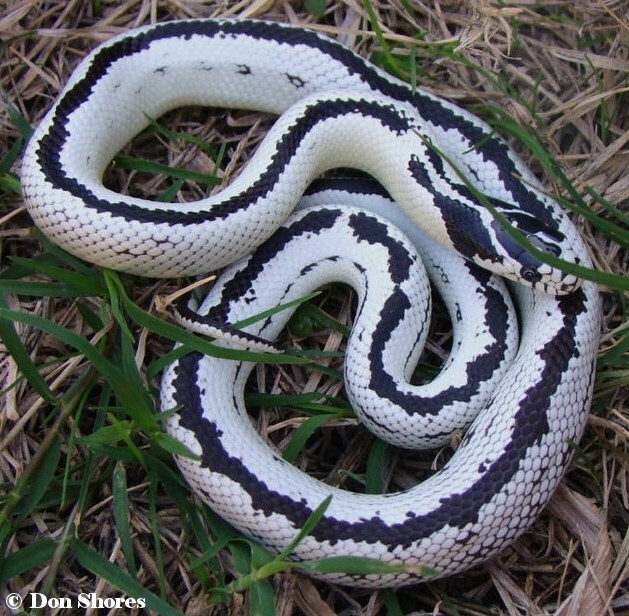 This happens in nature, but there is usually a second and third stripe visible. An Aztec should be void of any striping on the sides and can have any type of stripe on top. 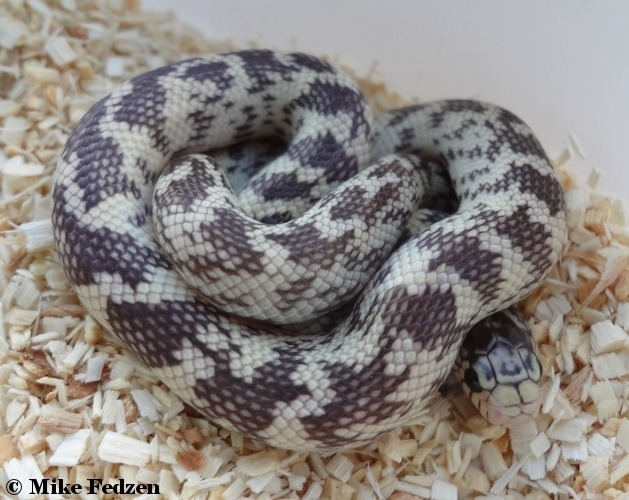 Members of the Facebook group California kingsnakes voted for this name due to this morph's resemblance to the Carpet Python. This is the Newport gene. This is an odd look I have rarely seen. 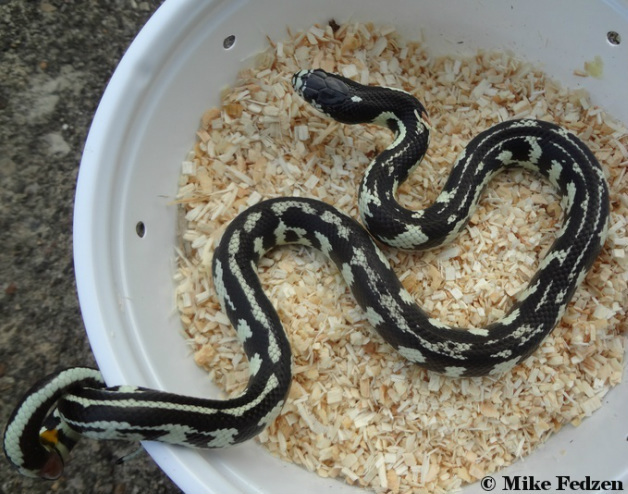 Its a dark reverse stripe bordered by light pin-striping. 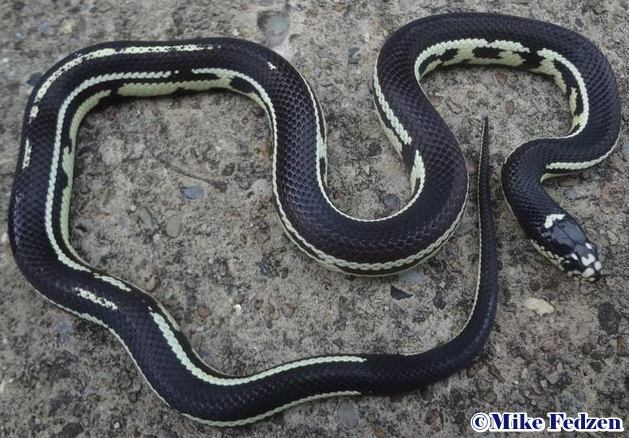 What's odd is that with both examples, the reverse stripe fades back to a normal stripe. 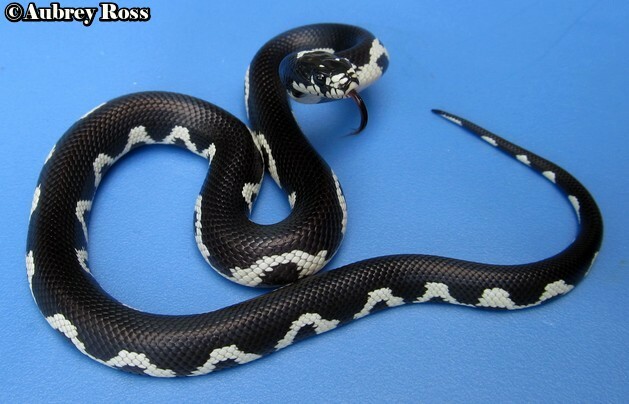 This is the recessive hypermelanistic morph. 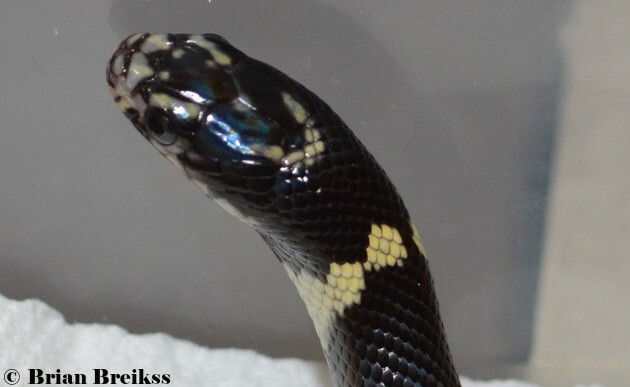 This type of hypermelanistic king is the result of crossing the hypermels with different morphs. There's no name currently for this look, but it is becoming popular. 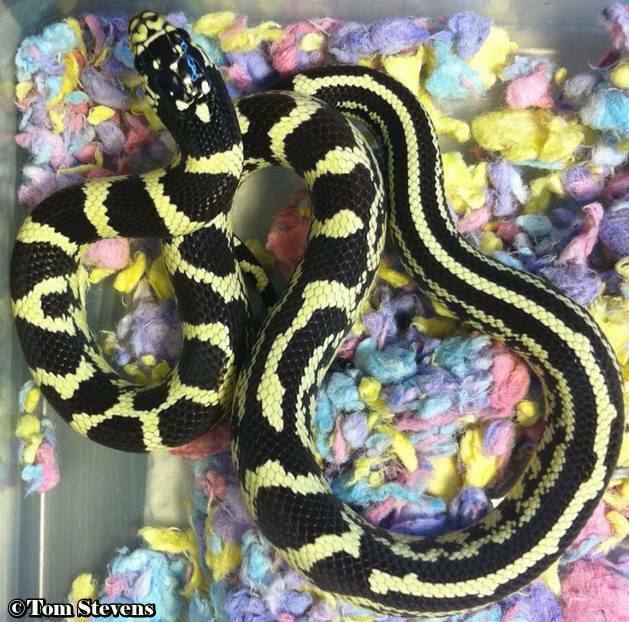 I've heard the name tiger striped use, but as far as I know, it hasn't caught on. Kerby Ross is the first I know to have produced one, but Tom Stevens has produced them regularly and is making them available now. 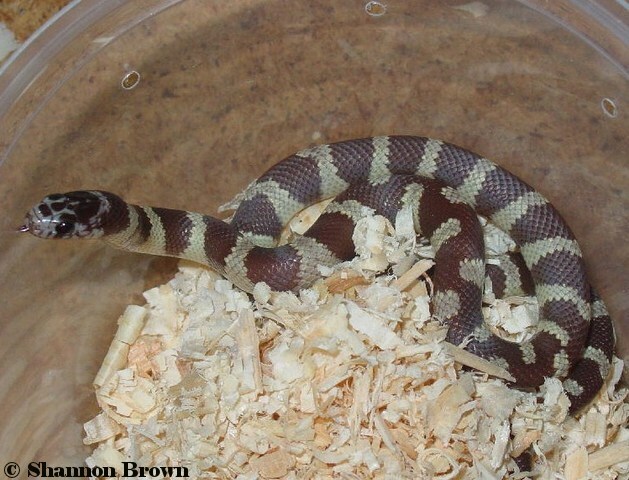 Chocolates are a mostly patternless medium brown to very dark brown California kingsnake. 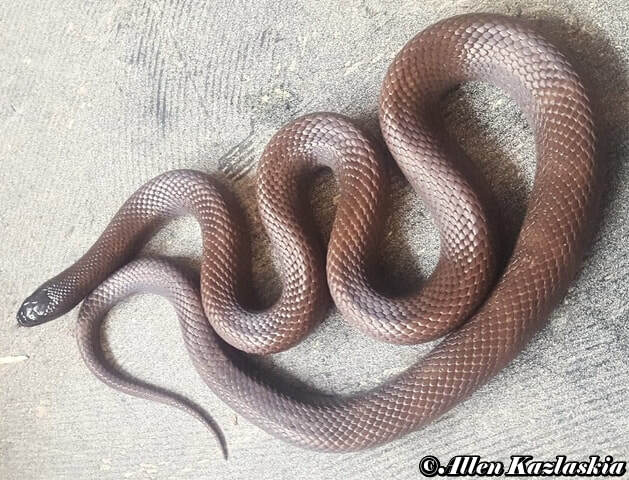 This is also known as the Nitida morph, which is a recessive hypermelanistic trait. 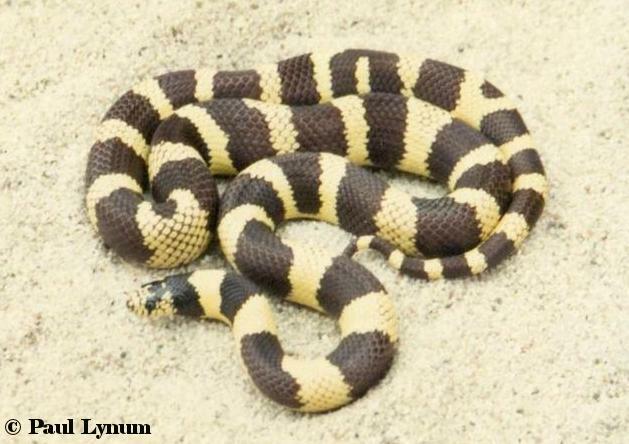 People often refer to yellow and brown banded Cal kings as chocolates, which can cause confusion. 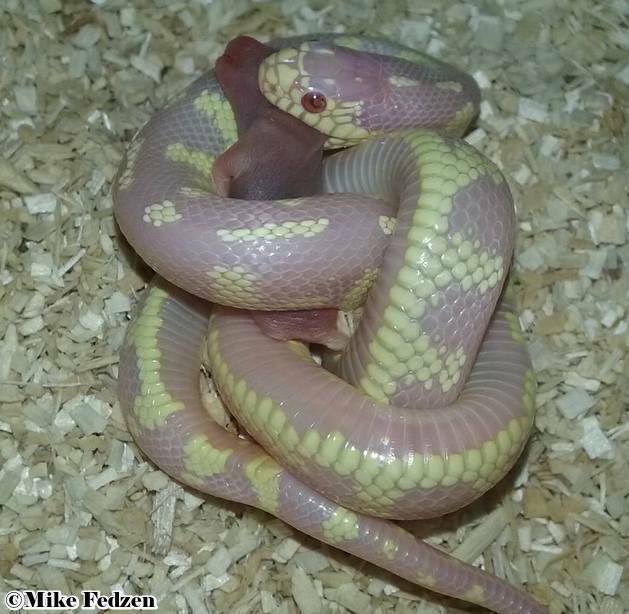 This morph has been used to create Blizzard and Purple passion morphs by combining this gene with other genes. 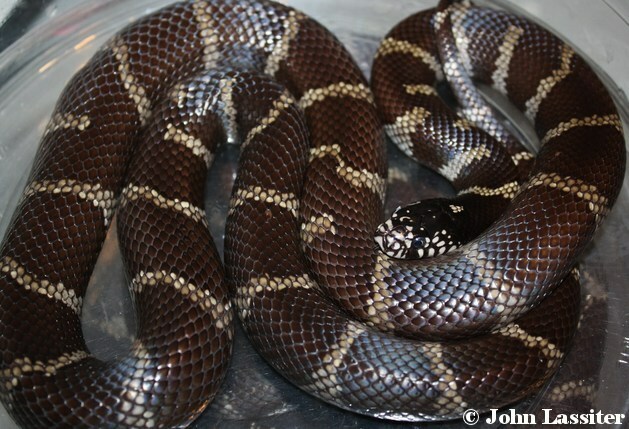 The belly pattern is solid black or brown. 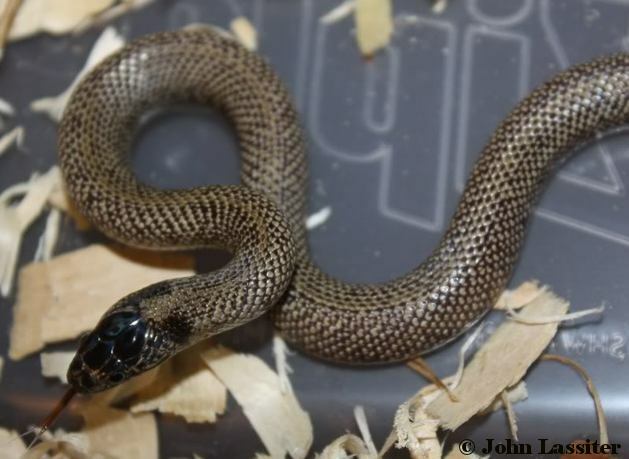 Juveniles appear more slender than other Cal king morphs, which may be due to coloring. 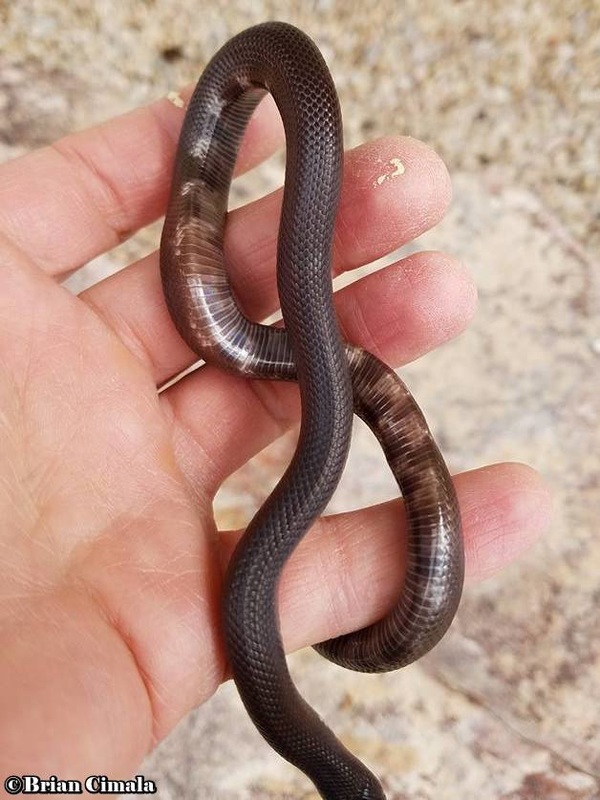 The dorsal pattern in this morph should be near patternless in adults. 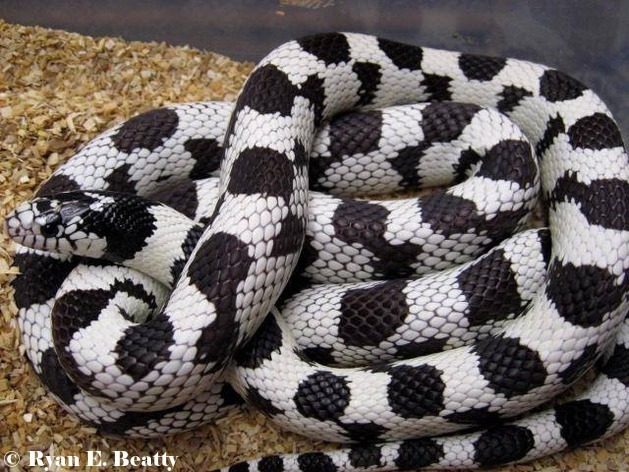 Any pattern that is visible can be from banded to aberrant. 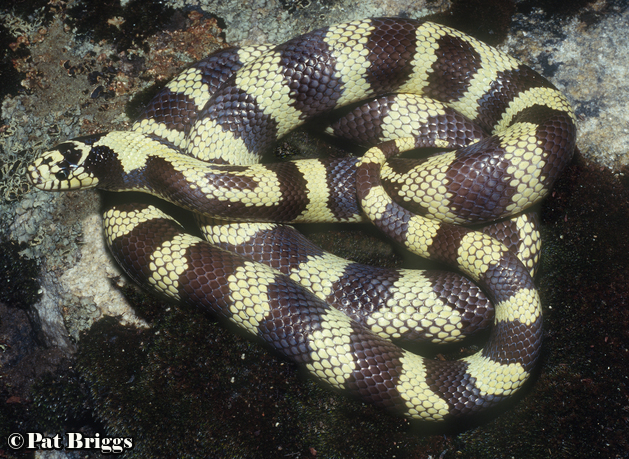 Allen Kazlaskia has a specimen that’s banded with nitida striping in the middle of its body. 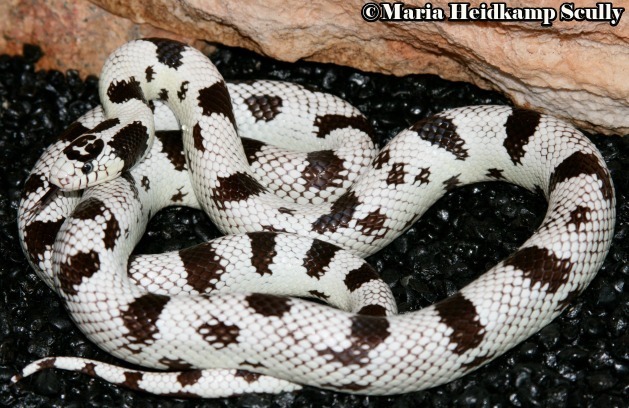 The pattern is easier to see in juveniles. 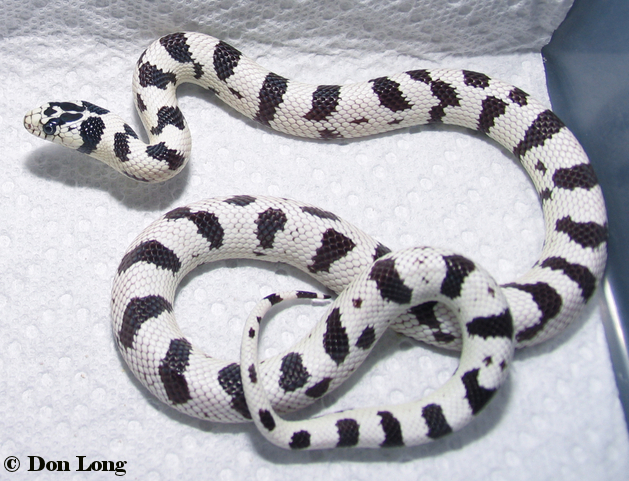 This morph is also sometimes referred to as an Arctic or Snow California kingsnake. 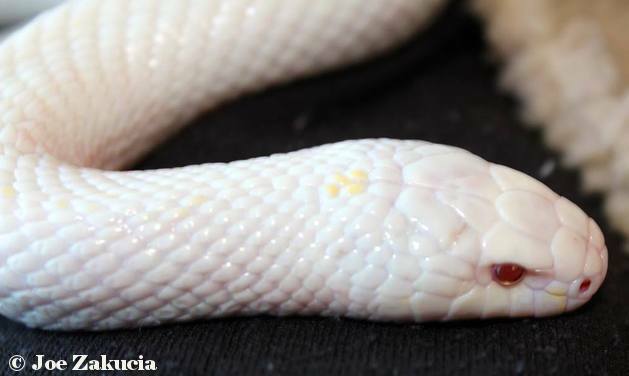 The Blizzard is a double homozygote expressing albino and hypermelanism at the same time. 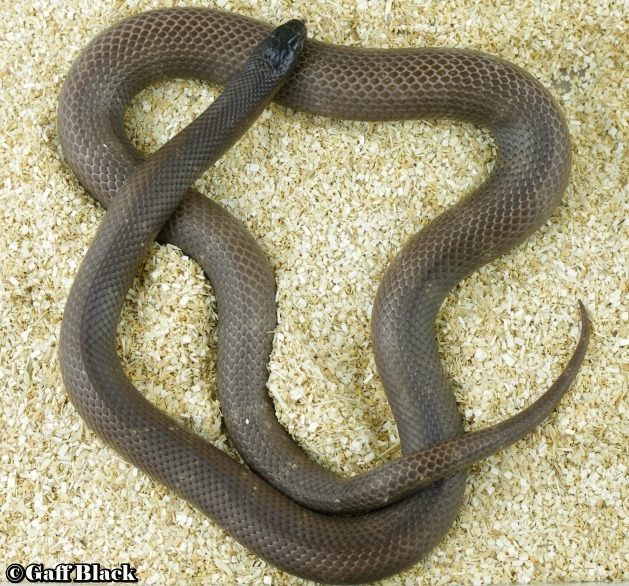 The chocolate morphs are most often used, because of their patternless look as adults. 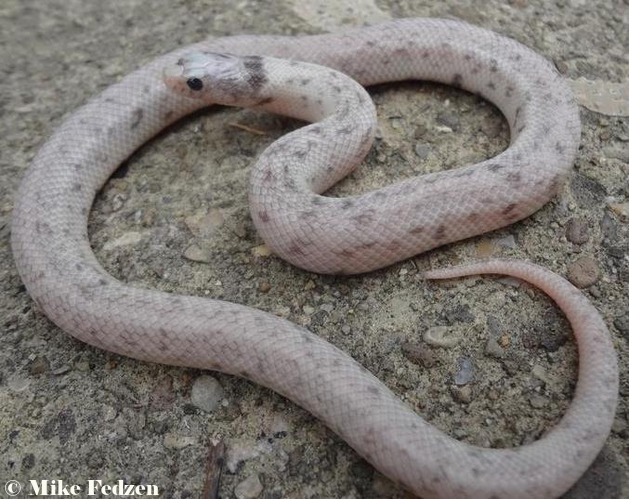 The origins of this morph may date back to the 1970's when Frank Retes first started breeding albinos to other morphs, including the Whittier hypermelanistic morph. 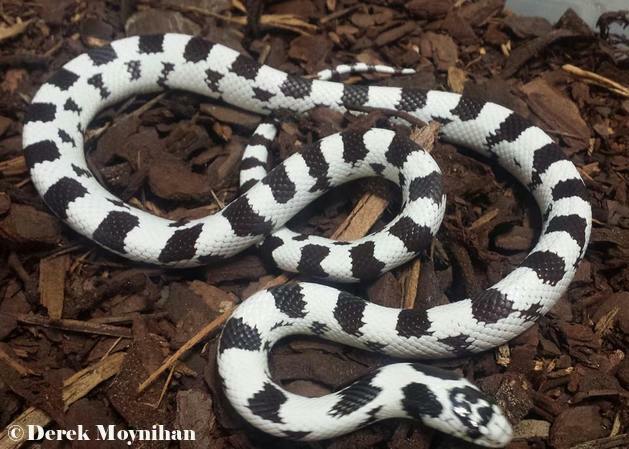 Its unknown if any of those double hets were bred together to create this double homozygous morph. I can’t verify that they were around earlier than the 90’s. 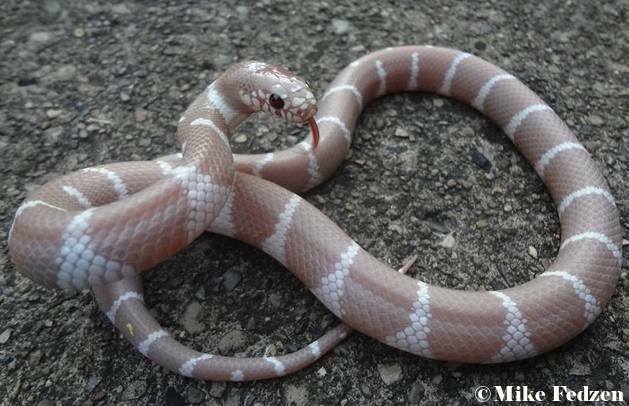 Juveniles are pink and lighten up to a very light lavender color. 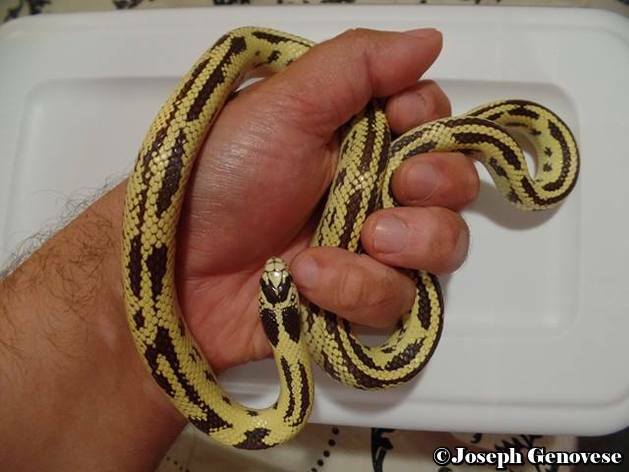 Often a small amount of yellow pattern shows through with age. 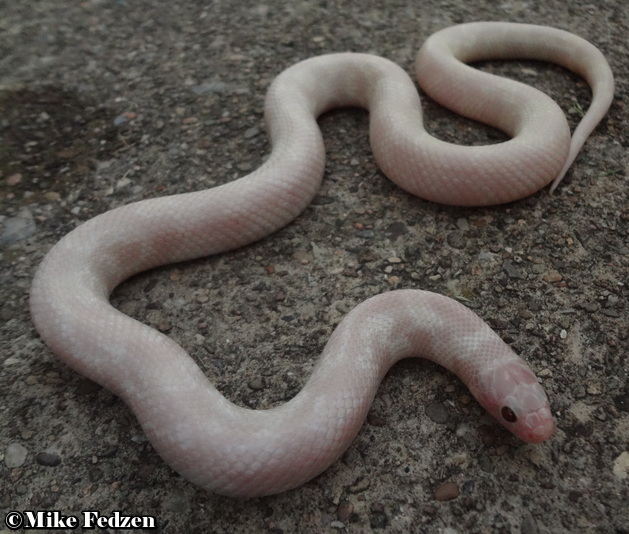 In 2008 a breeder in France paired up a blizzard (hypermelanistic X albino) with a chocolate. 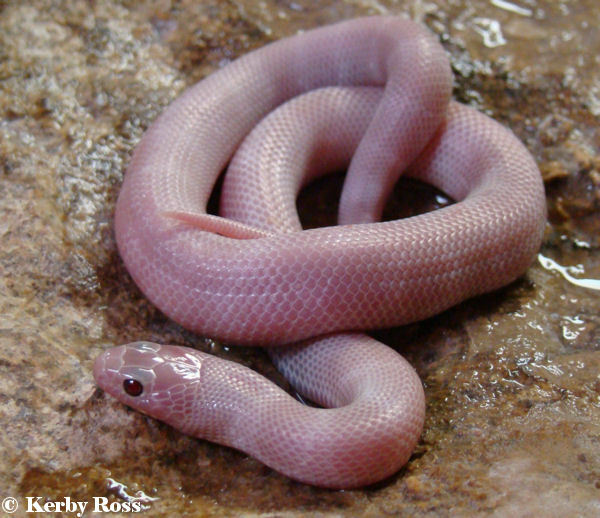 It turns out the chocolate was het for albino. He got chocolates and blizzards in the clutch. 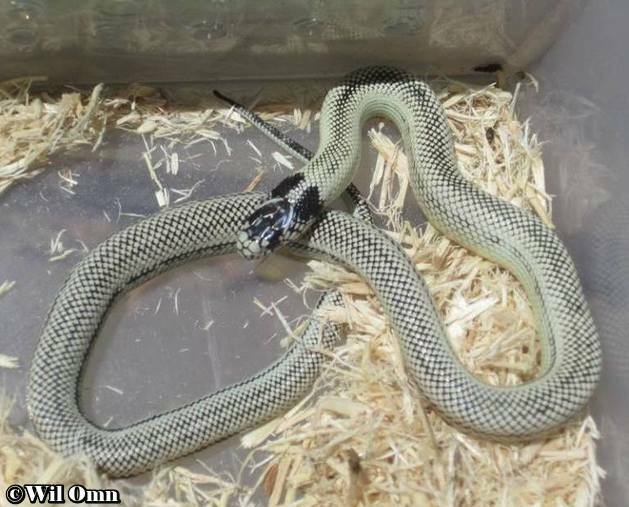 He also got a strange morph he had never seen that seemed to display both traits in a strange way. 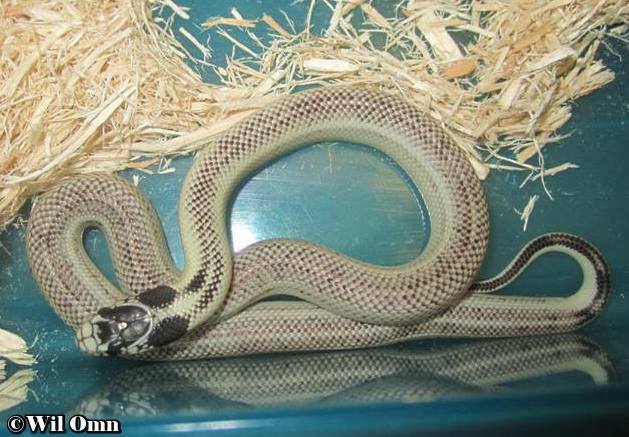 The following year, they produced two more of these strange kings from the same parents. They named this project jocker. I'm not sure what jocker means, but we have been calling them joker. 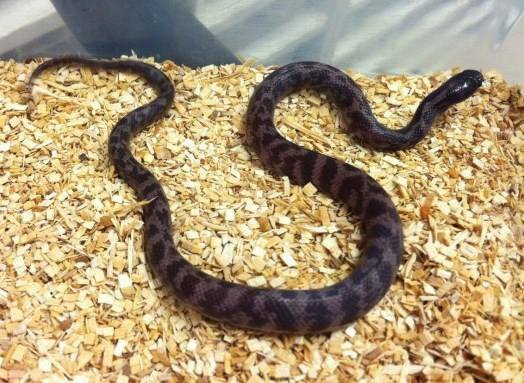 In 2014 a joker was bred to a possible het joker. That pairing produced another joker. 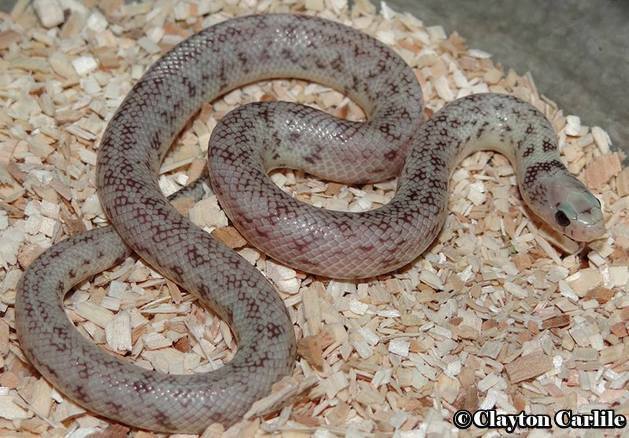 It appears to be a recessive trait, but its hard to explain how his blizzard and hypermel were both het for joker. 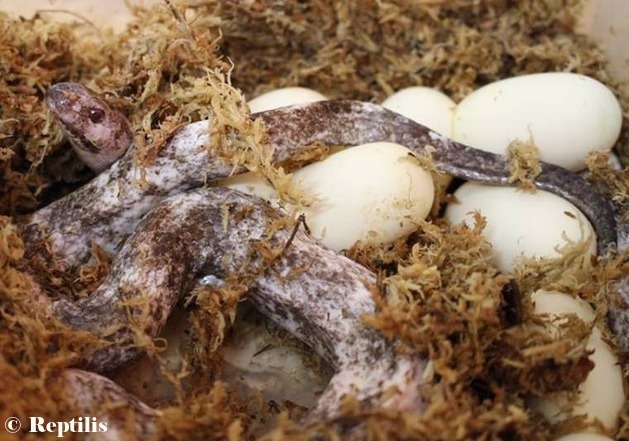 More test breedings need to take place to determine exactly how this trait is inherited. 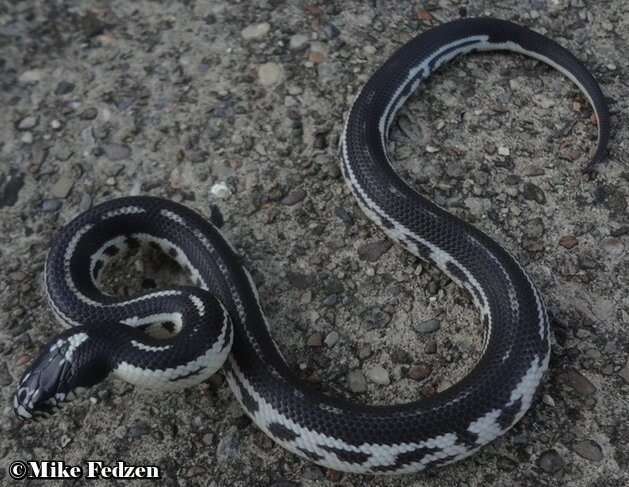 Mike Fedzen imported the first joker and possible het jokers into the U.S. Hopefully we will get some better answers in the next couple of years. 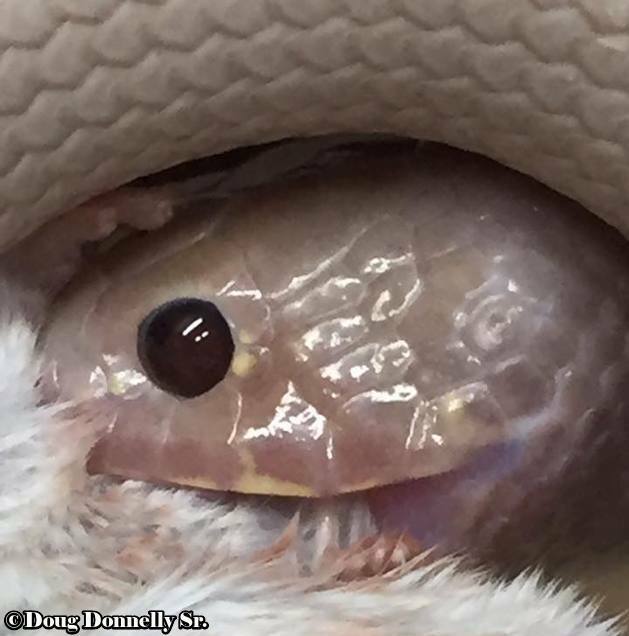 Mike says the pupils are orange, which is apparent in some photos. 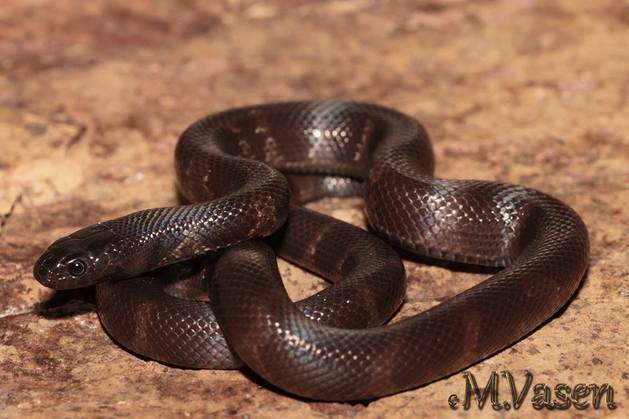 The hypermelanistic pattern shows through, in the form of a zig zag stripe, on one of the babies photoed below. 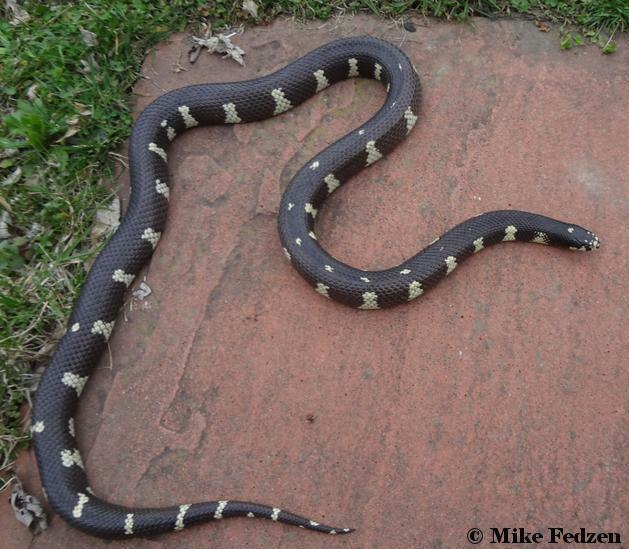 Mike says his adult shows a bit of yellow poking through the pattern, which is probably traces of the hypermelanistic pattern. That is also seen in blizzards. 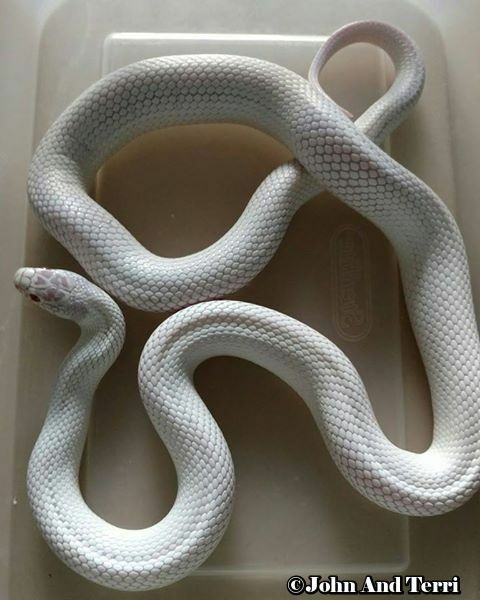 The snake looks like a paradox albino. In this case a paradox blizzard. 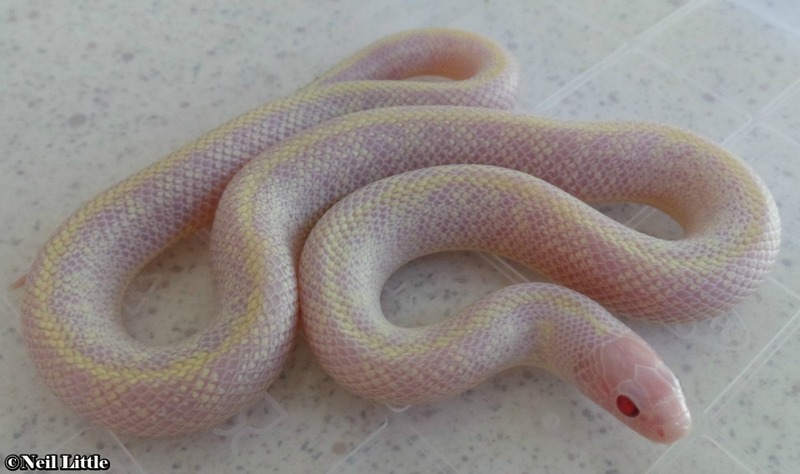 But the dark pattern is more speckled than what you see in other paradox albino snakes. 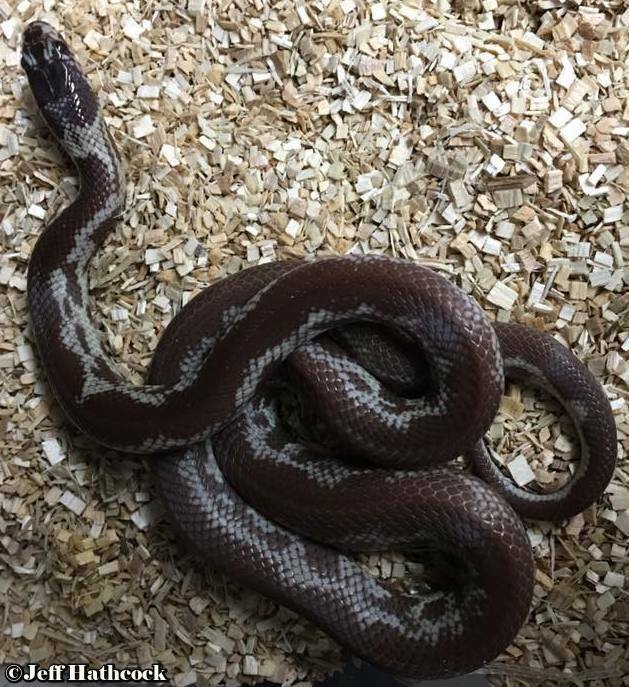 Update 2018, this gene is not recessive. 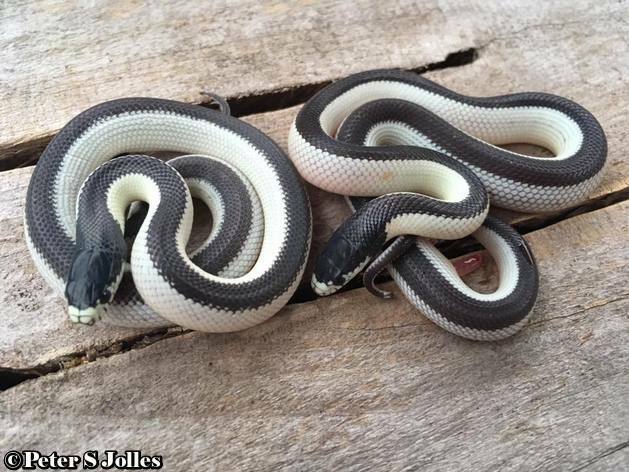 A pair of Jokers has produced an entire clutch of blizzards. 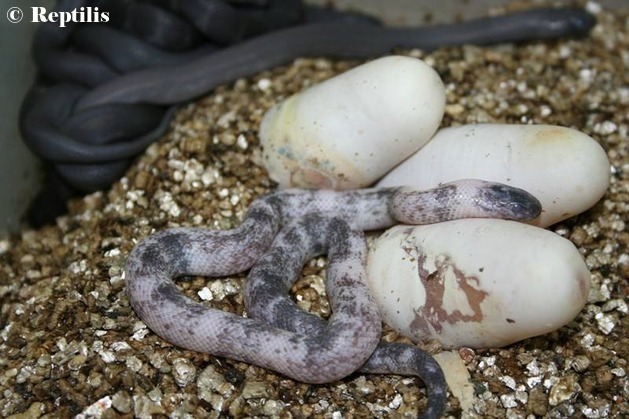 And the male Joker used in the pairing became gravid and laid several infertile eggs and was nearly egg bound, laying one or two a day over a weeks time. 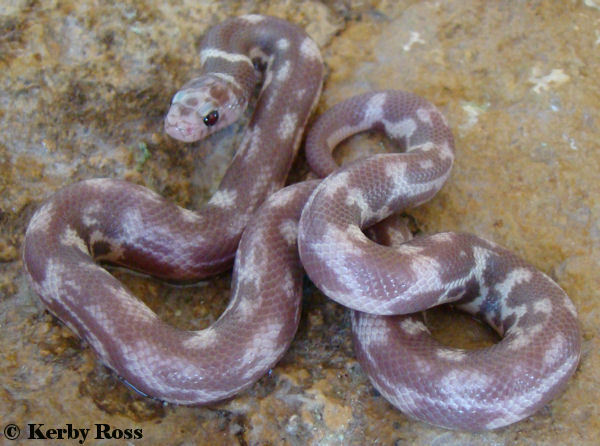 The purple passion is created by breeding a recessive hypermelanistic king to a Ruby eyed lavender. 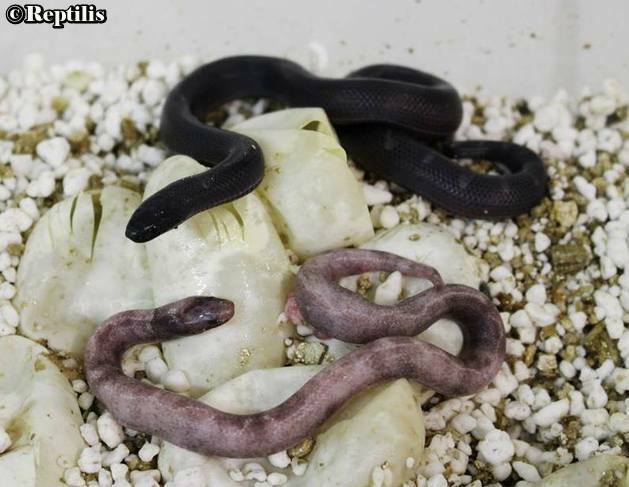 The young from this pairing will be double hets for both lavender and hypermelanism. 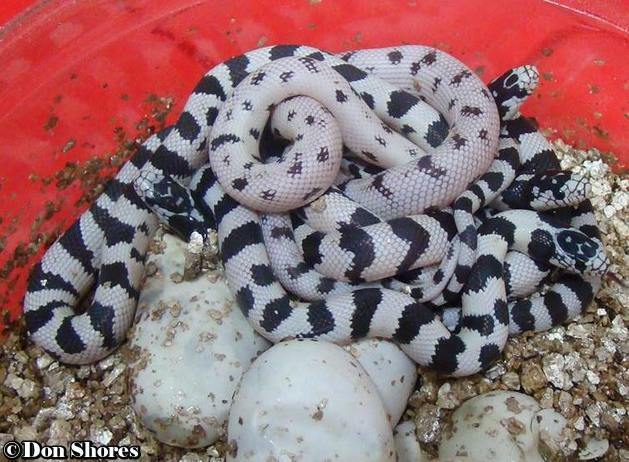 When those are eventually bred together, there is a 1 in 16 chance to produce a double homozygote, which is the purple passion. 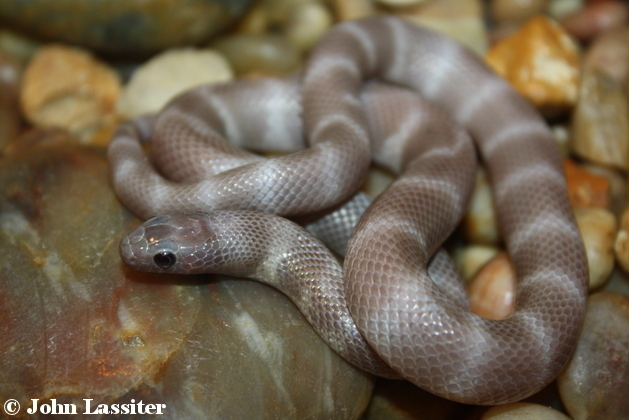 Their coloring as babies is a little darker than typical Ruby eyed lavenders by being more purple. 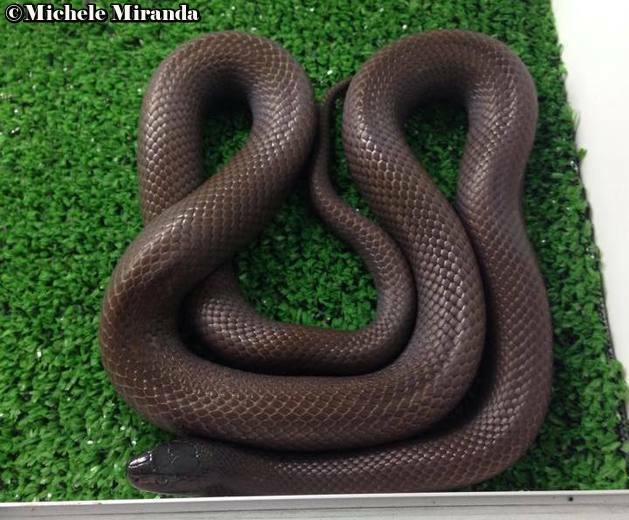 As adults they are a light tan or tanish lavender, which is caused by the hypermelanism. 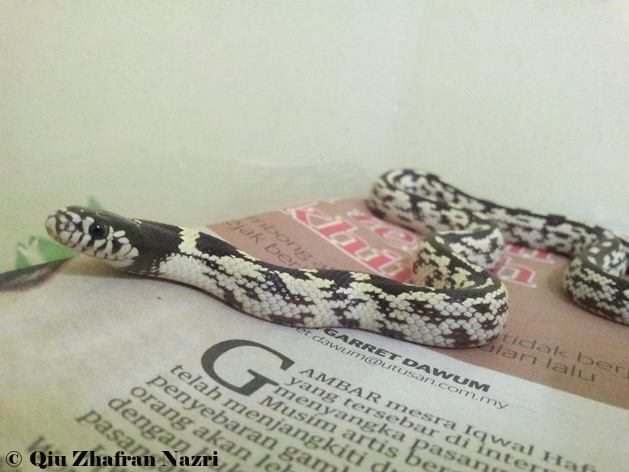 Any pattern they display depends on what hypermelanistic pattern type was used. 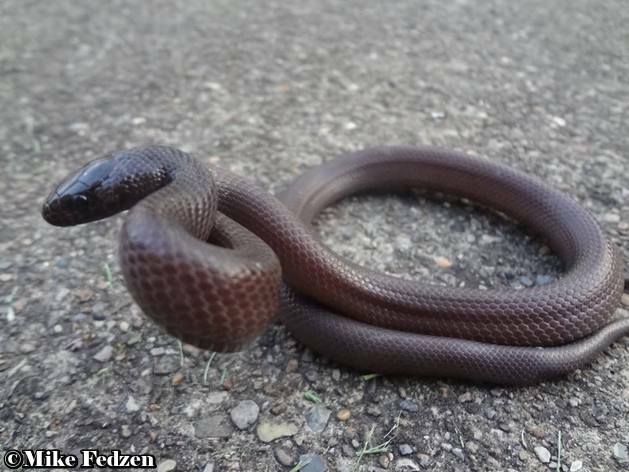 If it was a very dark almost patternless hypermelanistic king, they will show very little to no pattern. 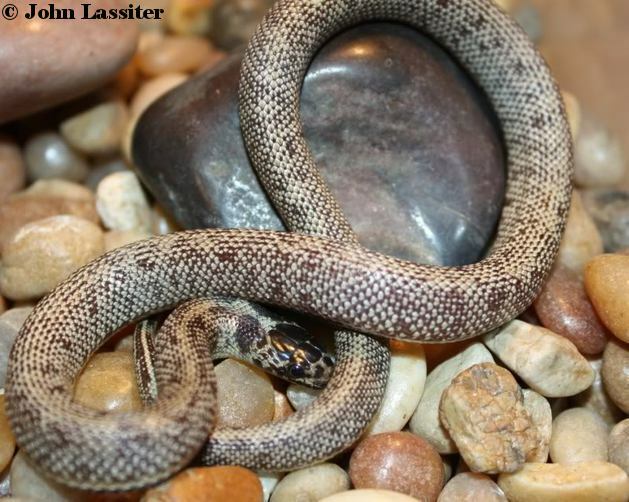 Pattern may be more obvious in juveniles than adults. 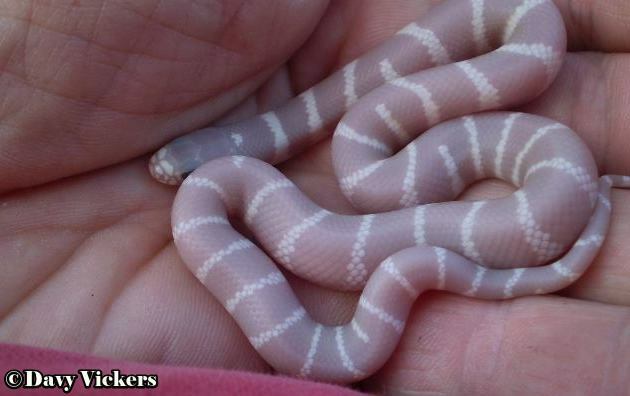 This morphs exact makeup is a bit of a mystery. 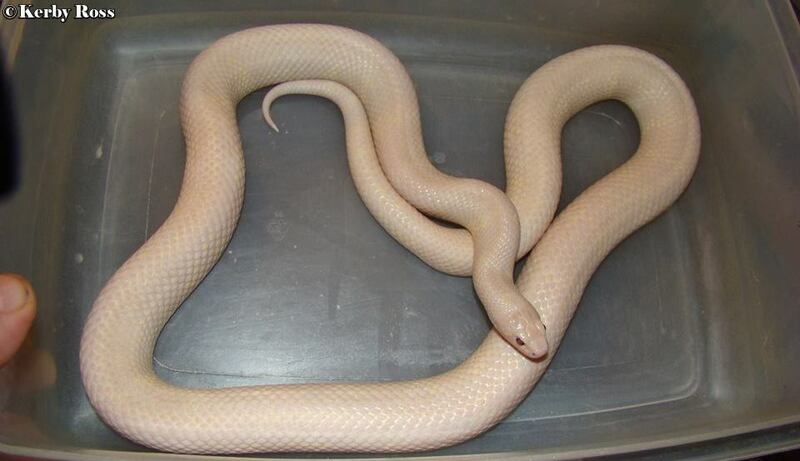 These were created by BHB and are said to be a lavender albino X hypermelanistic double homozygote. 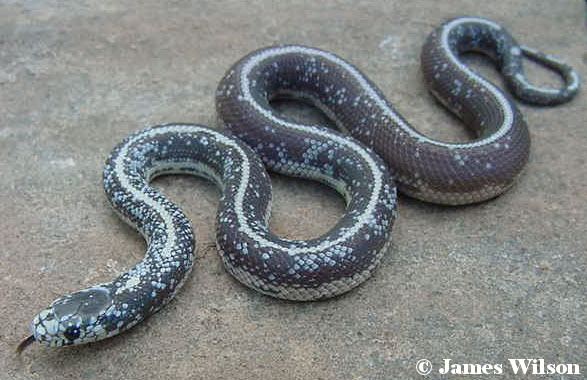 Some individuals are purple as juveniles, which is the mysterious part. BHB would not elaborate on what causes that, but maybe they just don't know. 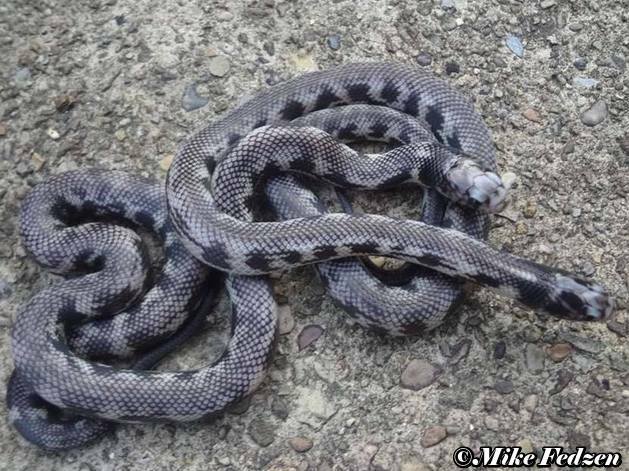 I've seen at least one picture of a juvenile striped king that was said to be lavender and was every bit as dark purple as these. 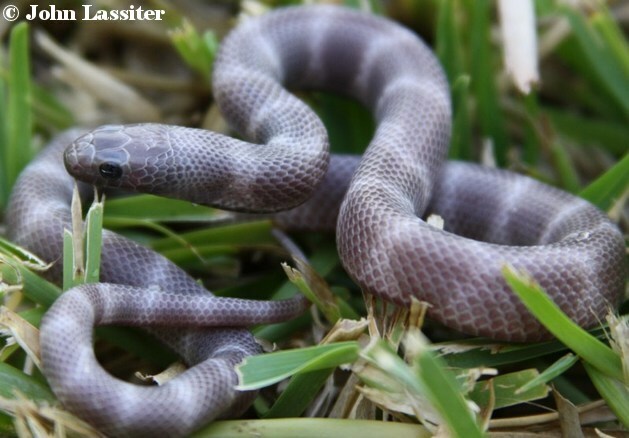 Other lines of purple passions don't come out this shade of purple, so it most likely has nothing to do with the lavender and hypermelanistic combination. 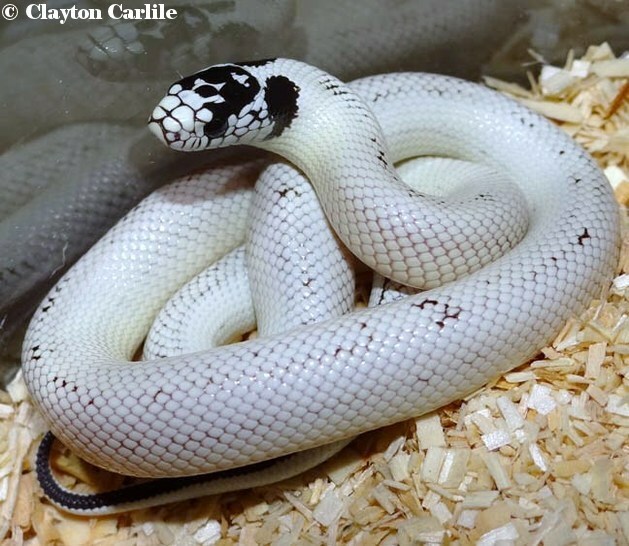 There are reports of introducing the lavender gene into desert phase (black & white) Cal kings that resulted in dark purple lavenders after the hets were raised and bred together. 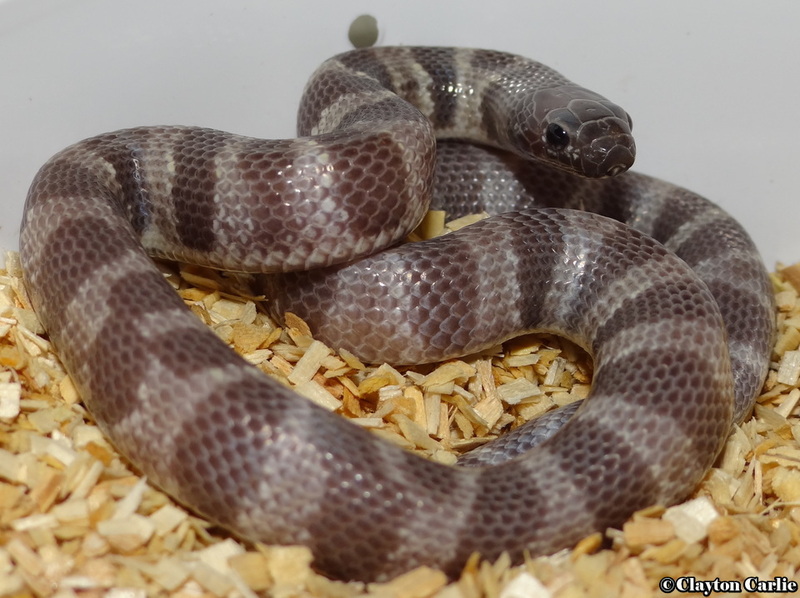 Maybe the variation in color from light brown to black in normal Cal kings is what's responsible for the variation from lavender to dark purple in lavenders. 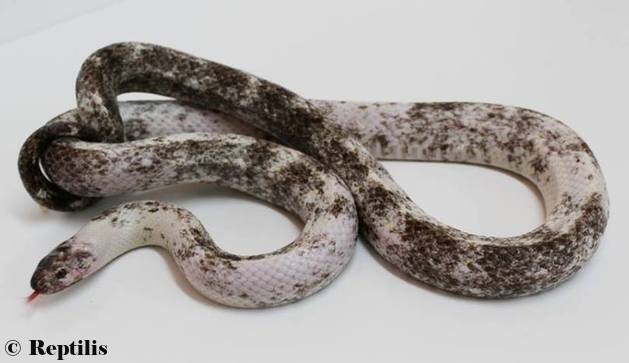 Tom Stevens is working with this line and has created a lavender snow with a known banded hypermelanistic pattern that may be the first of its kind. 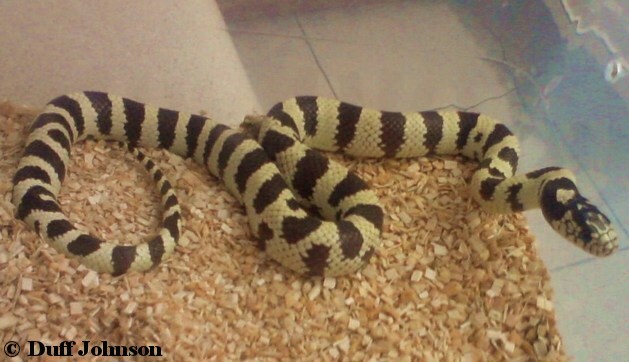 Tom calls this pattern tiger striped. 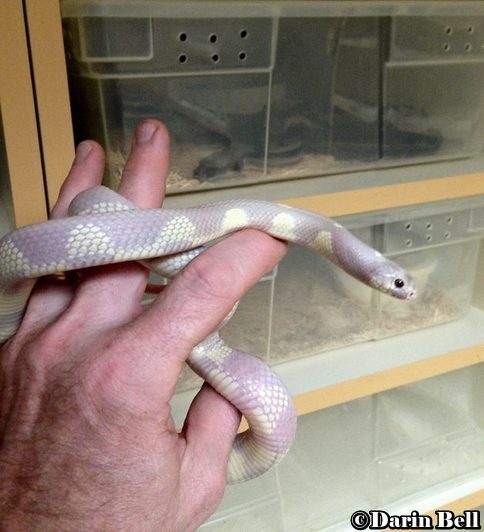 Lavender snows may also contain the albino gene. Adults may be identical to purple passions or a bit lighter shade of lavender. An underlying pattern is also visible. 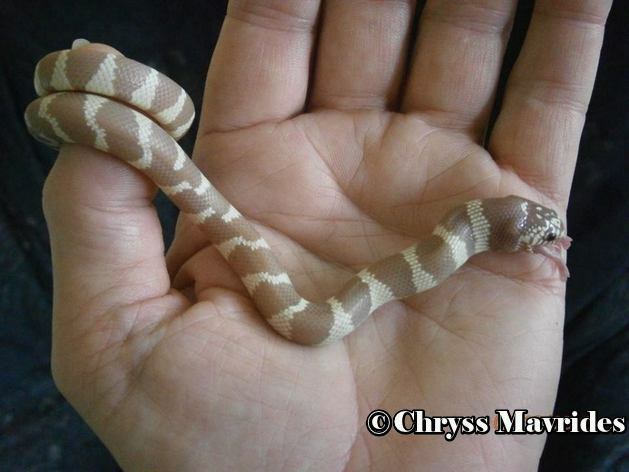 I tried contacting BHB several times for some history on this morph to no avail. 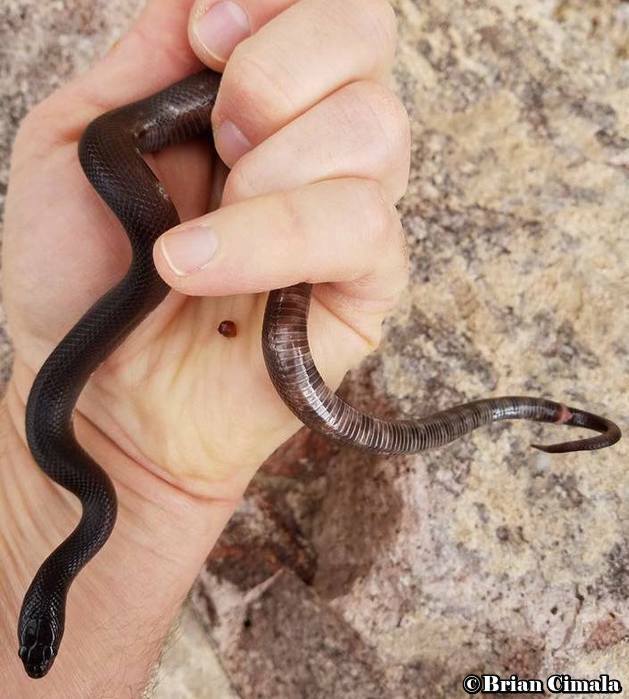 the dark areas in the light bands. 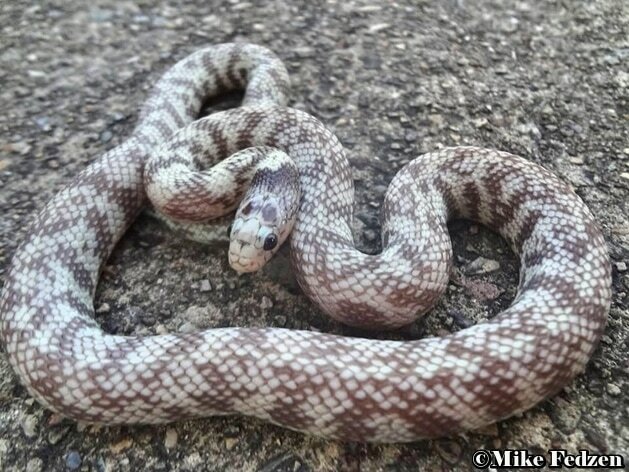 ​with normal lavenders, but for some reason this is common with lavender snows. 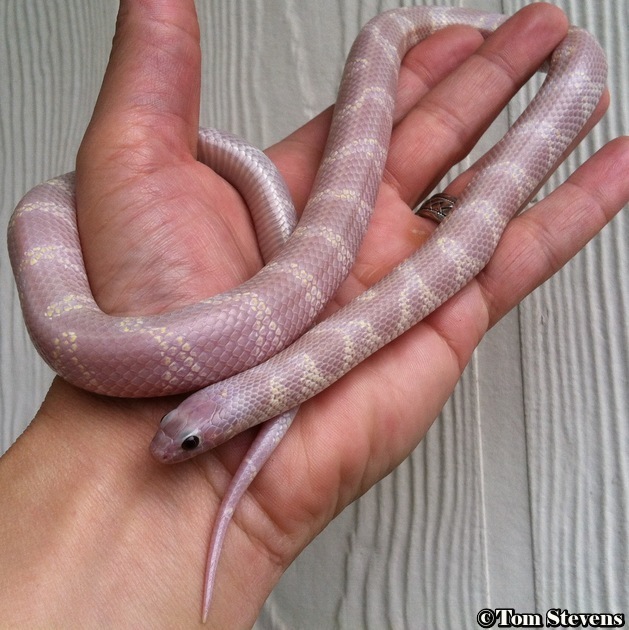 A lavender snow from BHB. The same as the one above after nearly a year. 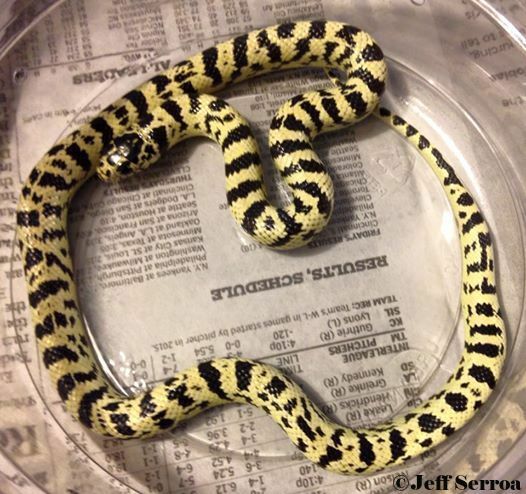 This morph displays the recessive hypermelanistic trait along with the co-dominant banana trait. 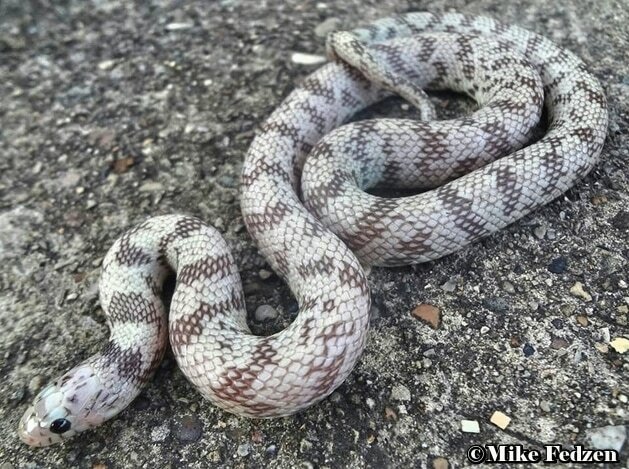 Don Shores originally produced this morph by breeding a banded hypermelanistic black belly male to a normal colored banded double het for Blizzard (hypermelanistic & albino) female. 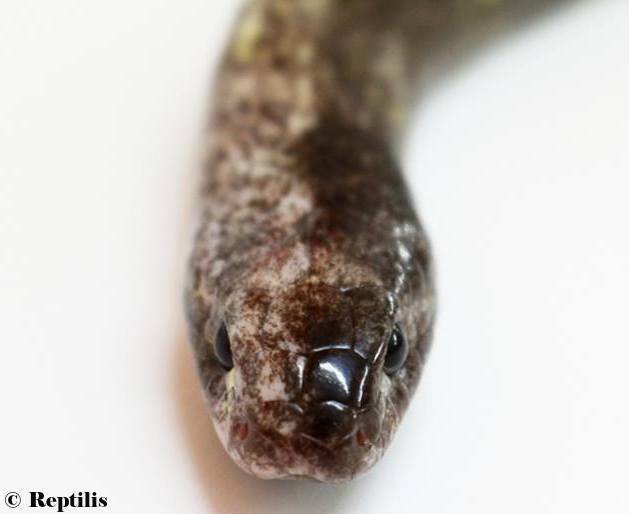 It is unknown to him where the banana trait came from, but these co-dominant genes have been known to be carried over from normal bandeds, that were in the same clutch with other co-dominant morphs, unnoticed. 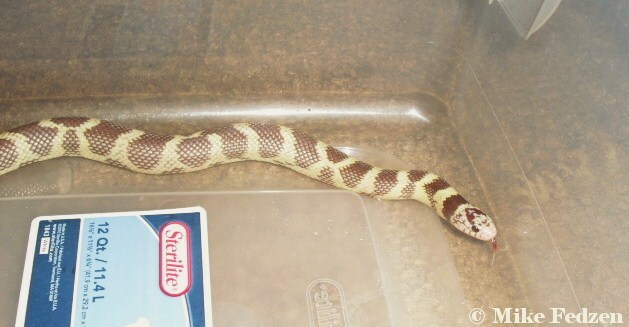 This just goes to show the rules are not always well defined in Cal king genetics. 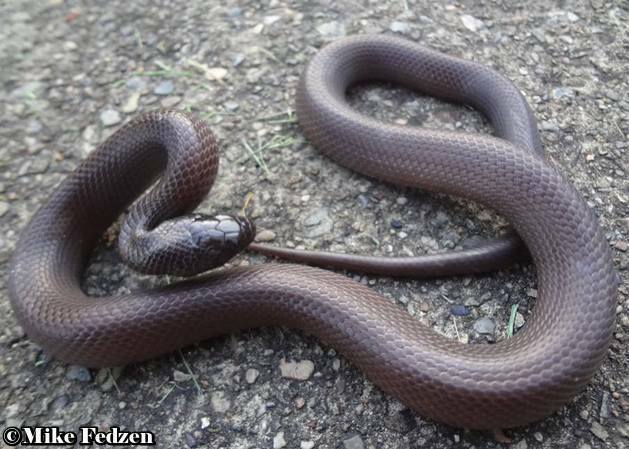 The light colored pigment in juveniles darkens to a light brown in adults. 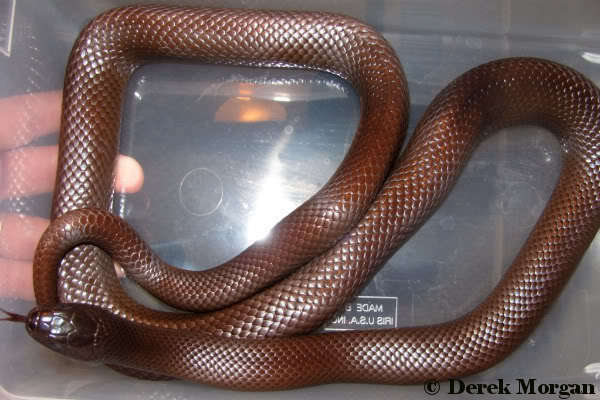 The belly is solid brown. 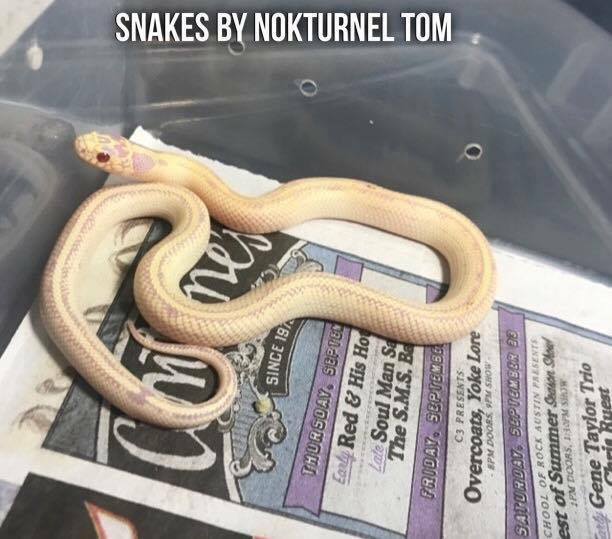 This morph was said to be bogus. 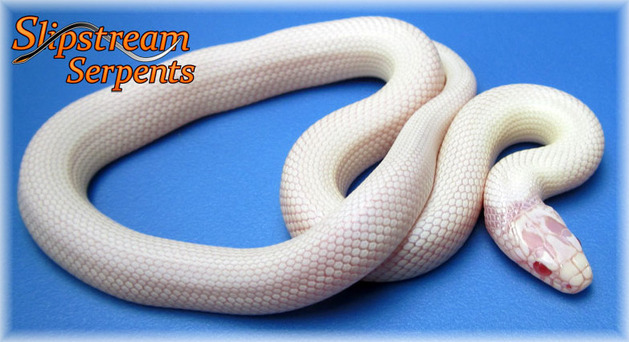 Its typical for this kind of variation from cream to white in the same clutch. Photo provided by James Tintle. 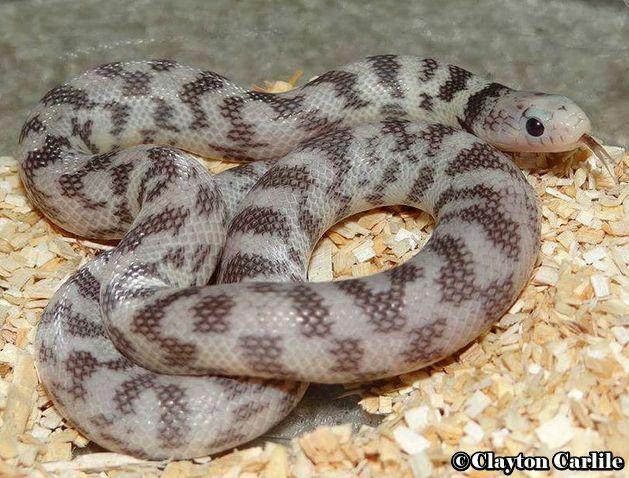 Also see the Brant Hypo, which has been called anerythristic in recent years. 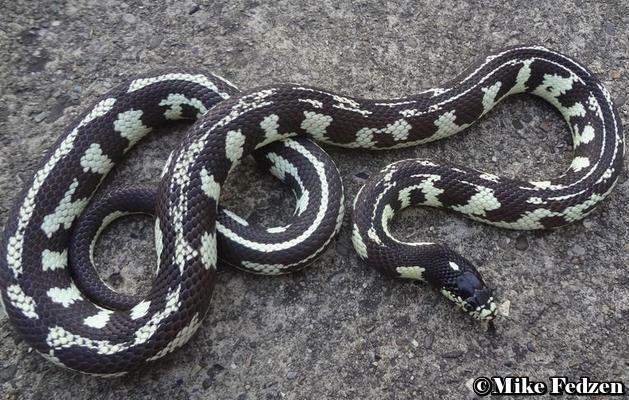 If you look closely, you will notice the white rings on some of these snakes has a more translucent waxy look to them. 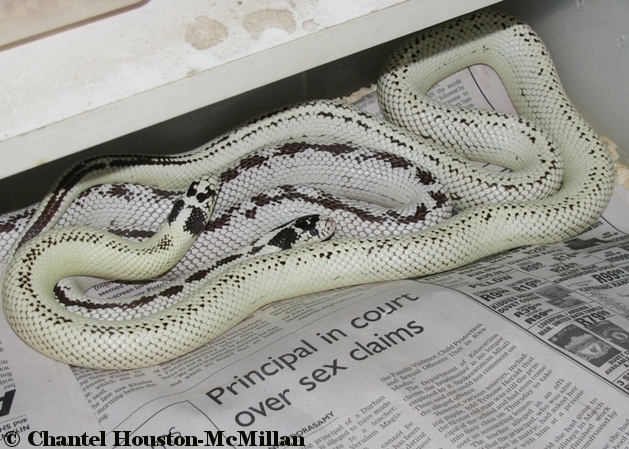 Those are supposed to be the axanthics in that clutch. 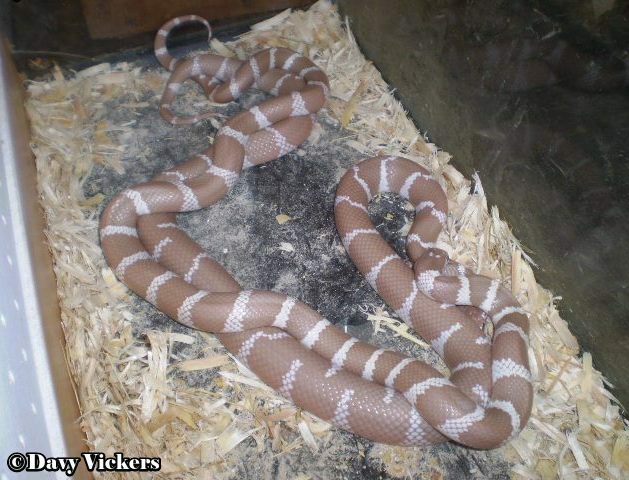 Rainer has a friend that claims these are true axanthic, but other breeders doubt the validity of this morph. 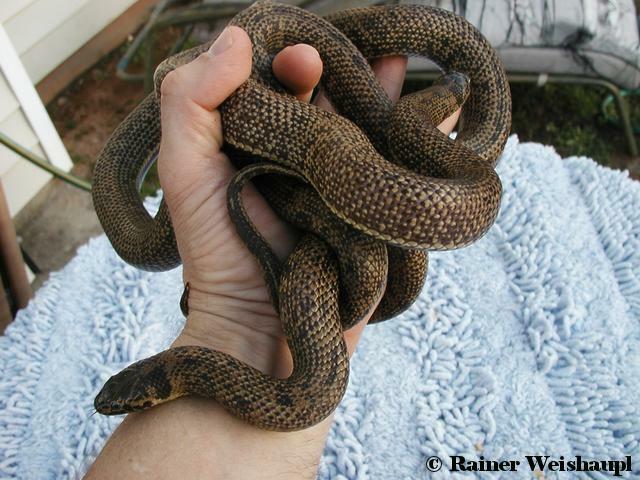 Rainer refuses to give the name of the breeder of these snakes and we can't shake it out of him. lol I have no opinion on whether they are the real deal or not. 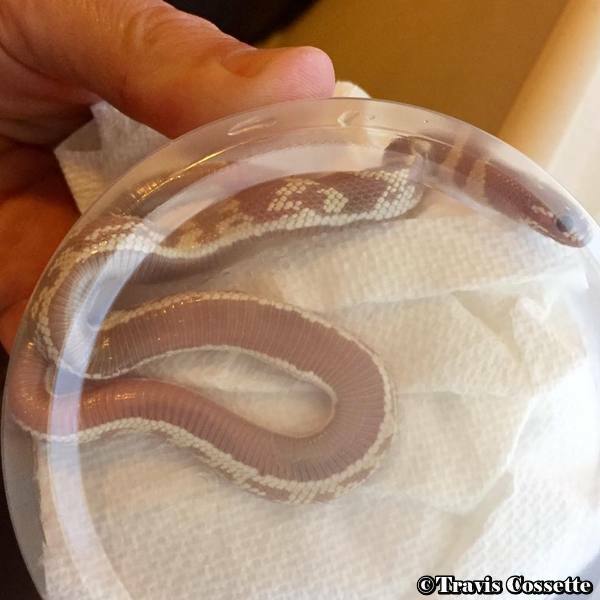 I do know a few years ago I produced a clutch just like this by crossing a wc SD mocha banded king with a wc Long Beach banded king. I didn't keep any of the offspring and don't have either of the parents any more. 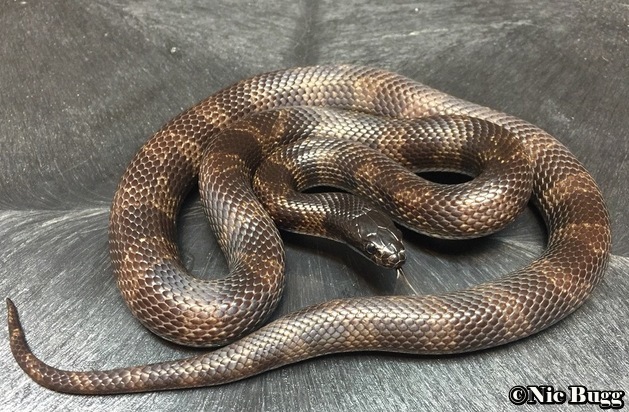 Update: I got a hold of this secret friend, and it turns out this axanthic look is what we find in a lot of Long Beach hypermelanistic snakes. Its one of those traits I haven't been able to figure out. 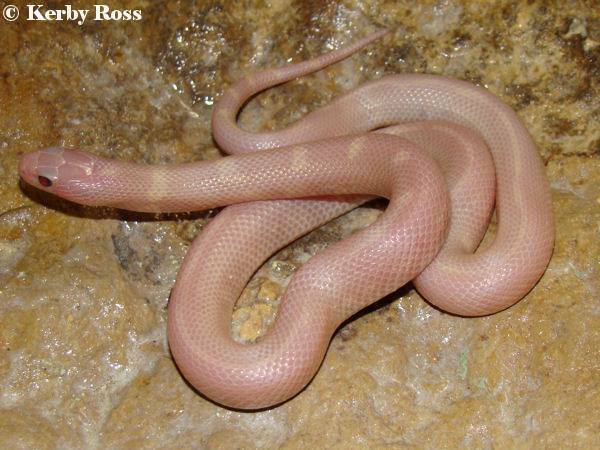 One thing I do know is that by the time the snake becomes an adult, some slight color does develop in this waxy white. 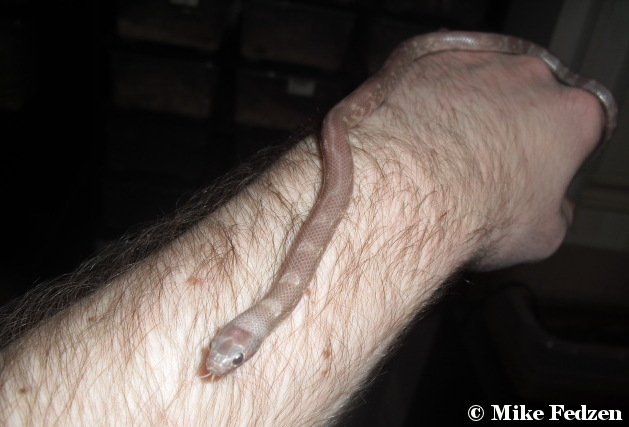 Lou Boyer's mud morph is a good example. 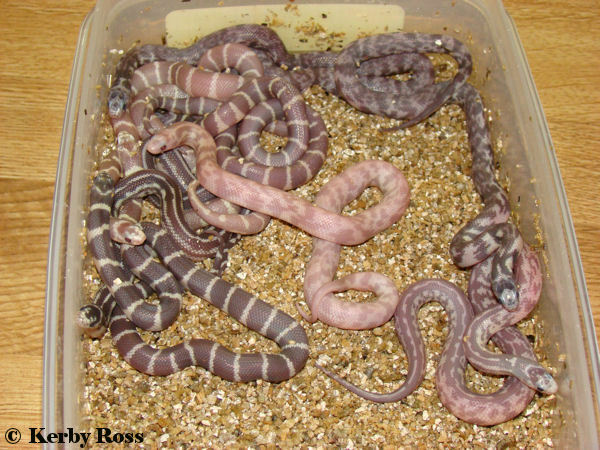 Also my friend Duff Johnson hatched some baby Yuma kings (see bellow) from AZ that showed the same thing. 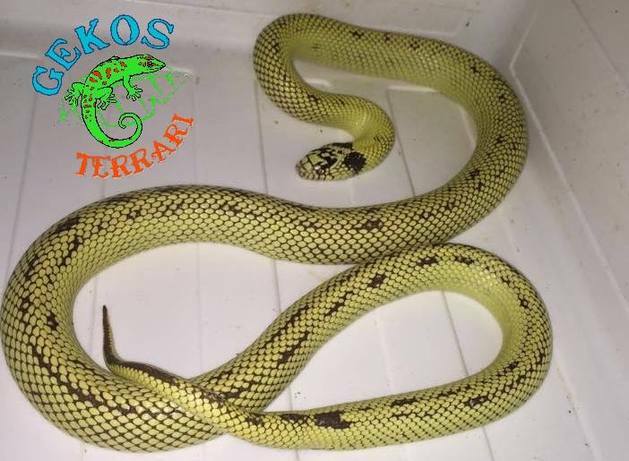 These snakes in the photo above are also Yumas and ironically, I couldn't get the owner of the snakes, who claimed to have these "axanthics", to send me pictures of an adult. 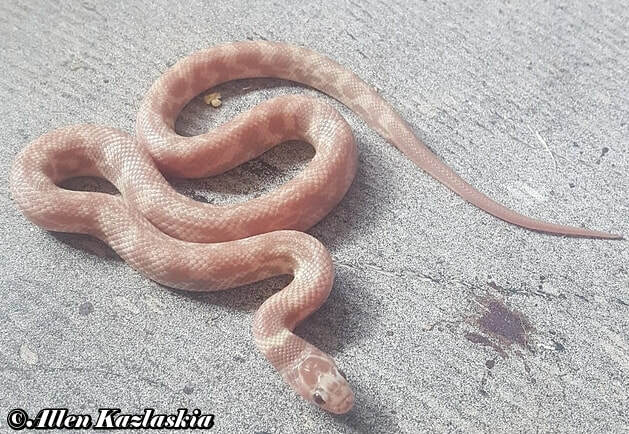 This morph was originally created by Davy Vickers when he bred a yellow banded Lavender albino (Ruby eyed Lavender) to a chocolate brown hypermelanistic Cal king. 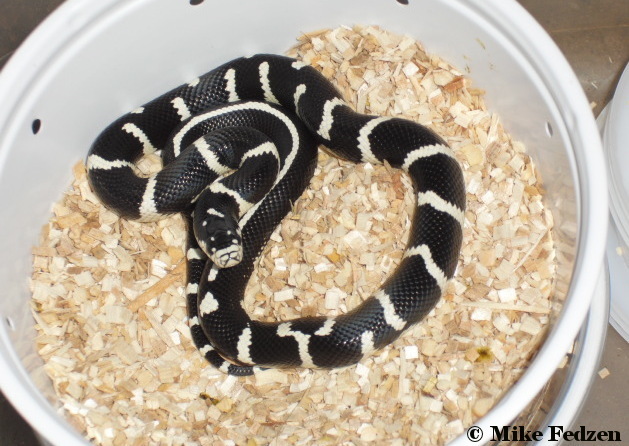 The results were double hets (lavender & hypermelanism). 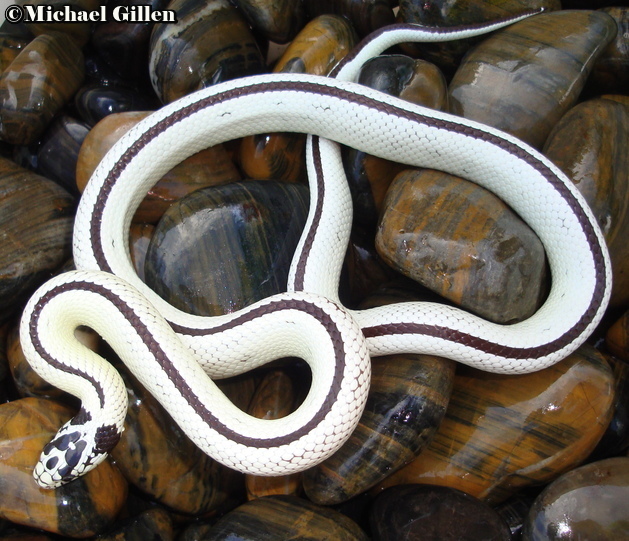 The hets showed variation from white to yellow and this may have been because the normal form for the hypermelanistic parent was white banded instead of yellow. 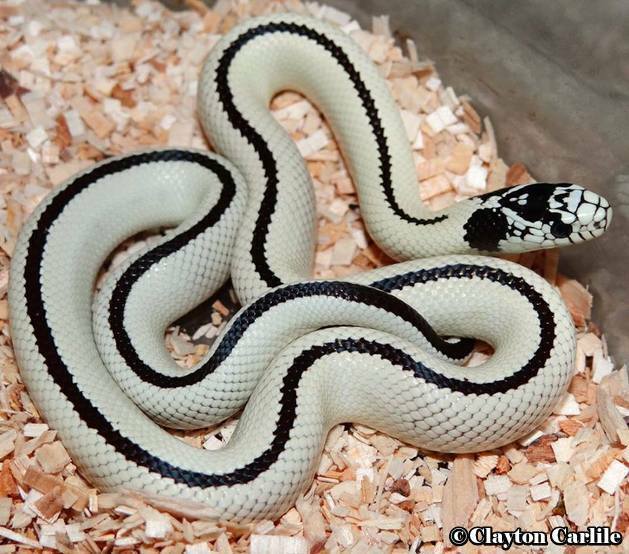 The white banded double hets were selected and bred to one another. 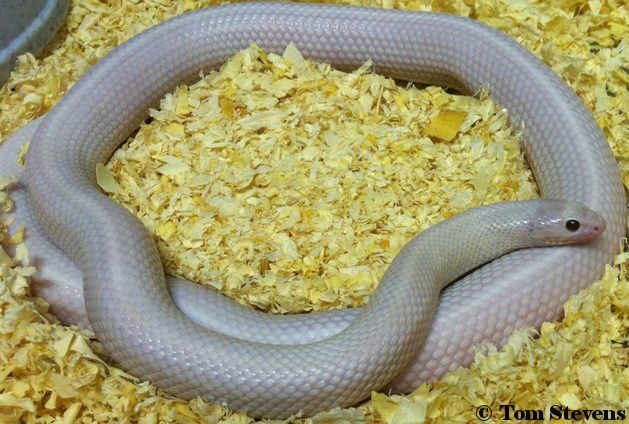 This breeding resulted in 1 Purple Passion (lavender and hyper double homozygote) and some white banded lavenders, which were later named Platinums. 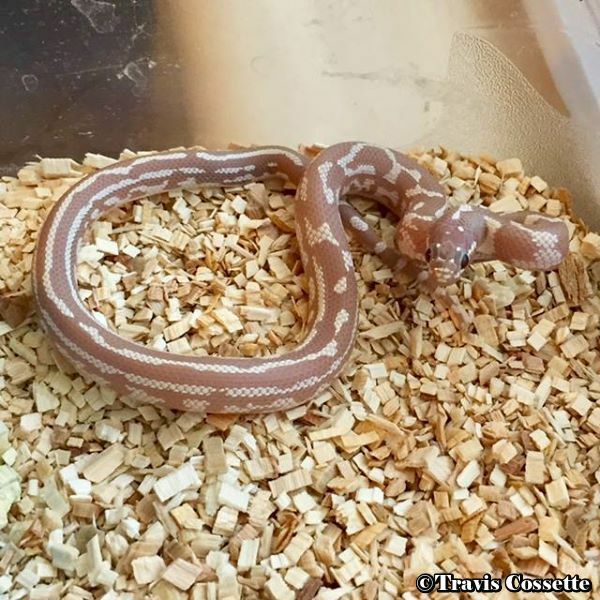 Jeff Serrao is working with this morph and is back breeding them to desert phase in hopes of getting whiter banded individuals. 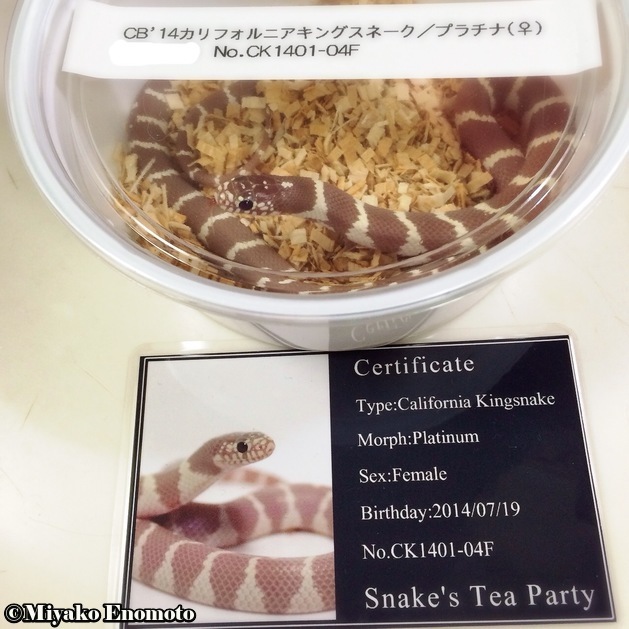 Platnums have made it to the Japanese market. 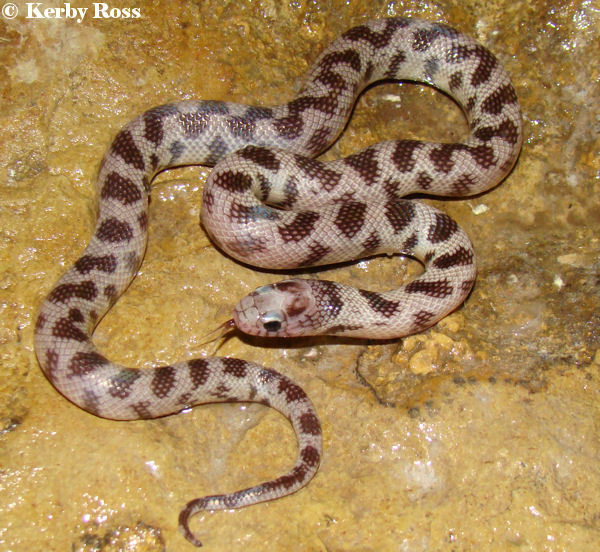 Kerby has produced some really nice first timers. 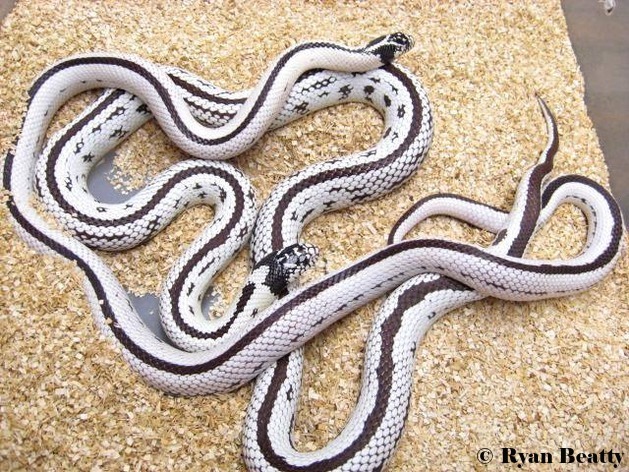 These are all Palomar Ghosts, but three of them are Palomar Ghost double homozygote's. 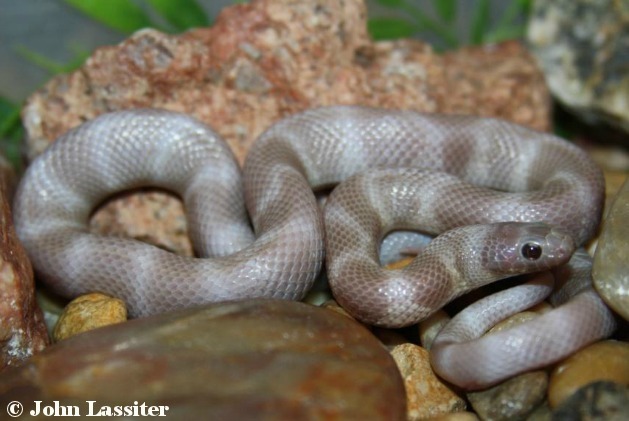 For example, the Casper Ghost is expressing two genes at the same time. 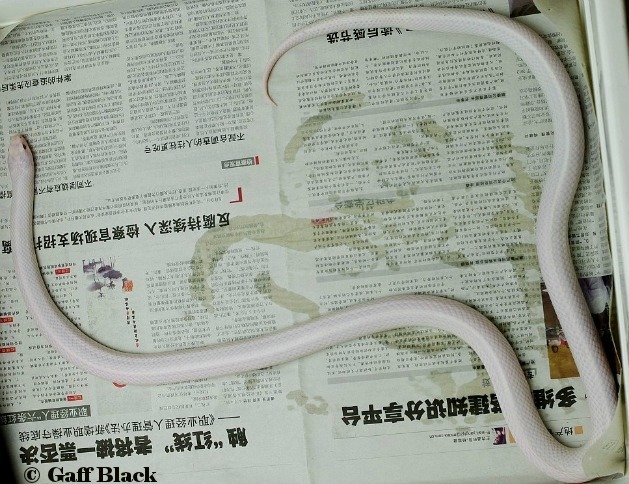 Those genes are Albino and Palomar Ghost. 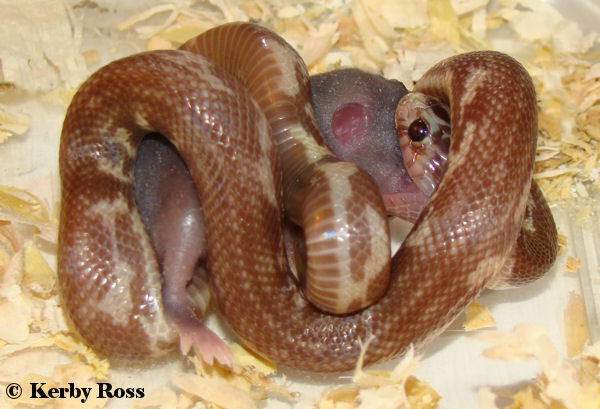 Kerby Ross is the leading authority in Cal king genetics, you can find his website here_. 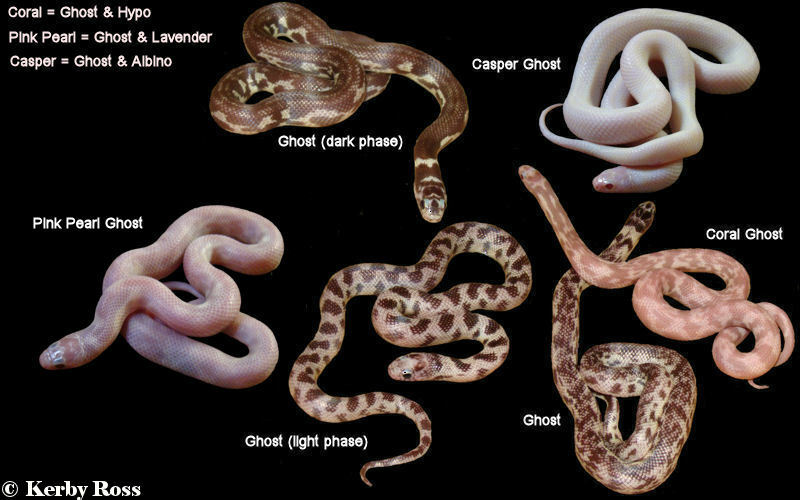 The dark phase is a name given to those ghosts with a mostly solid pattern above. 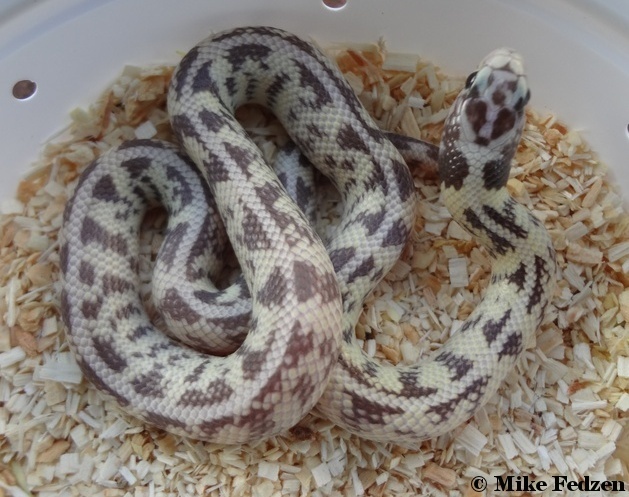 Long time Cal king breeder Kerby Ross has taken the Palomar ghost morph and created new looks for it. In 2002, he purchased a pair of Palomar ghosts from BHB. 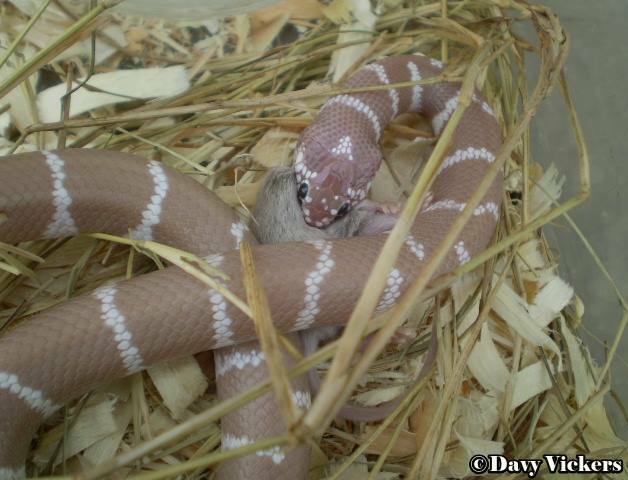 He was unable to successfully breed them, because the female always tried to eat the male. 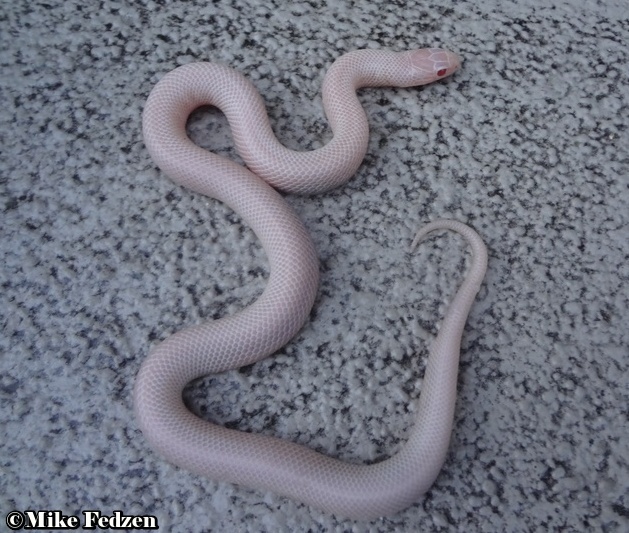 In 2005, he bred his female ghost to a high white albino male. 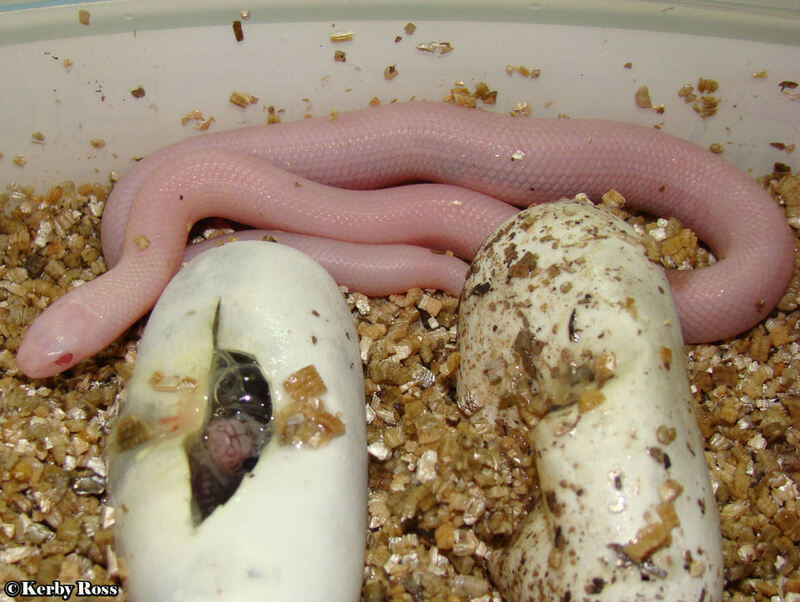 She proved to be het albino when the clutch hatched out some albinos. 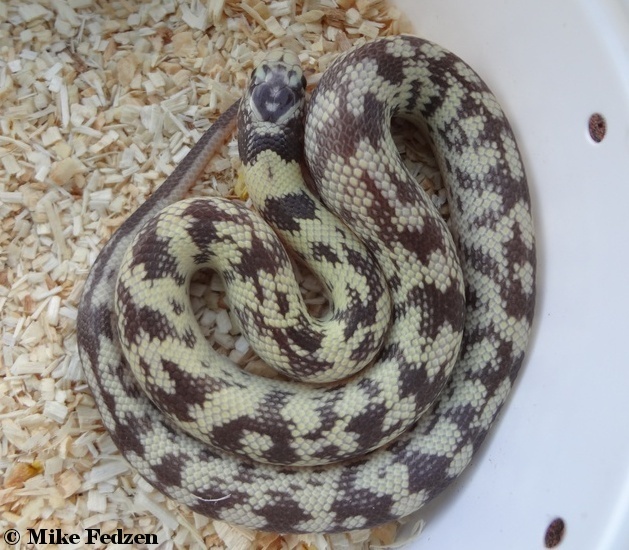 All were het for Palomar ghost and albino. Some were aberrant from the high white gene. 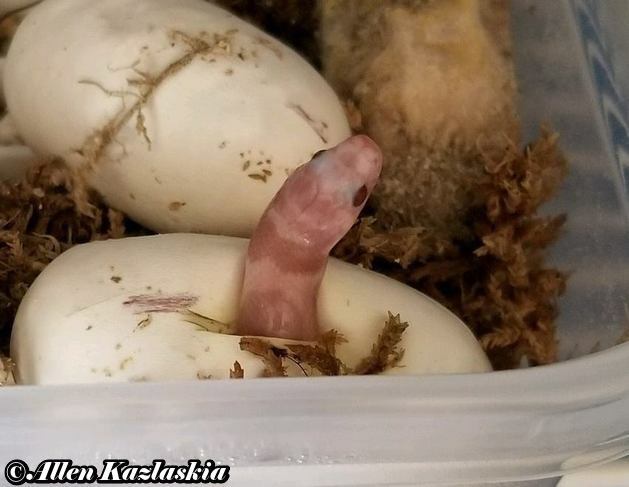 Kerby then raised up a high white albino from that clutch that was het ghost and bred it to its aberrant sibling that was double het for ghost and albino and also to another female that was double het for hypermelanism and ghost. These breedings took place in 2010. 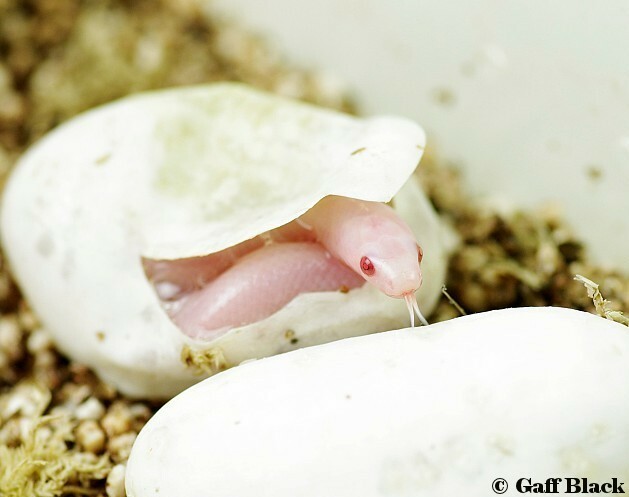 In each clutch he produced what he coined the light phase ghost. 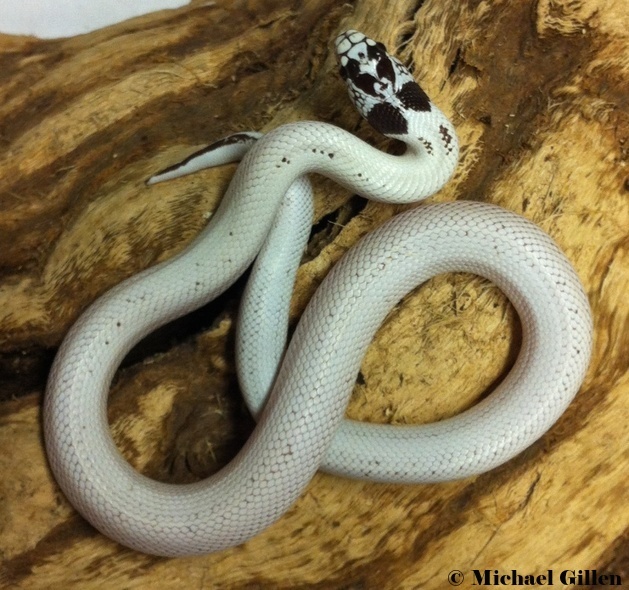 This is a Palomar ghost expressing the high white gene, which greatly reduces the typical Palomar ghost pattern. 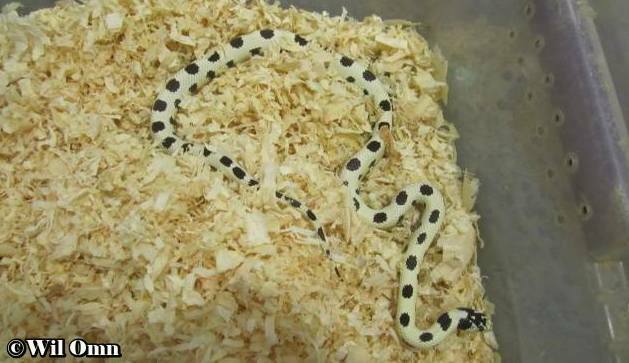 The pattern can consist of small blotches to nearly patternless. 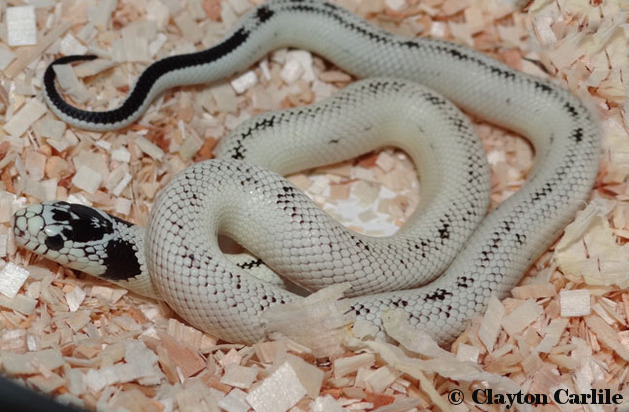 The head pattern is also affected by being extremely reduced resulting in a nearly solid white head. produced one like this since. 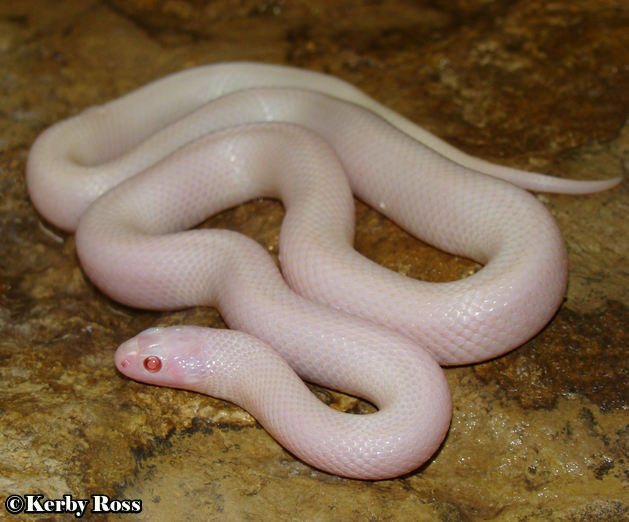 In 2009, Kerby took his 2005 albino het for ghost male and bred it another 2005 double het for ghost and albino female. 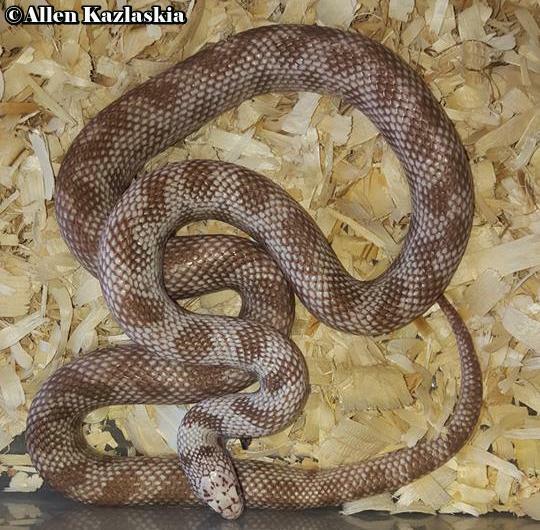 With this breeding, he produced the first double homozygous morph expressing Palomar ghost and albino at the same time. 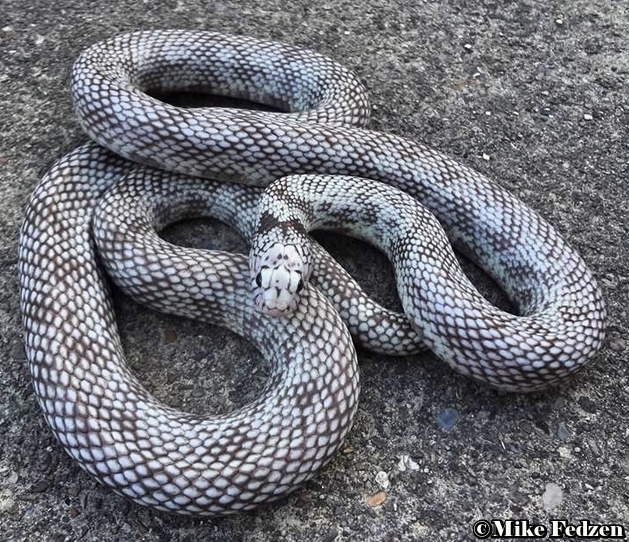 Kerby named this the Casper California kingsnake also known as a Casper ghost. 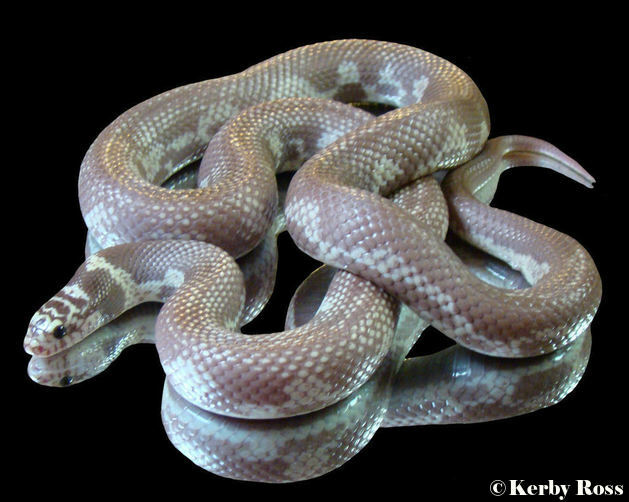 In 2008, Kerby bred a Palomar ghost to a JD lavender. 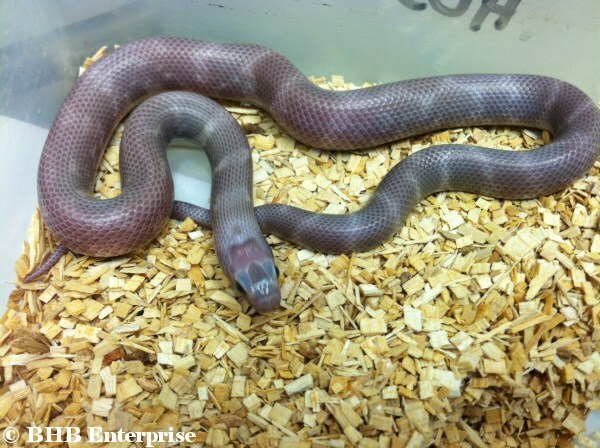 The offspring were double hets and some looked dark purple. 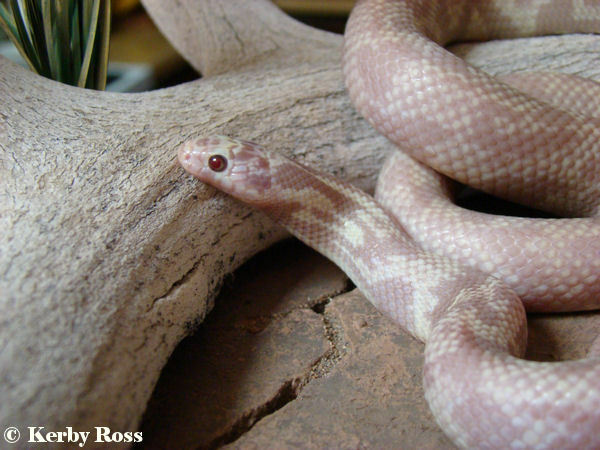 In 2011, he bred these double hets together to produce the first Lavender Palomar ghost. 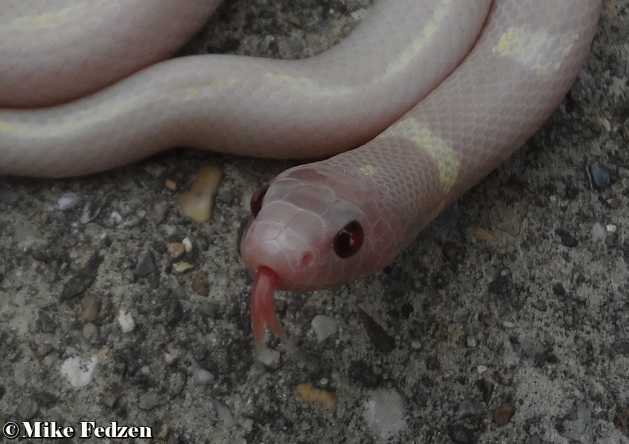 He named this double homozygous morph the Pink pearl ghost. These are basically a JD lavender Cal king with the Palomar ghost pattern. 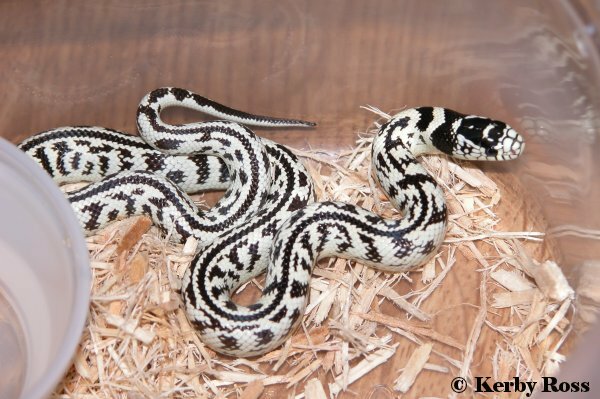 In 2006, Kerby bred his Corwin hypo male to his Palomar ghost het albino female to produce double hets that were possible het albino. 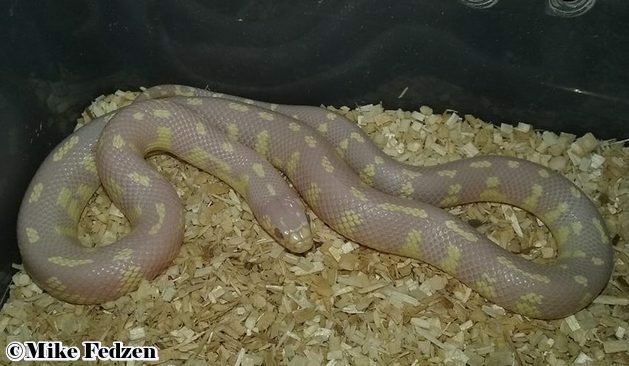 In 2010 he bred three pairs of these hets together and with two of those clutches, he hit the jackpot by producing the first JR lavender Palomar ghost double homozygous morphs. He named them the Coral ghost. 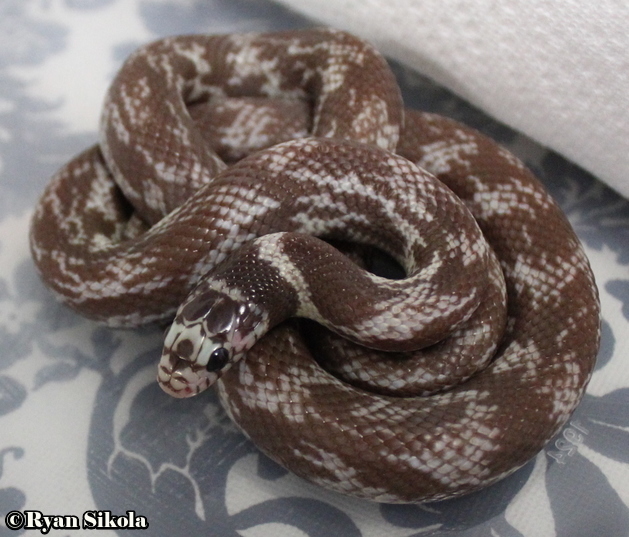 (hypo x ghost) double homozygote. 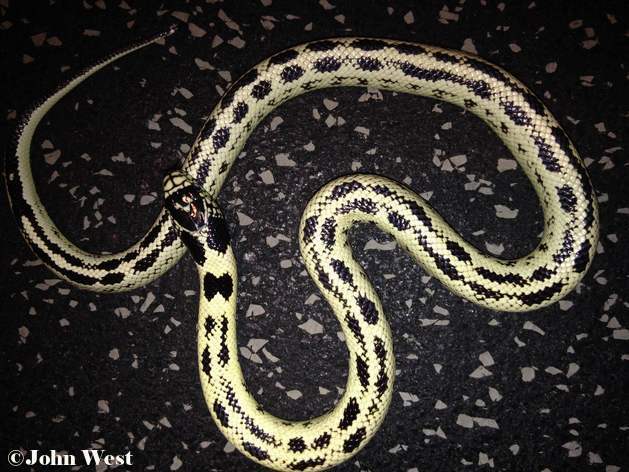 In 2014 Kerby Ross bred a Male Palomar ghost to a female BEB and produced double hets. 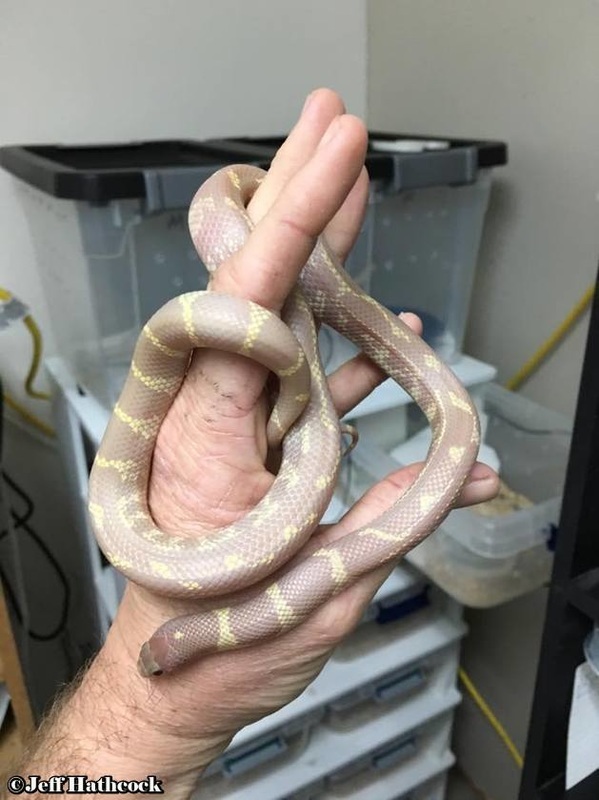 Allen then hatched this Sapphire ghost from a pair of those double hets in 2018 to produce the first ever Blue eyed blond Palomar ghost. 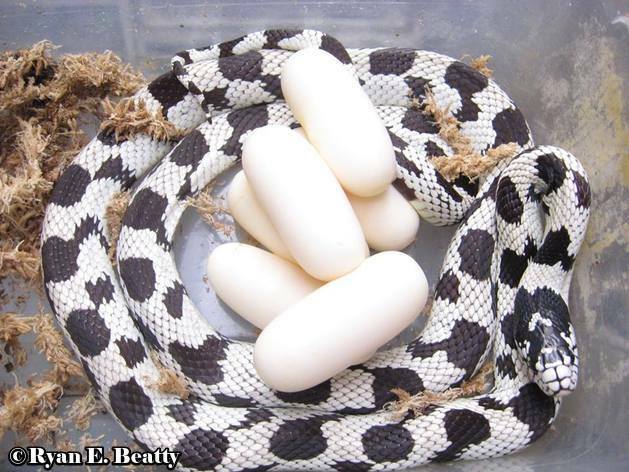 These were produced from parents that were aberrant and het for Palomar ghost. The parents also came from a mosaic but they did't have a very strong mosaic look to them. 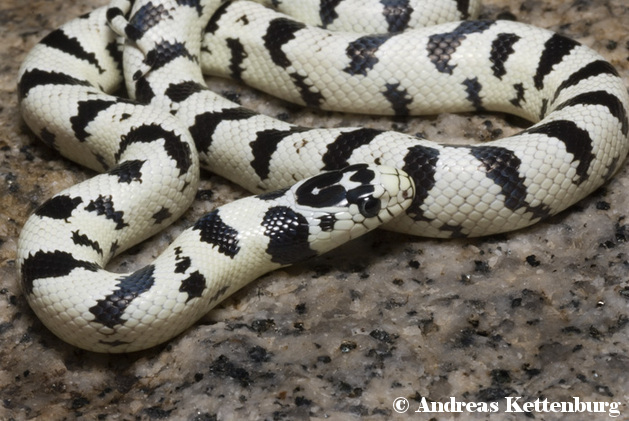 Its possible even better mosaic ghosts could be produced, but its hard to say, because the Palomar gene is always going to have some pattern influence that might not allow a perfect mosaic pattern on a ghost. 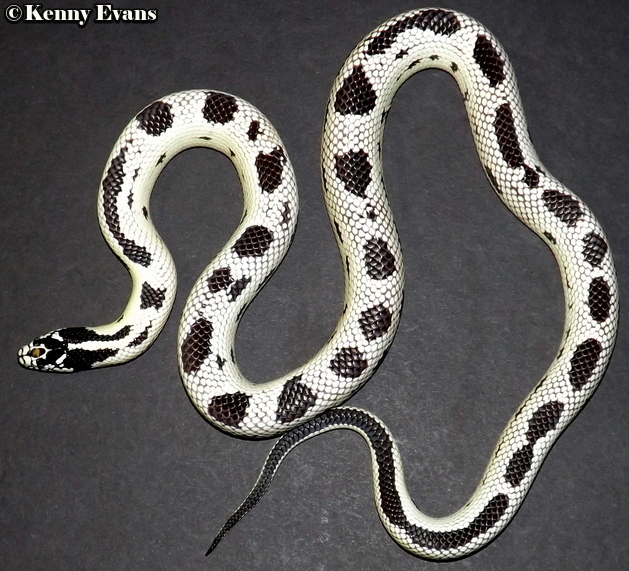 Kings that are het for a single recessive gene never show signs or markers for that gene. 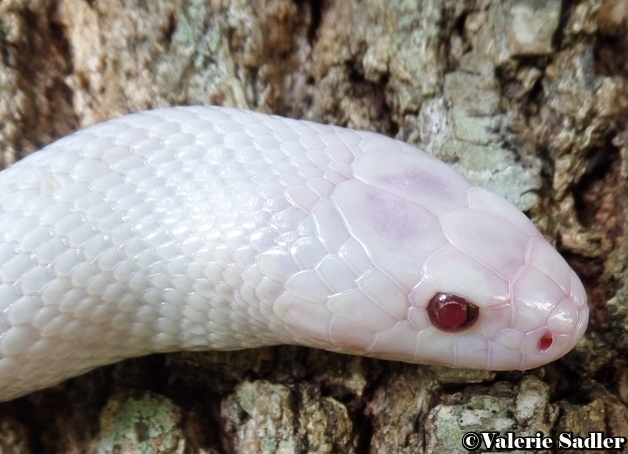 With Palomar ghost hets, most of them display more light pigment in their head patterns. on ghost head like this. 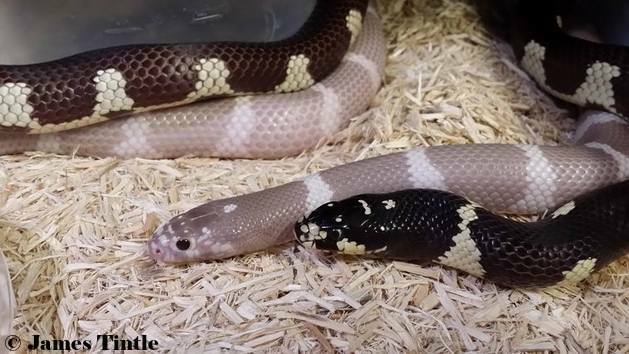 At 6:15 of this video you'll see some double homozygous Ghost X chocolate Cal kings. 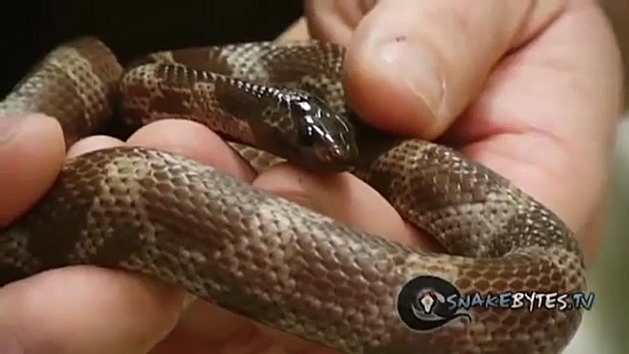 This video is from 2010 and I've never heard of these or have seen BHB sell them. ​to add a longer lifespan to the gene pool. This was back in the early 2000s." 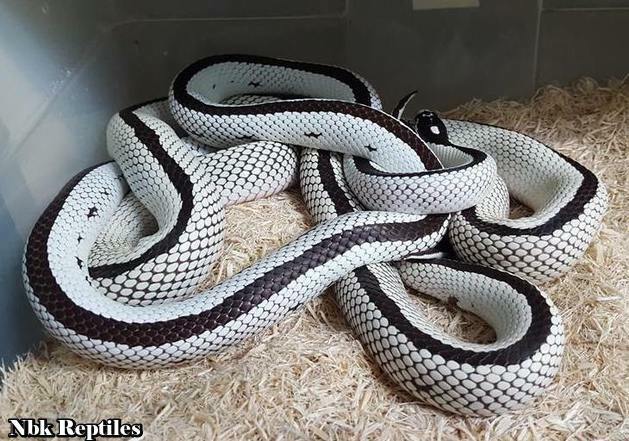 Sometimes kings are born like this, but its lost after a few sheds.